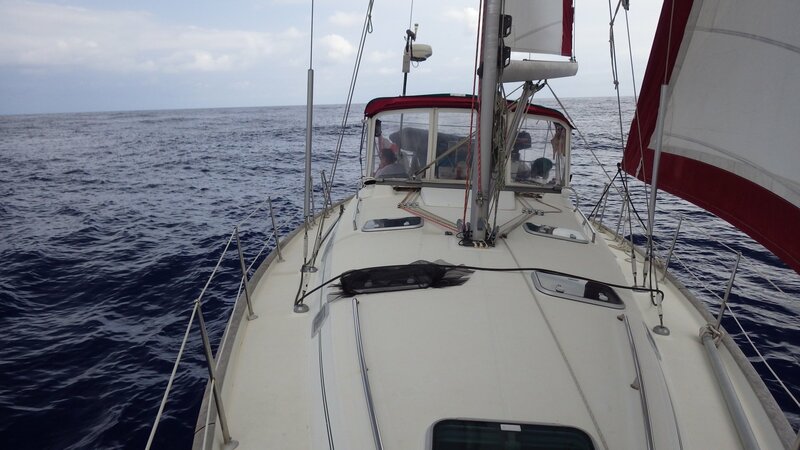 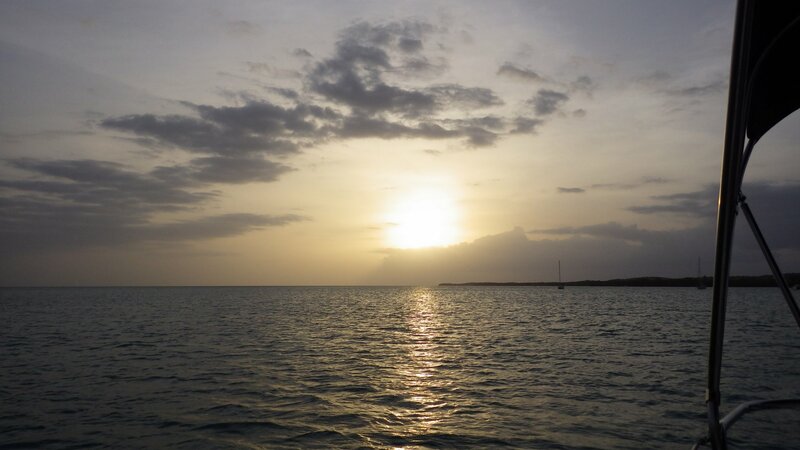 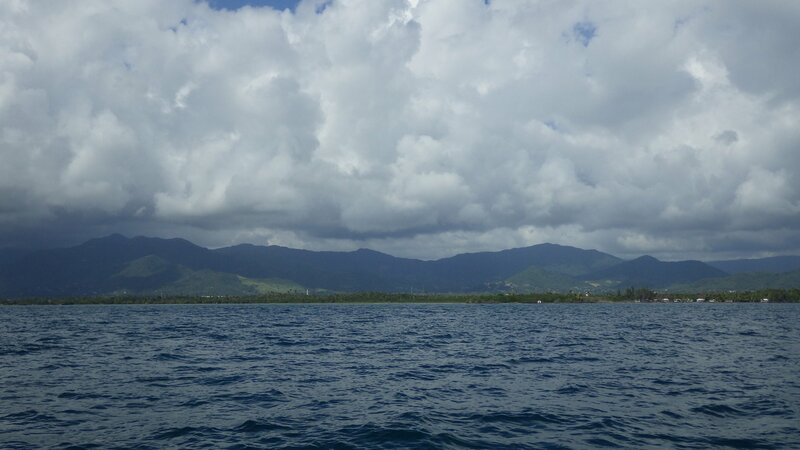 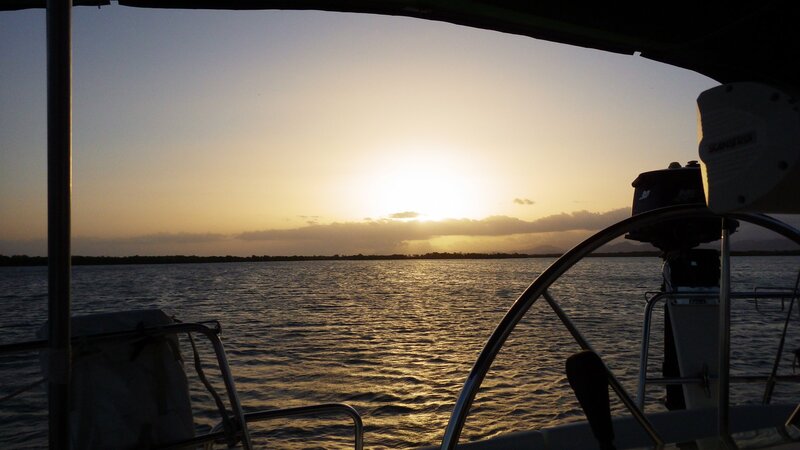 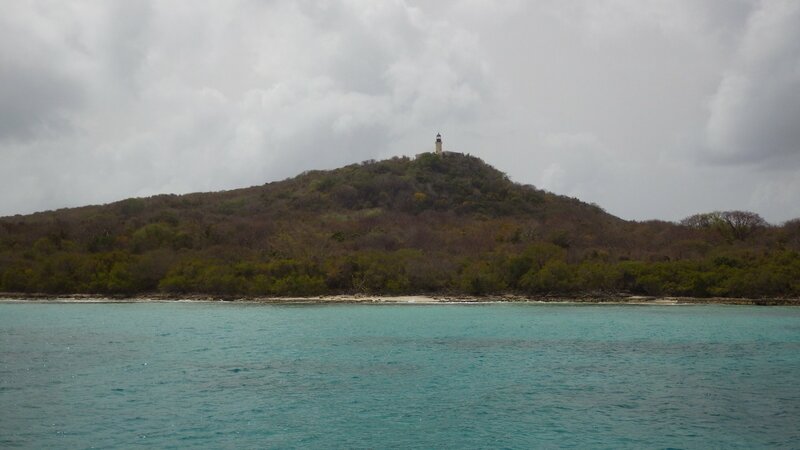 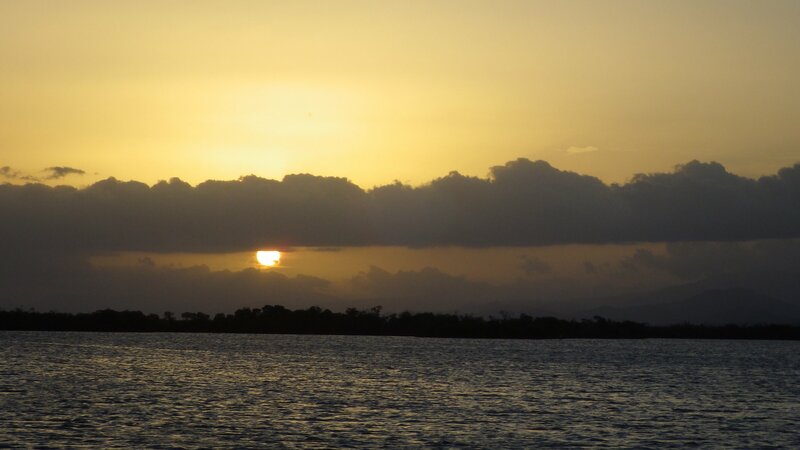 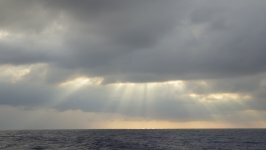 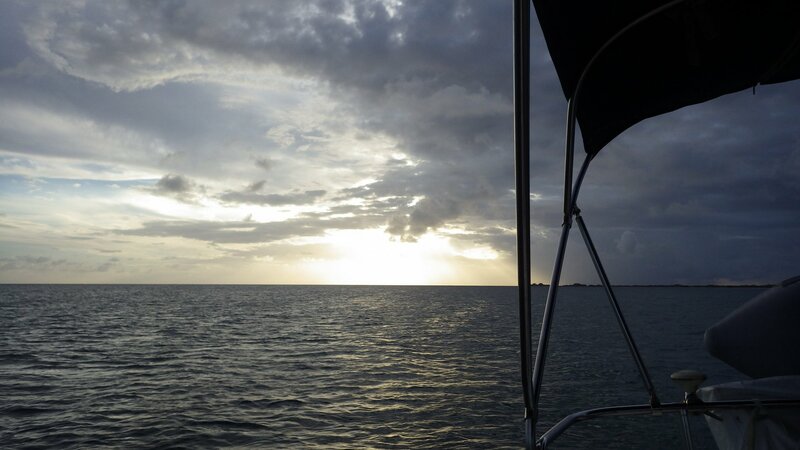 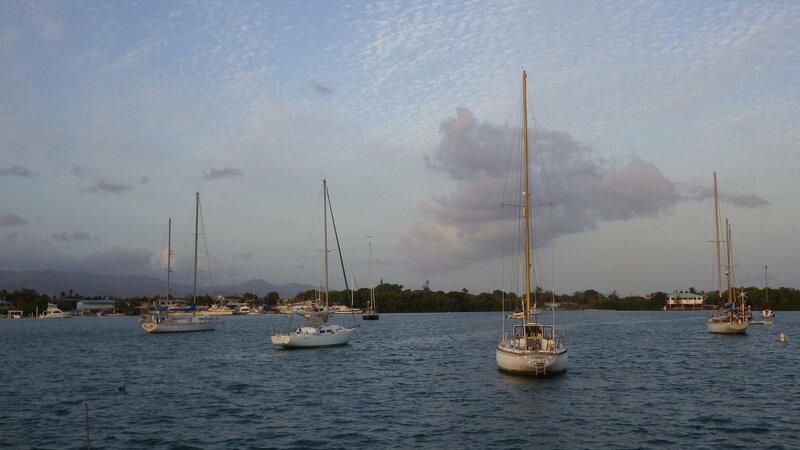 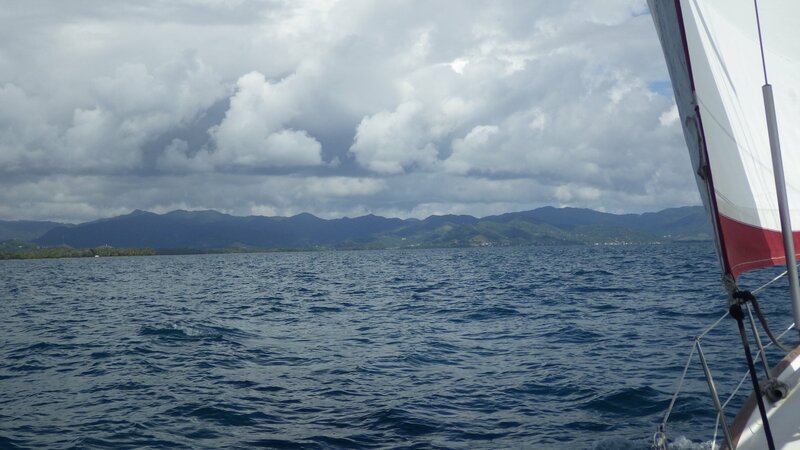 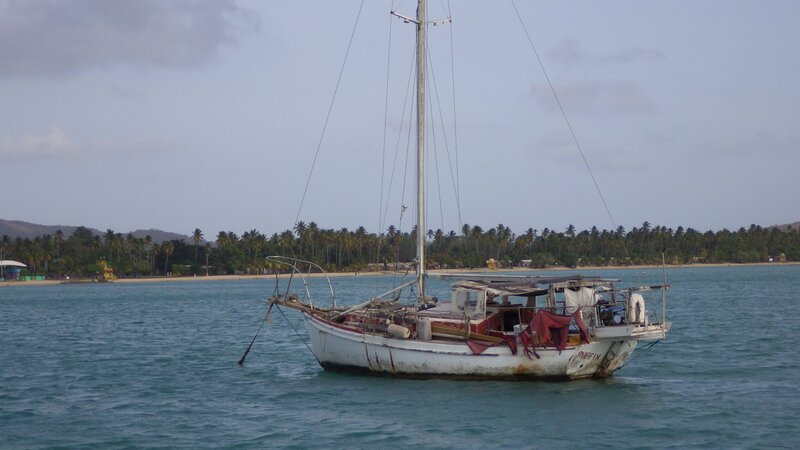 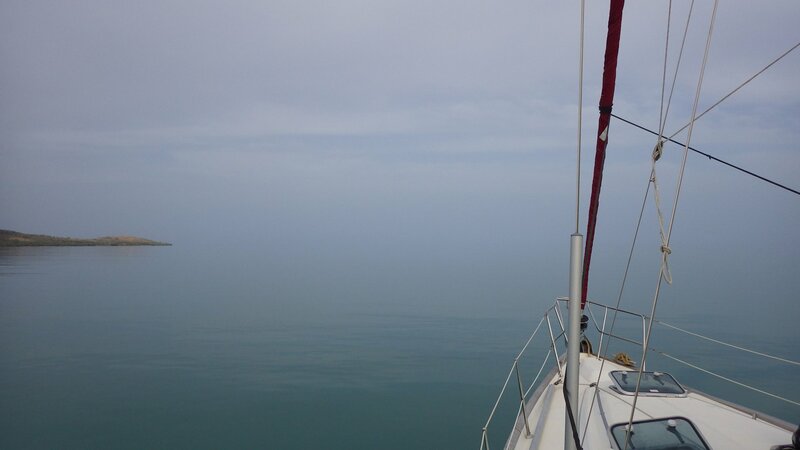 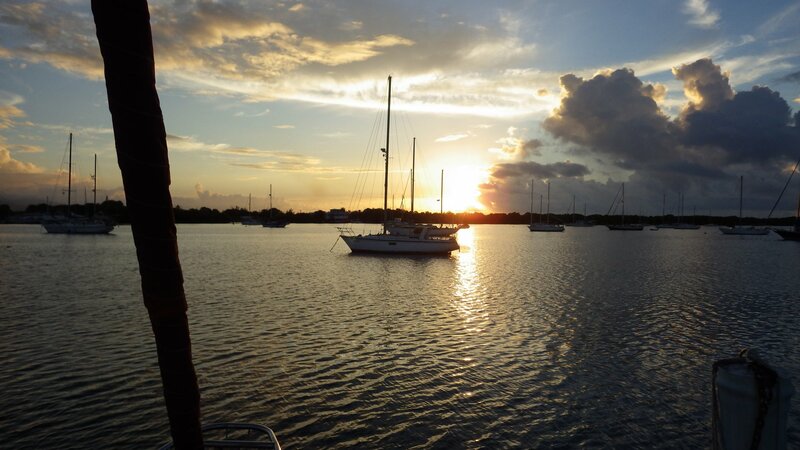 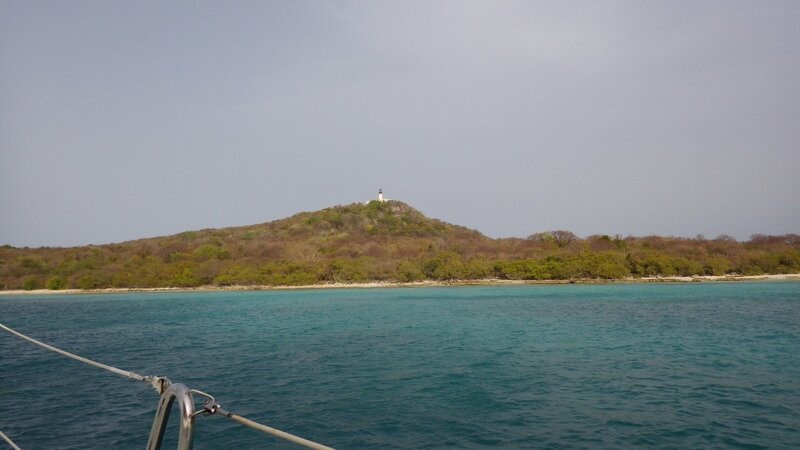 A day and a half motor-sail across the Mona Passage, between Dominican Republic and Puerto Rico. 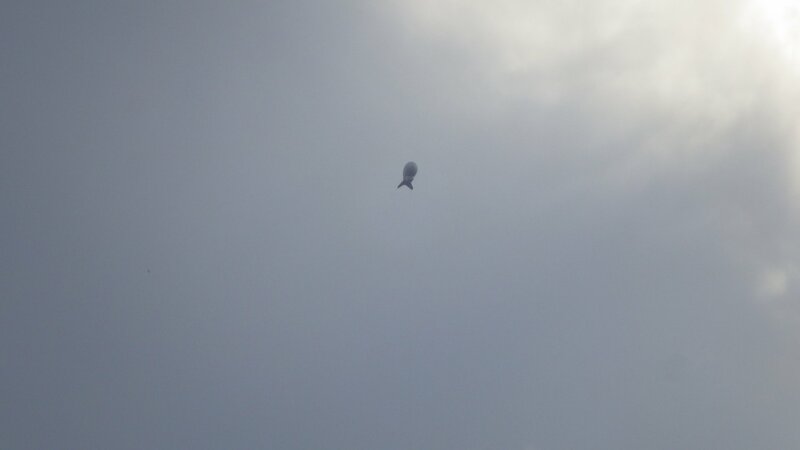 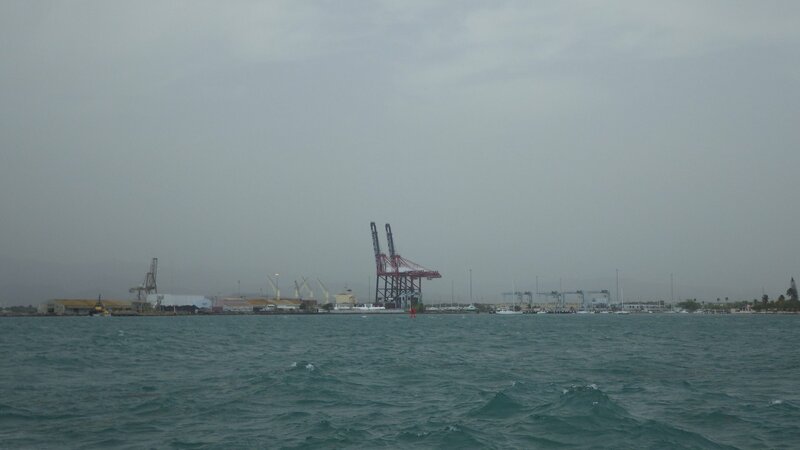 Weather planning was not bad � fairly calm travel conditions, only distant thunder and lightning. 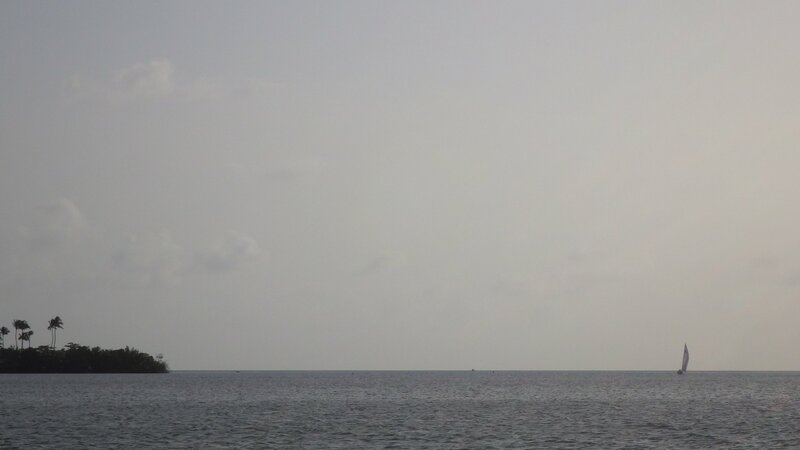 Not much happened. 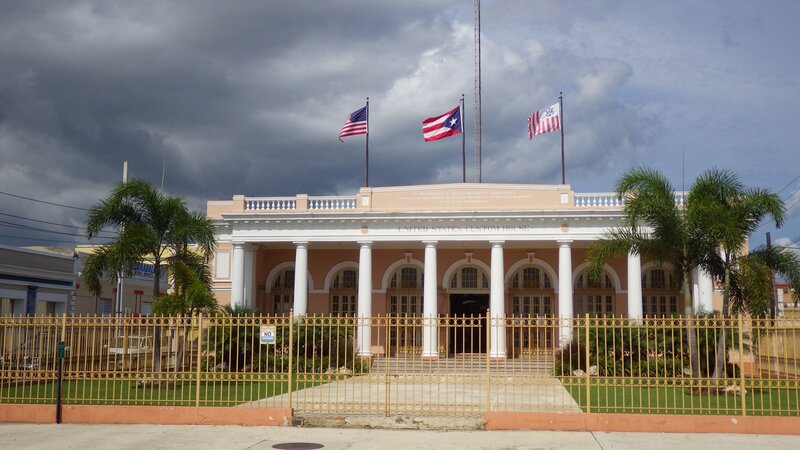 Arrived at Mayaguez, one of the Puerto Rico's official port of entry. 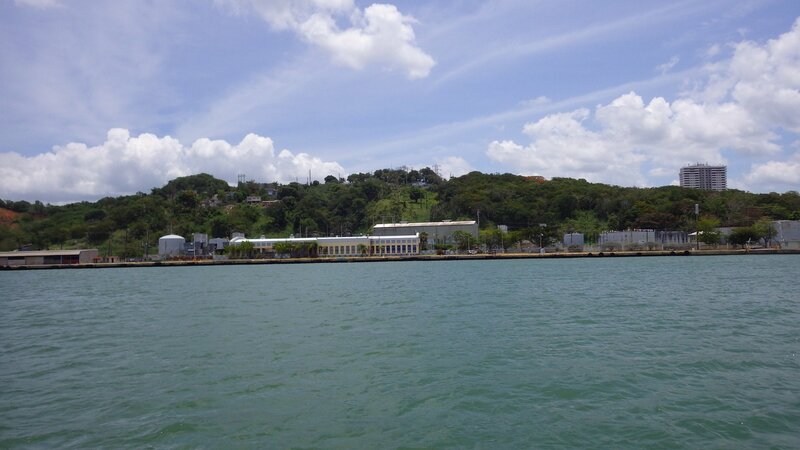 Cleared in with US Coast Guard / Border Control, Customs and Immigration. 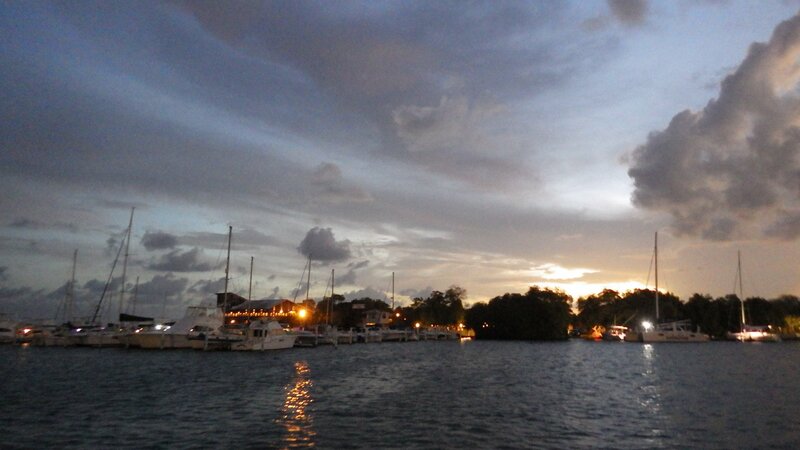 The city, at least the part where we anchored, is a bit too industrial and does not offer much to the cruiser. 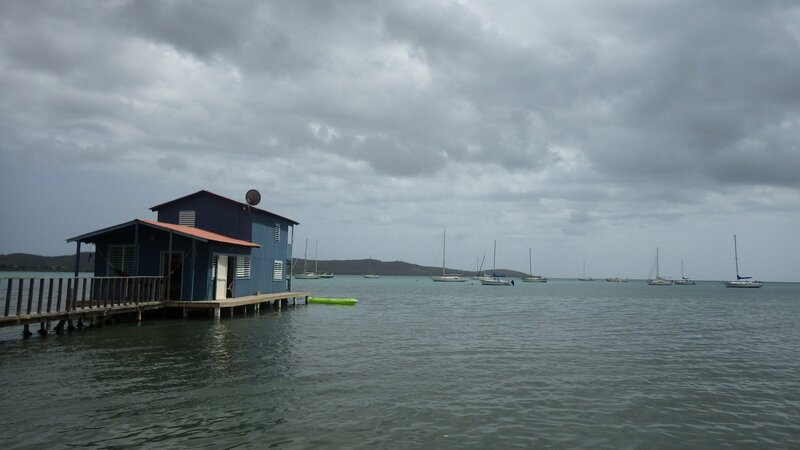 So after clearing formalities, walking around to see how people live, picking up some groceries and resting, we picked up the anchor and left. 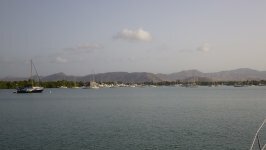 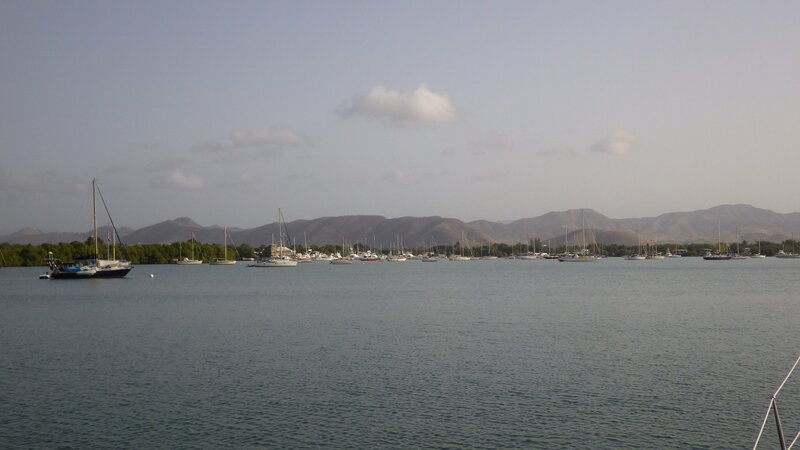 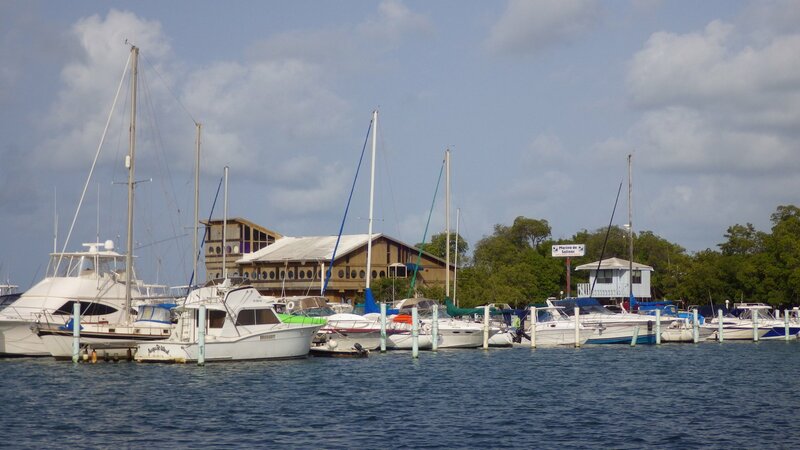 Puerto Real is a small fishing village inside a nice, small, well protected harbour. 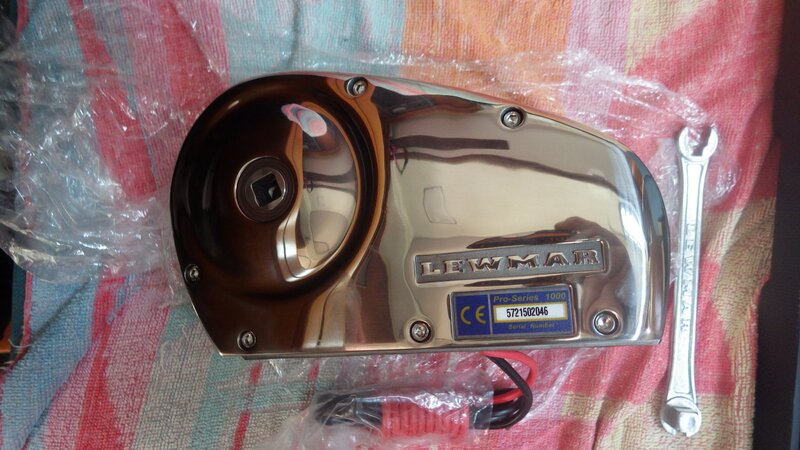 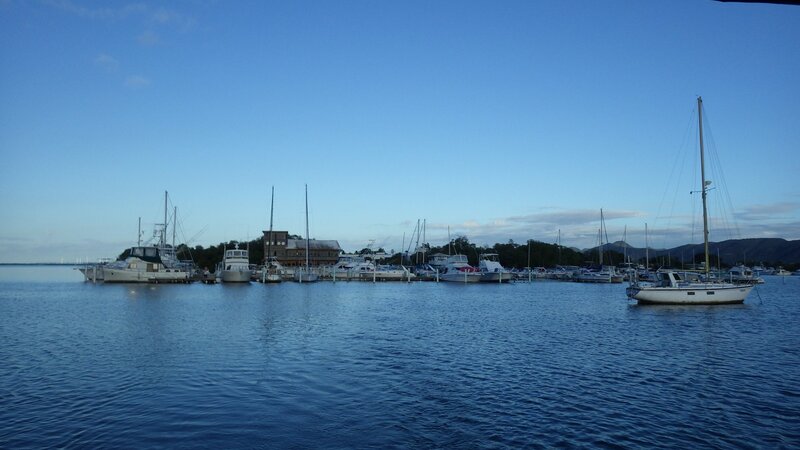 There is a good new marina where we filled our fuel and water tanks. 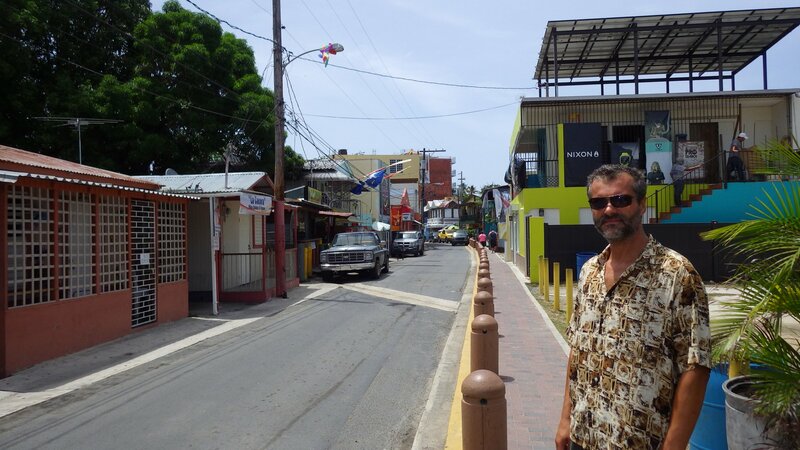 Visited small shops, got some fishing line and lures, walked around the village. 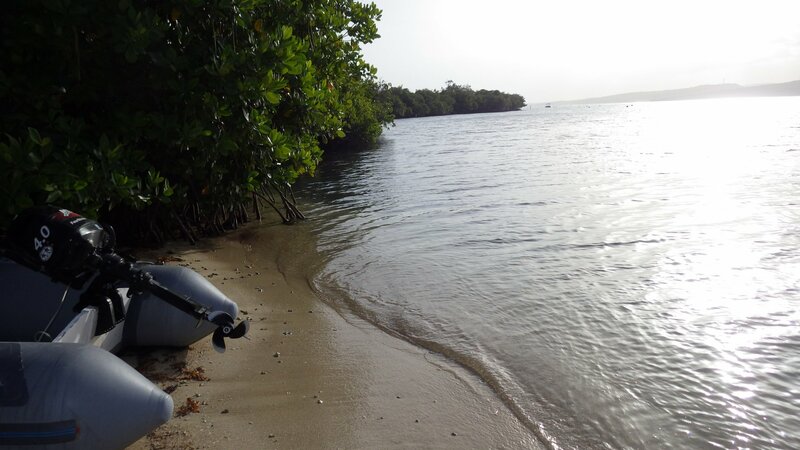 Second day stayed at the boat, did repairs to the depths sounder and other boat projects. 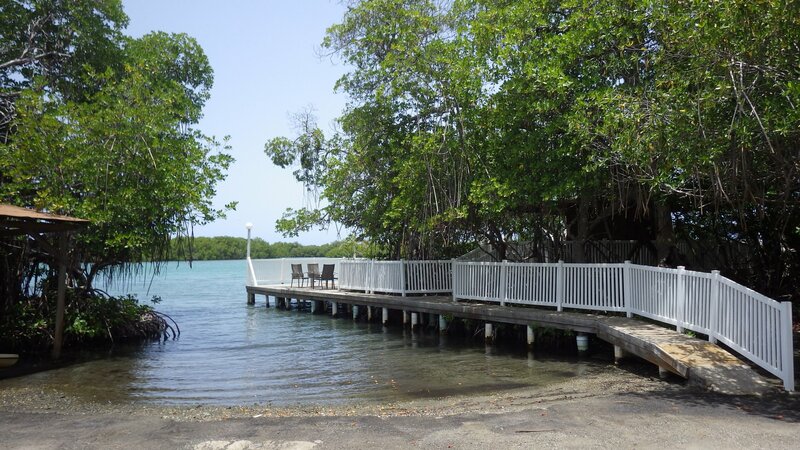 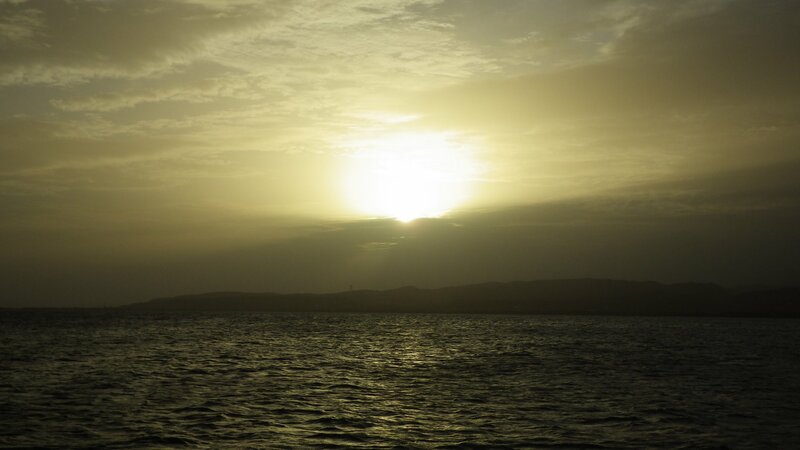 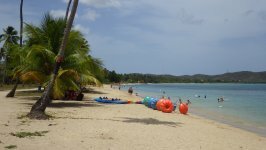 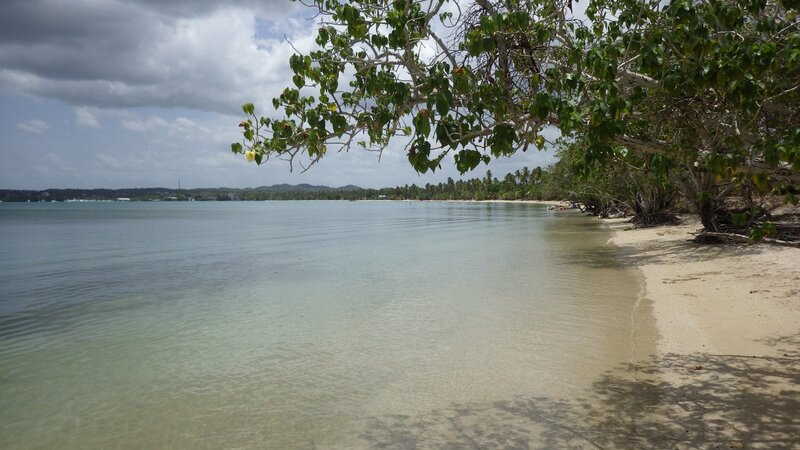 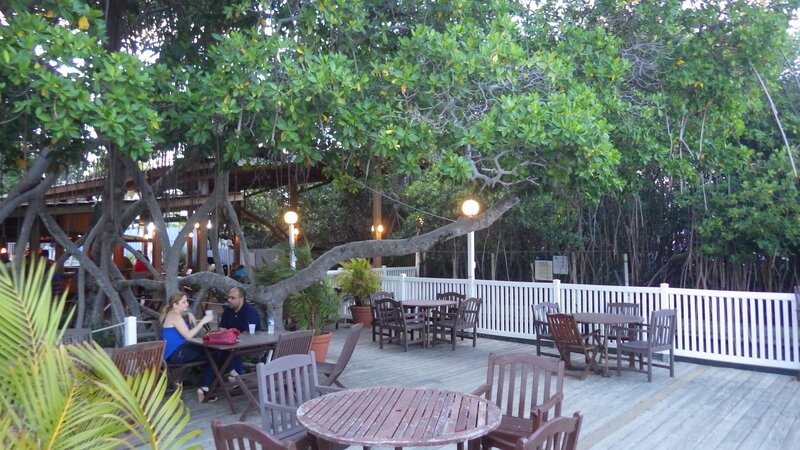 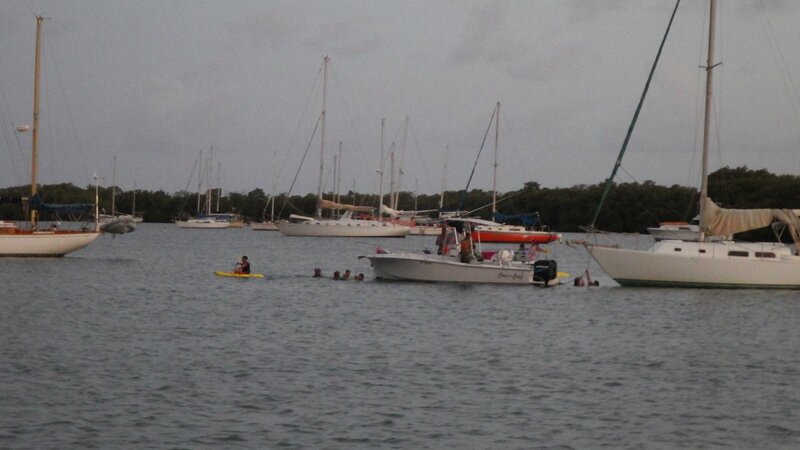 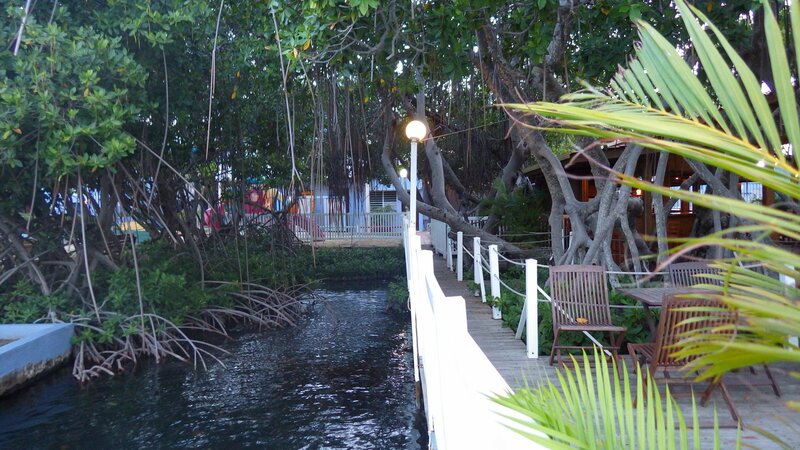 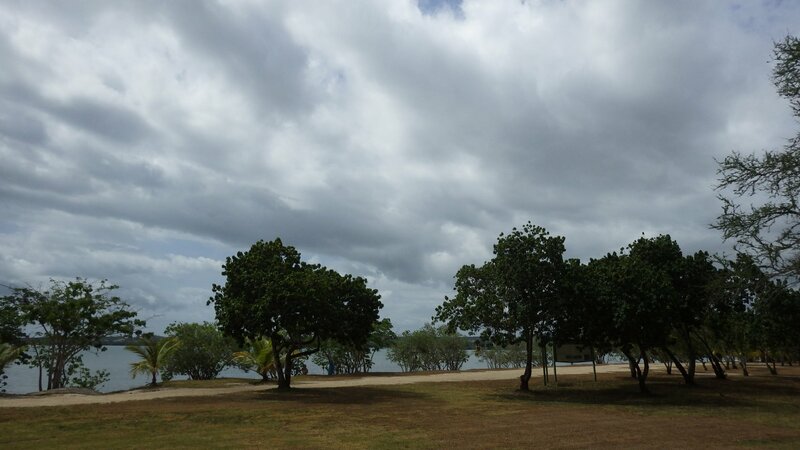 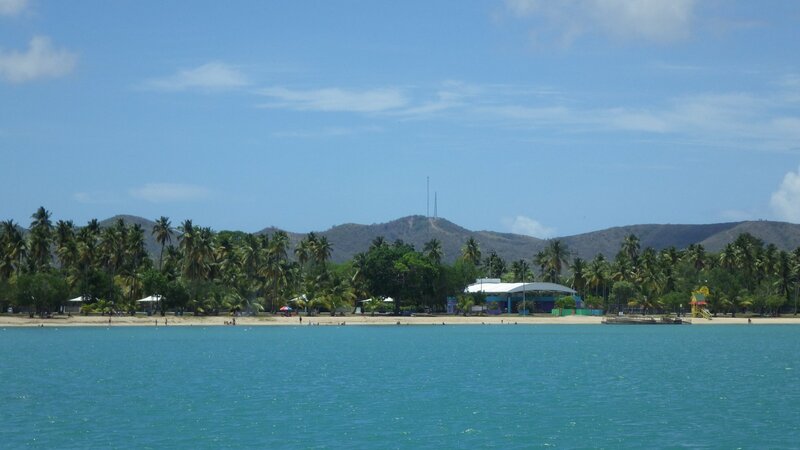 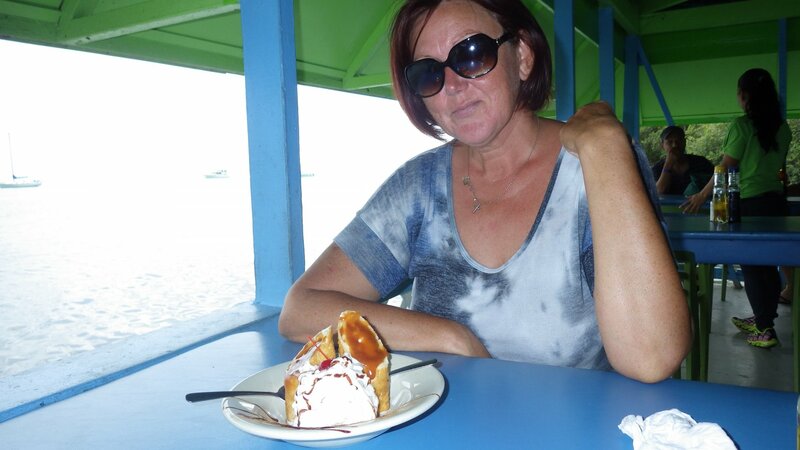 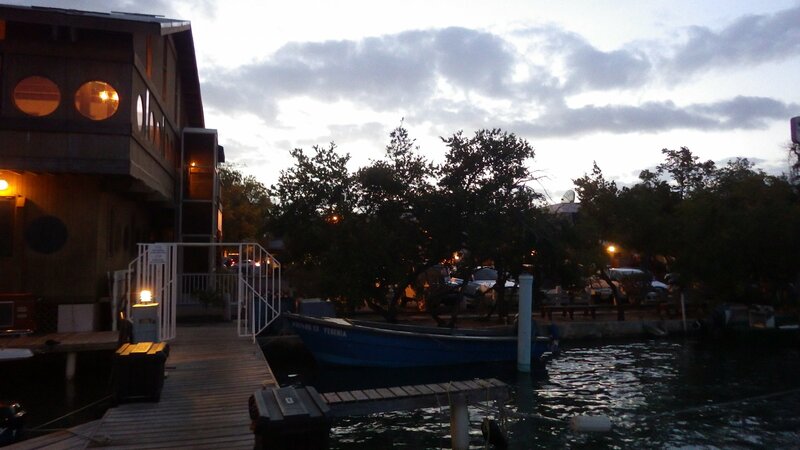 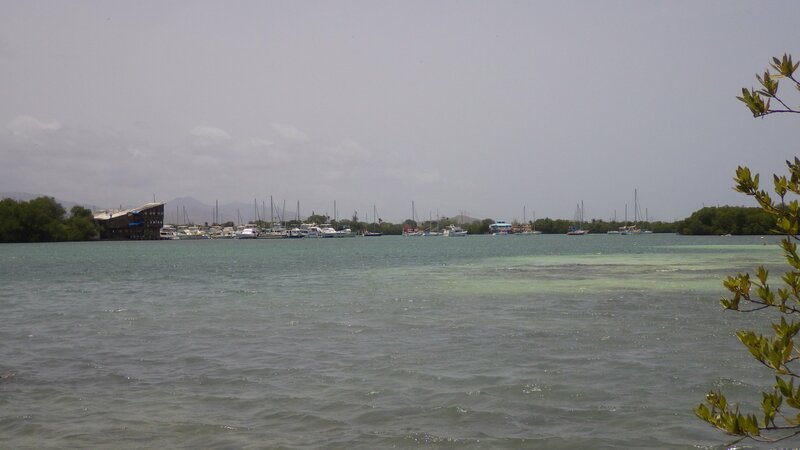 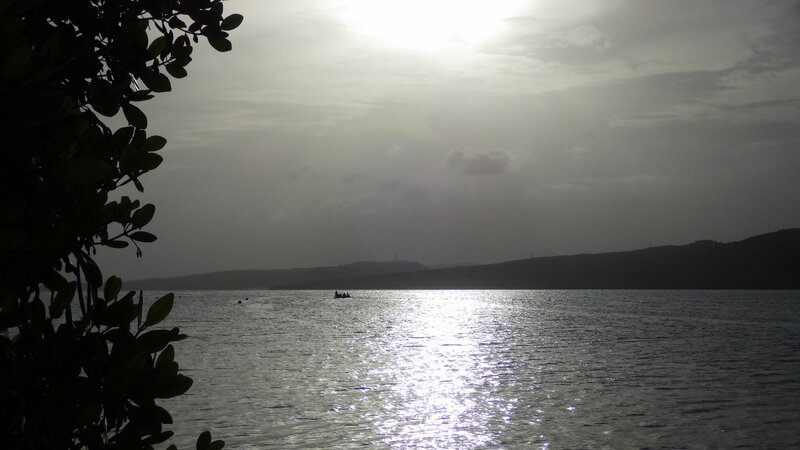 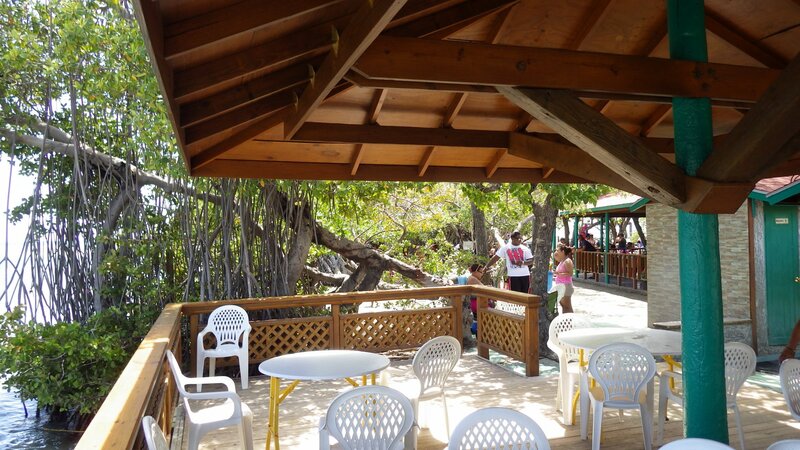 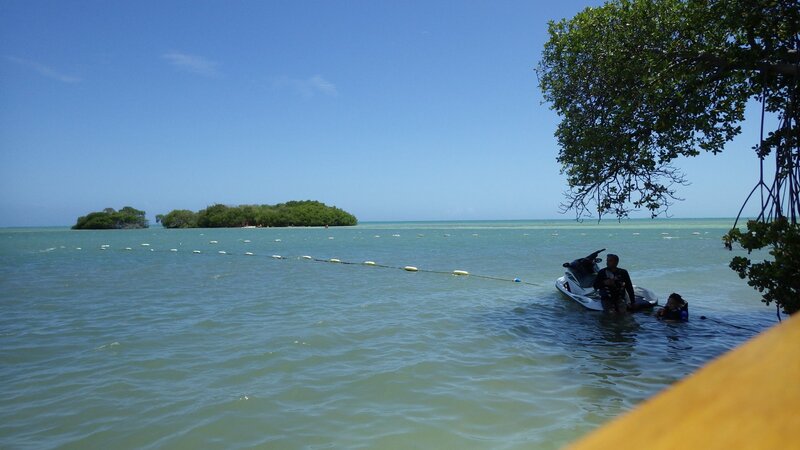 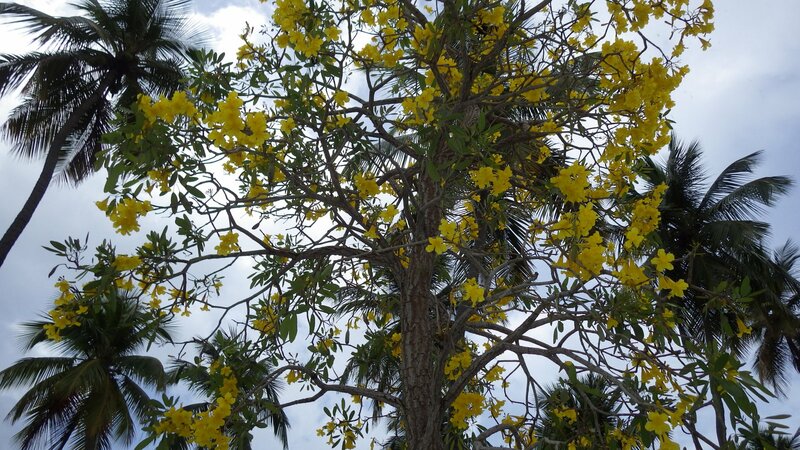 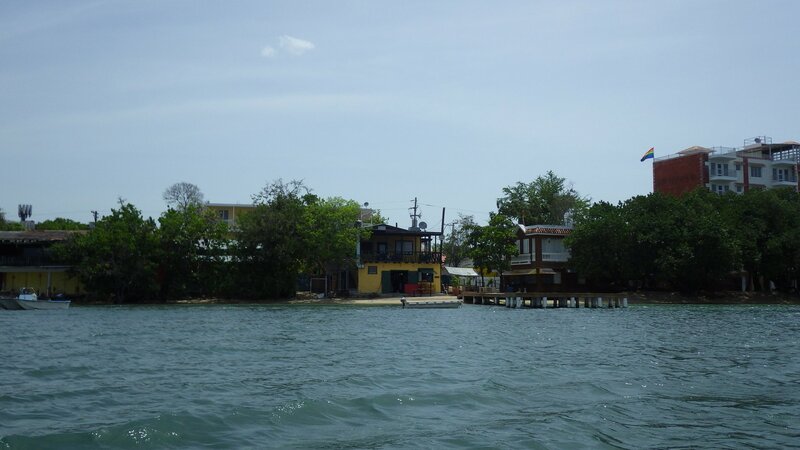 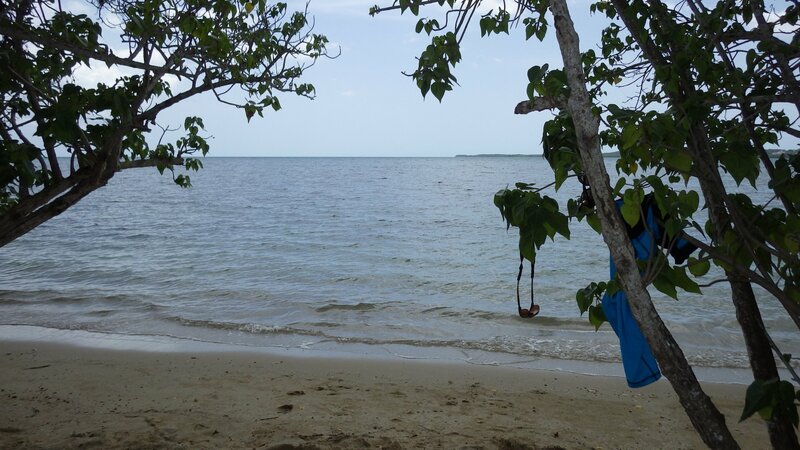 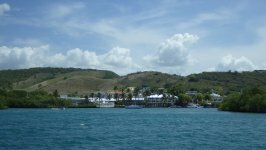 Stayed few days at Boqueron. 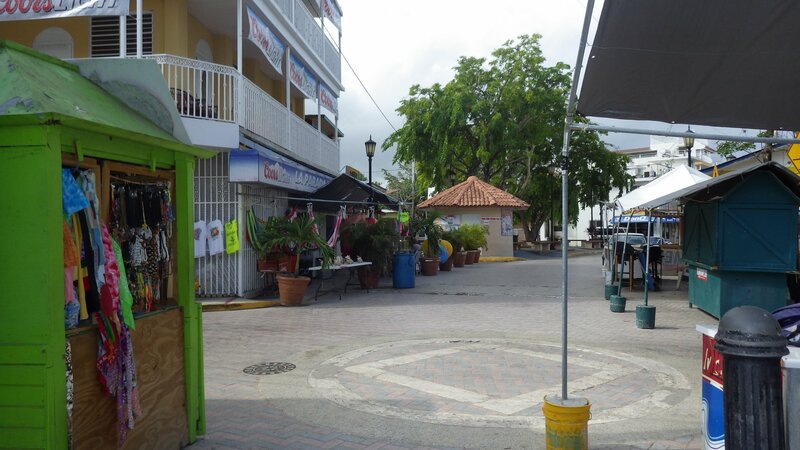 The place is sleepy during the week, but turns into a party town during the weekend. 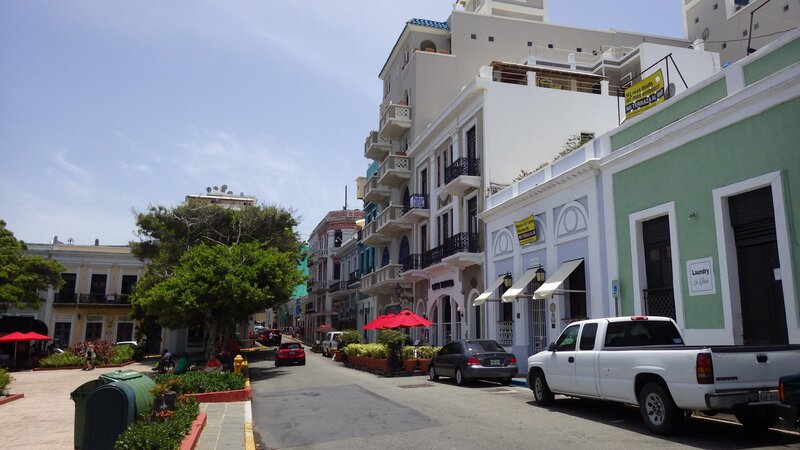 It's mostly bars and restaurants in the town, and a great long beach. 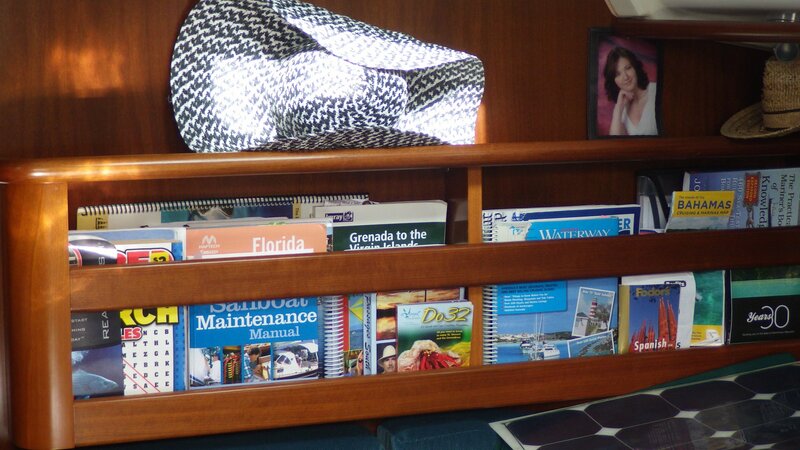 Unfortunately, few places mentioned in the cruising guides (marine and grocery shops, post office, laundry) are no longer there. 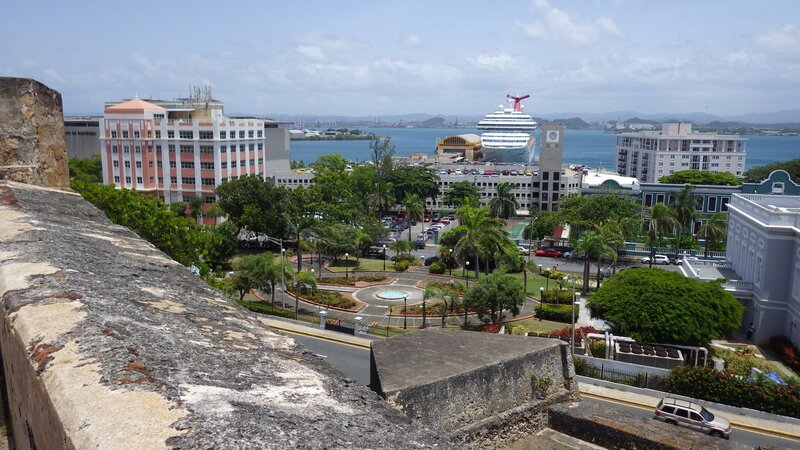 We had a good time in this town. 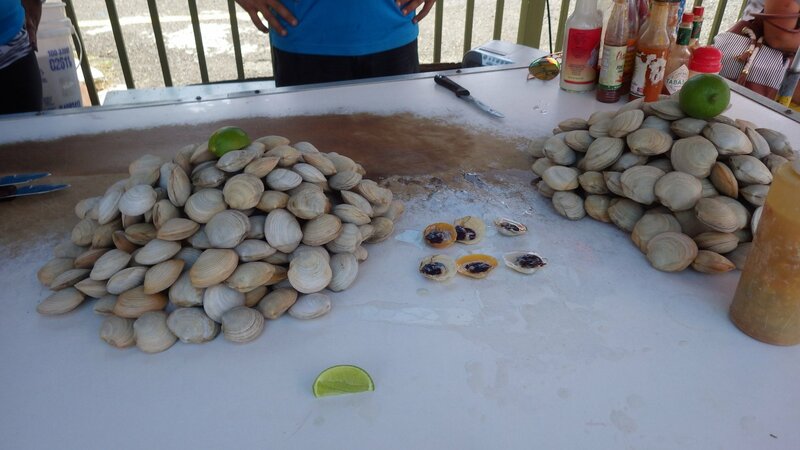 Tried fresh raw scallops and oysters at the street place. 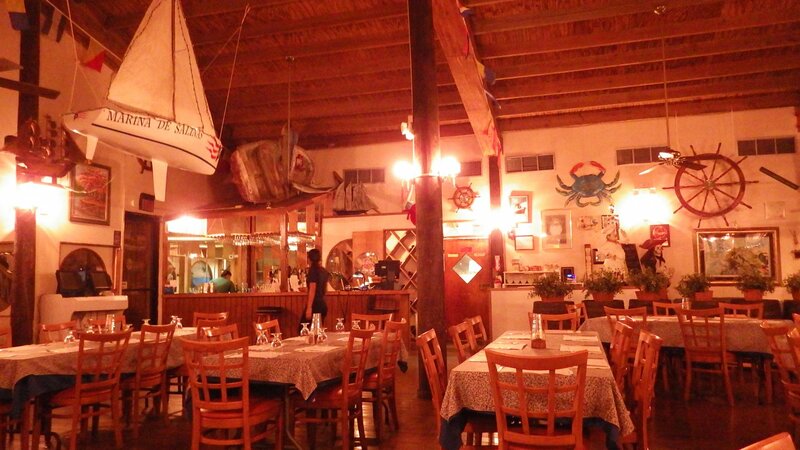 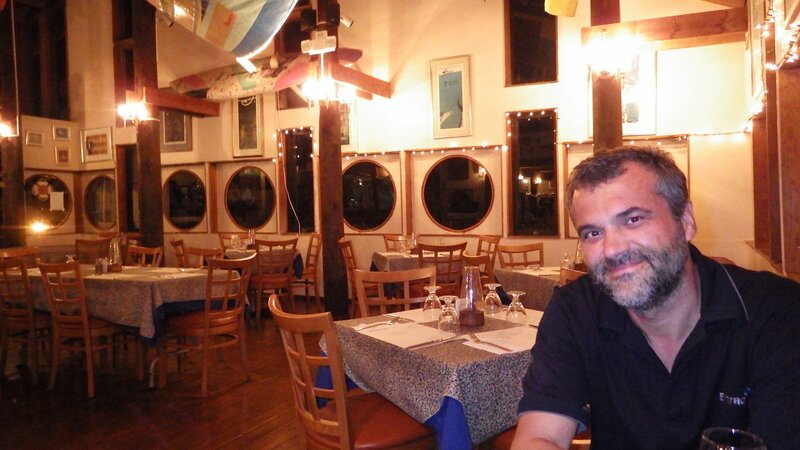 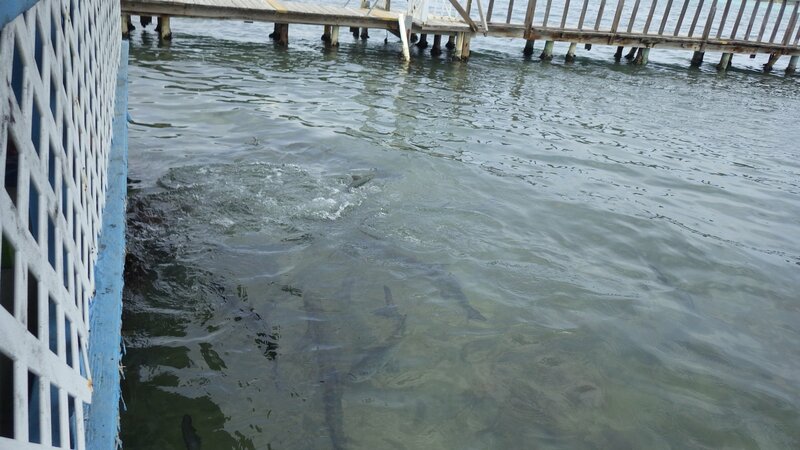 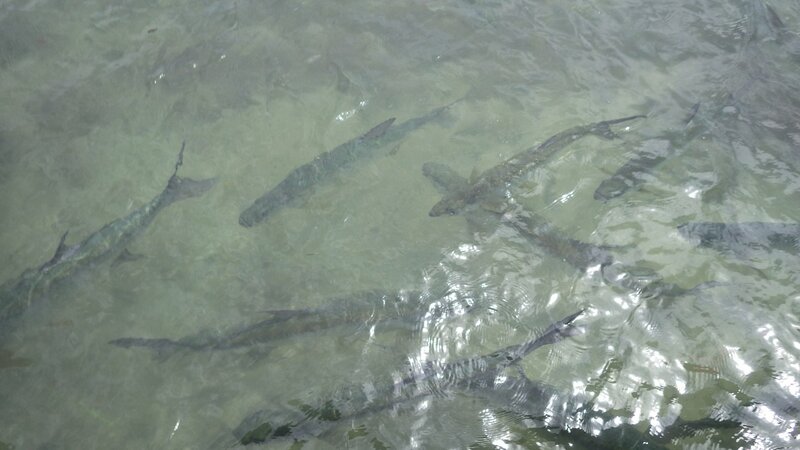 Visited a nice waterfront restaurant - good seafood, and you can feed the fish swimming beside. 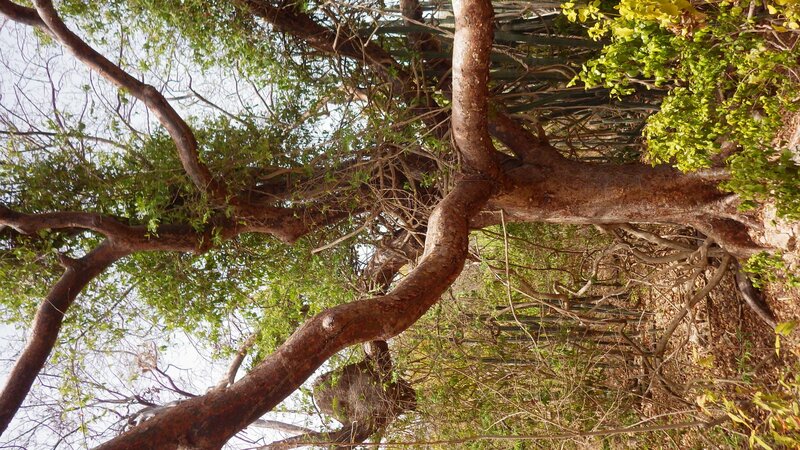 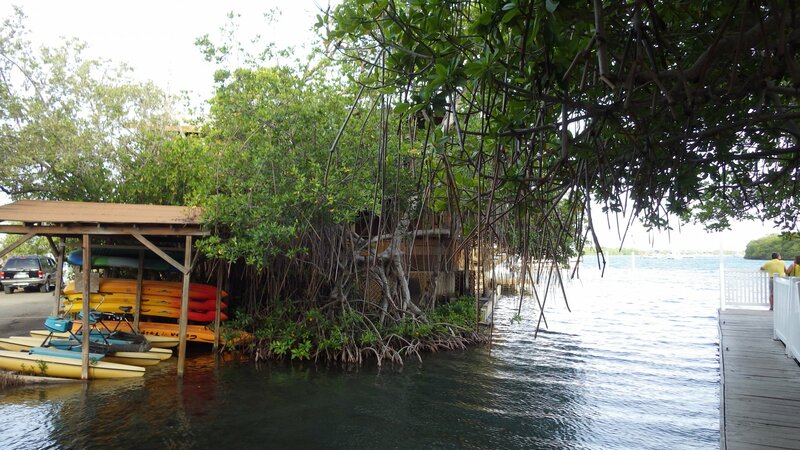 Walked around, visited a mangrove park, bough some souvenirs for home. 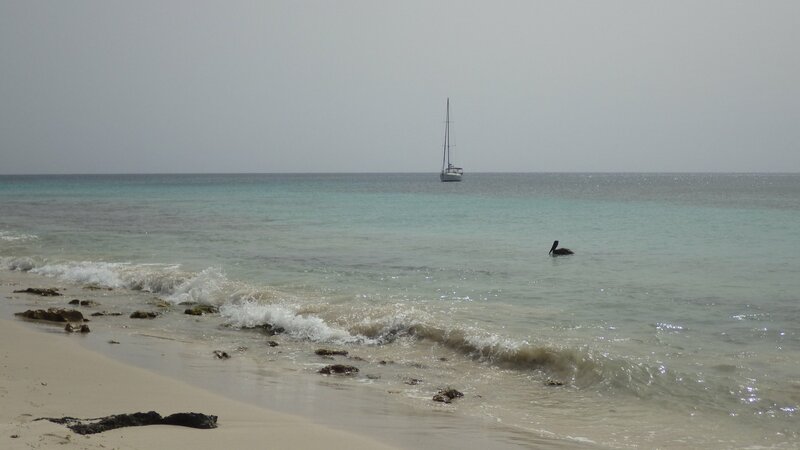 We then spent an amazing day at the beach. 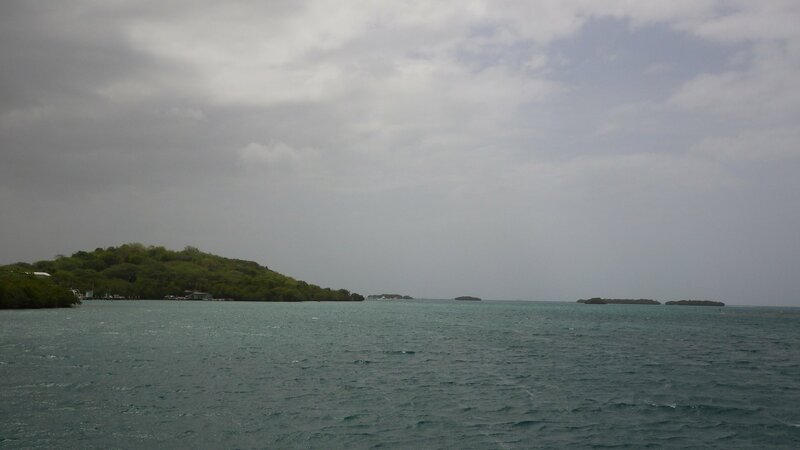 It was rainy at times, but the water was warm and it was really nice to swim there. 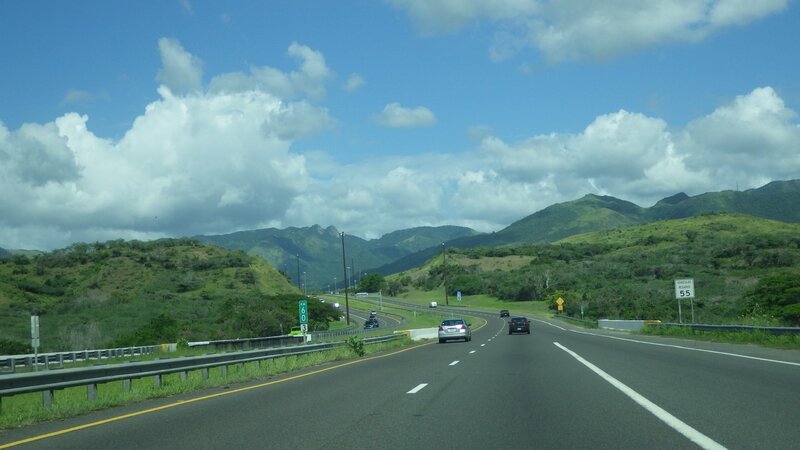 On the way home (i.e. 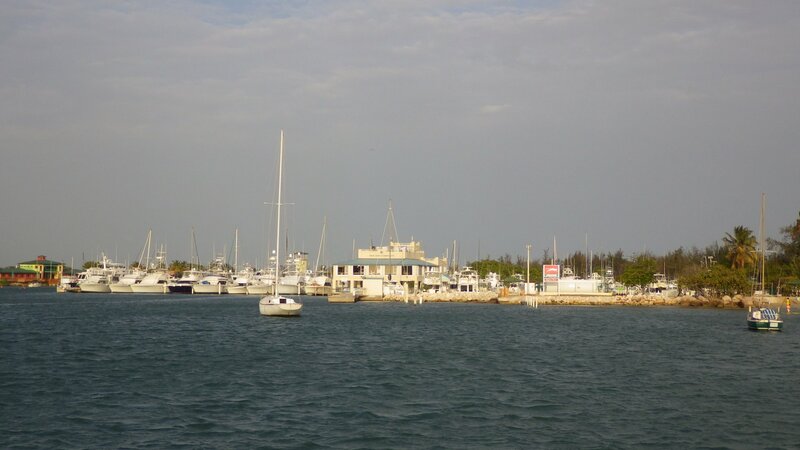 to the yacht) we were hungry, followed the smell from one of the bars - sat down for a snack with the local beer, watching people having good time and day coming to the end. 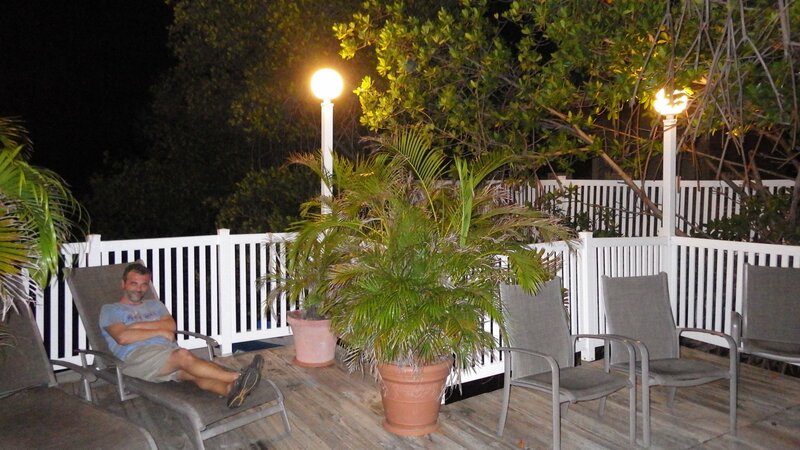 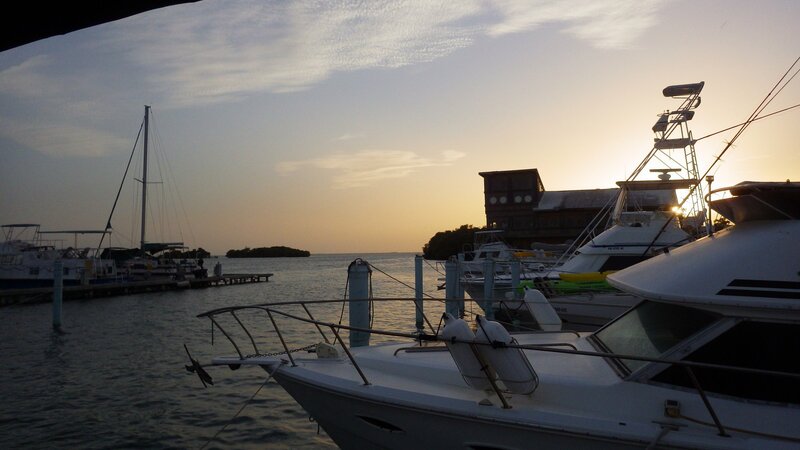 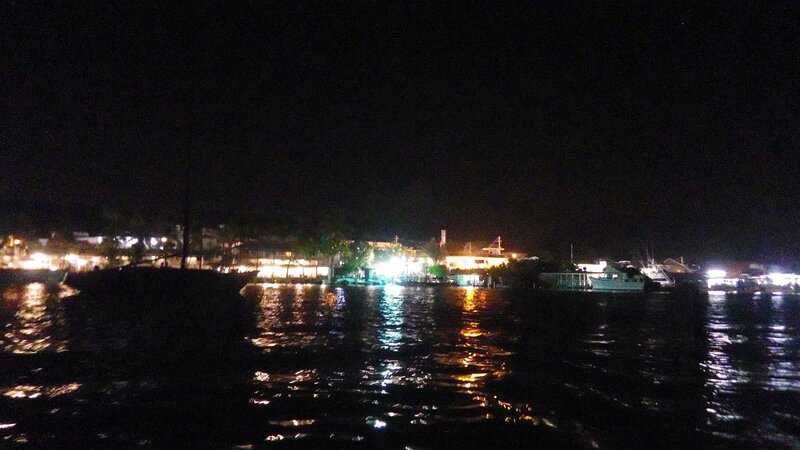 At night at the yacht - more drinks with the dinner, with live music coming from the shore. 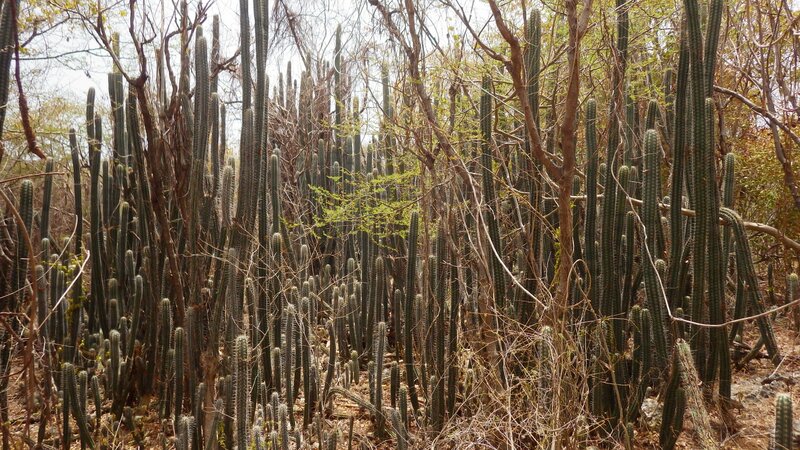 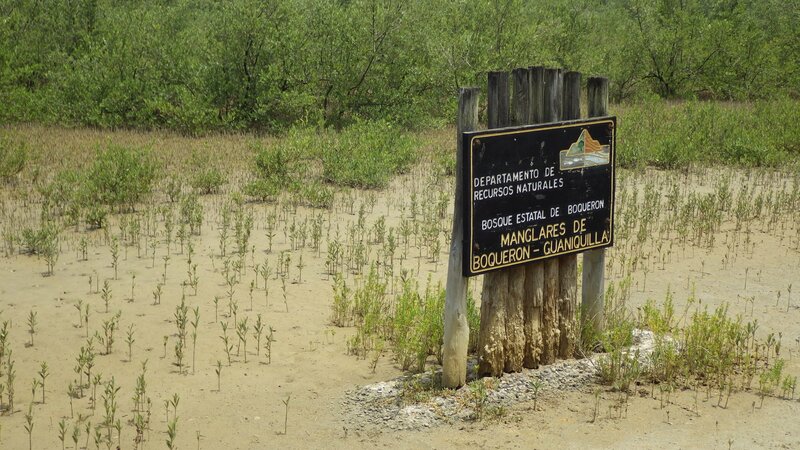 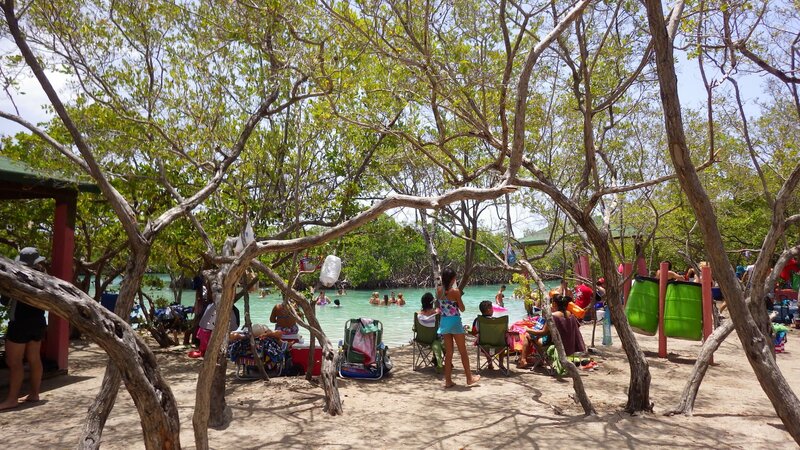 A quick overnight stop staging our pass around the treacherous Cabo Rojo. 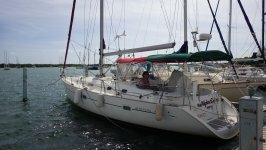 Not a pleasant stop � anchorage was rolly because the surge coming around the cape, and the awful smell coming from the nearby salt pond was waking me up during the night. 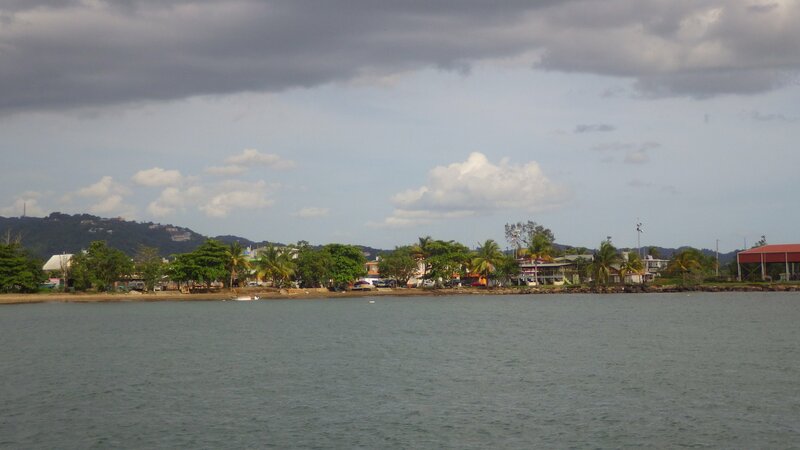 Stayed few days at La Parguera. 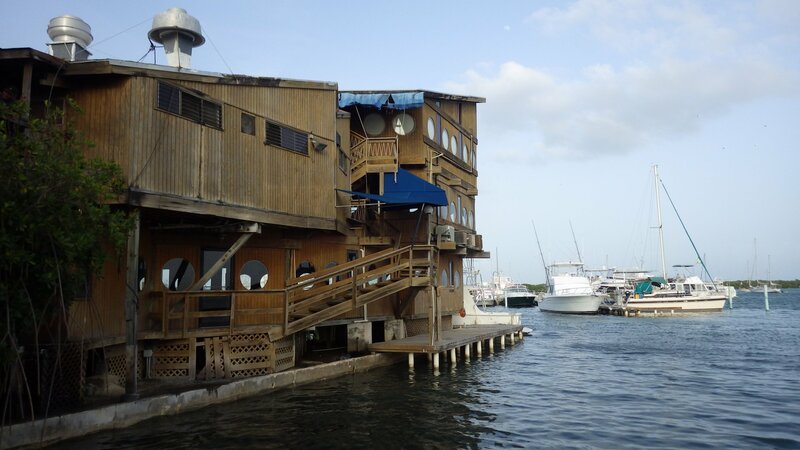 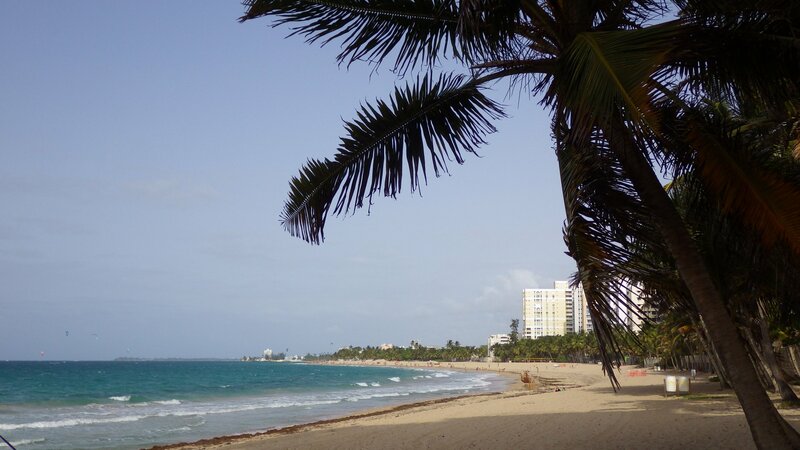 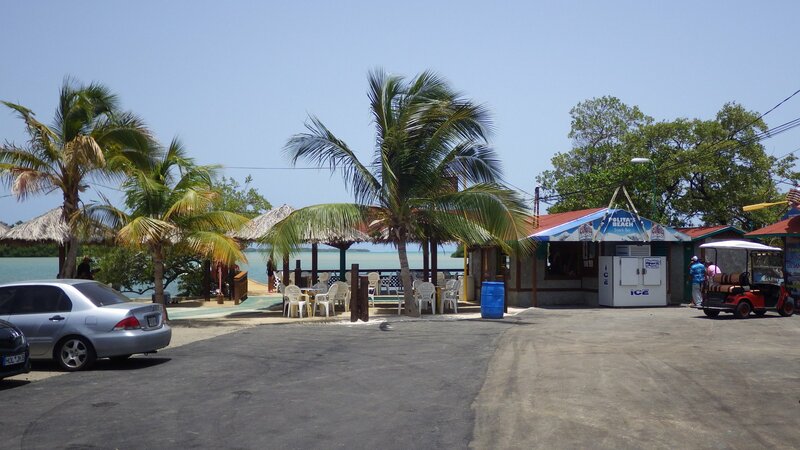 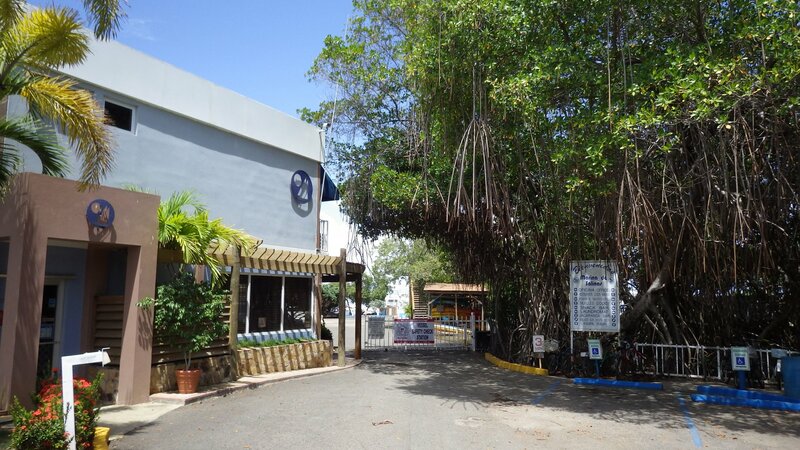 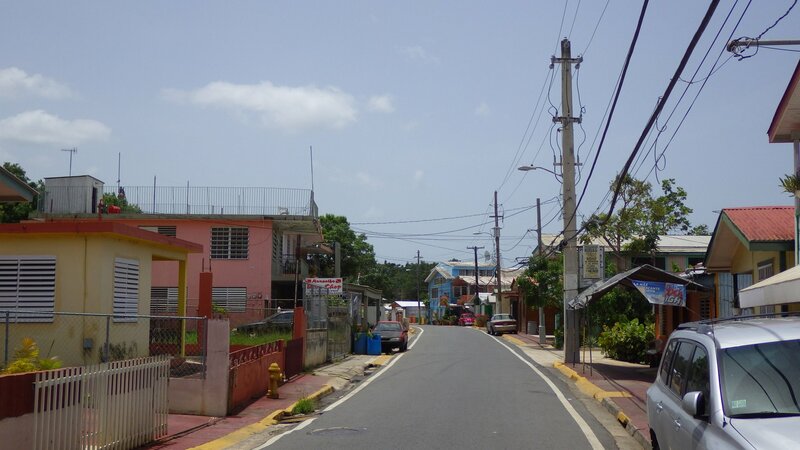 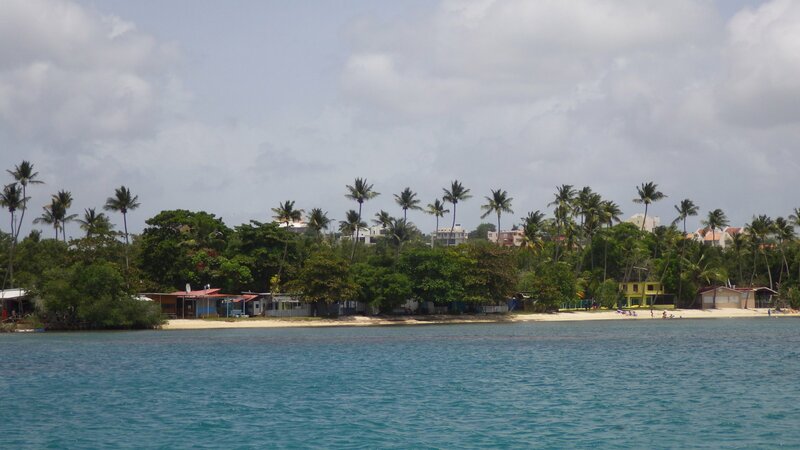 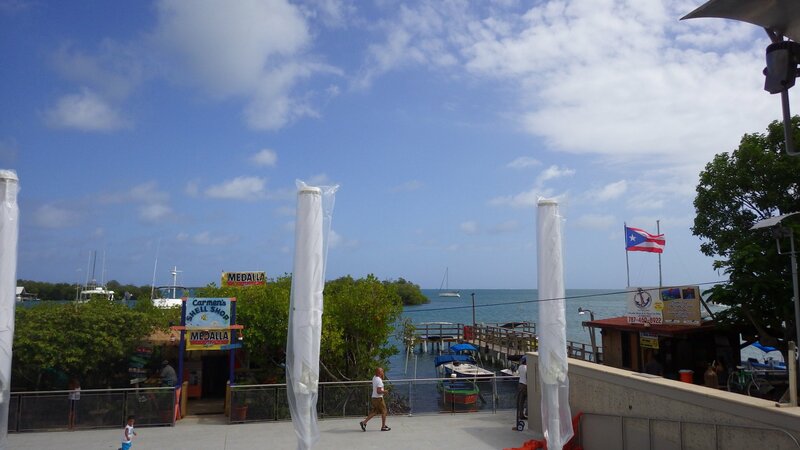 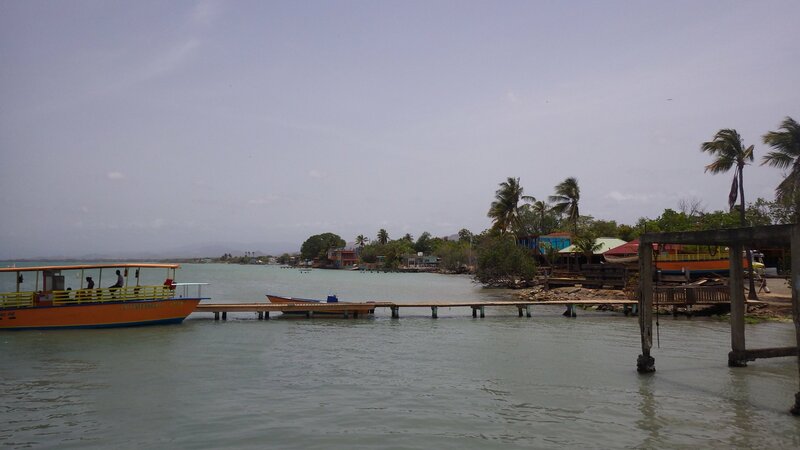 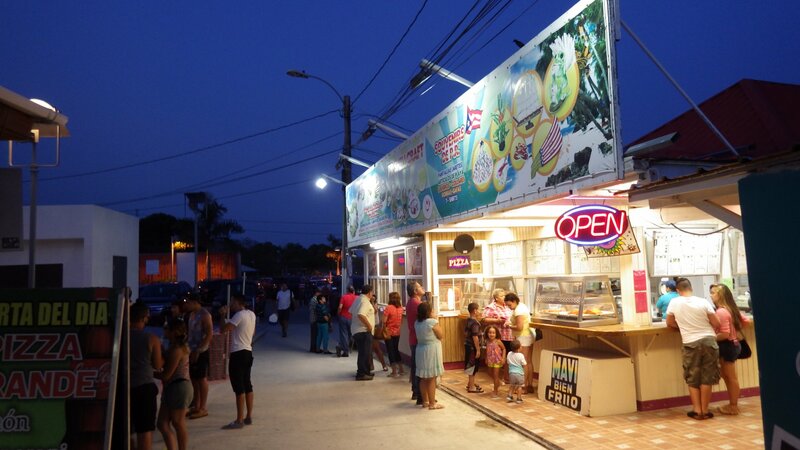 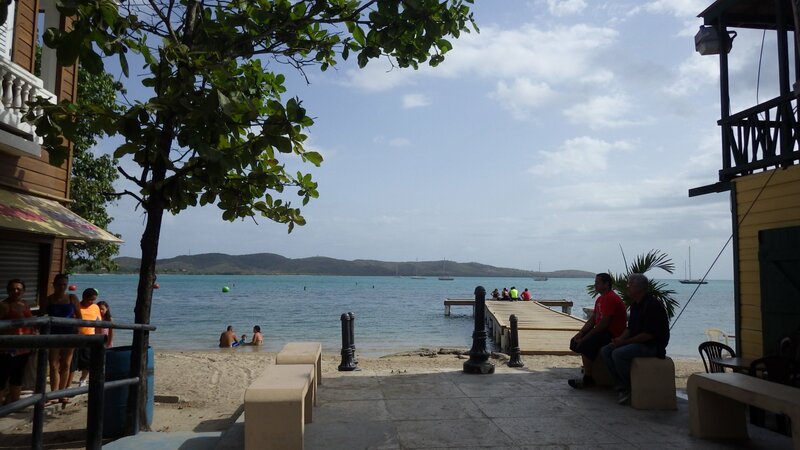 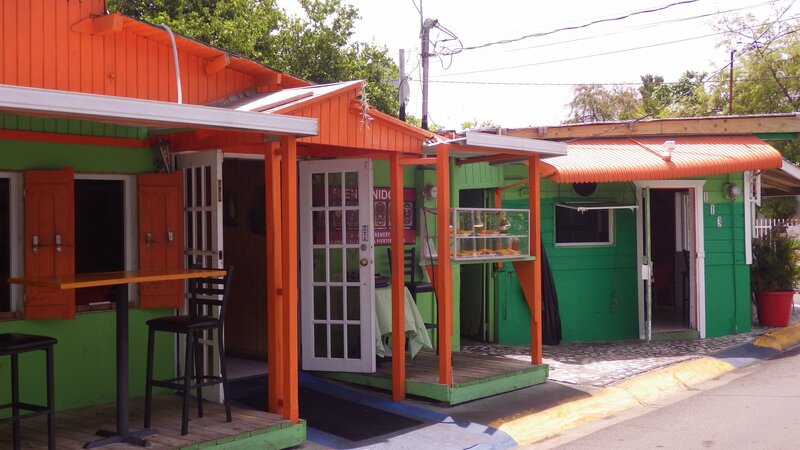 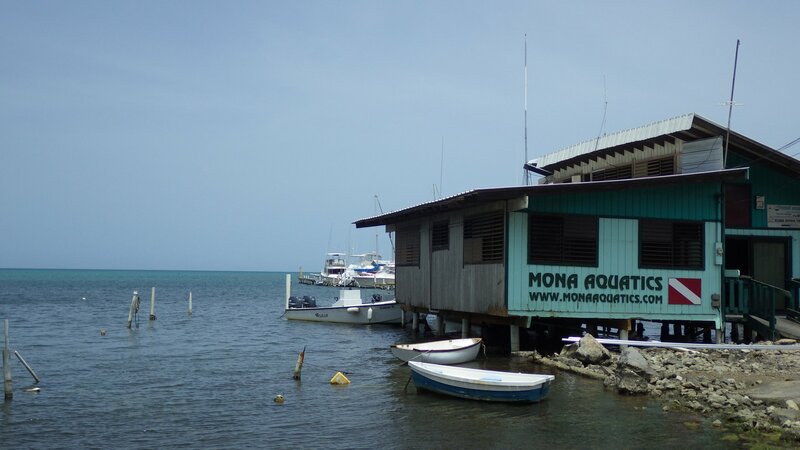 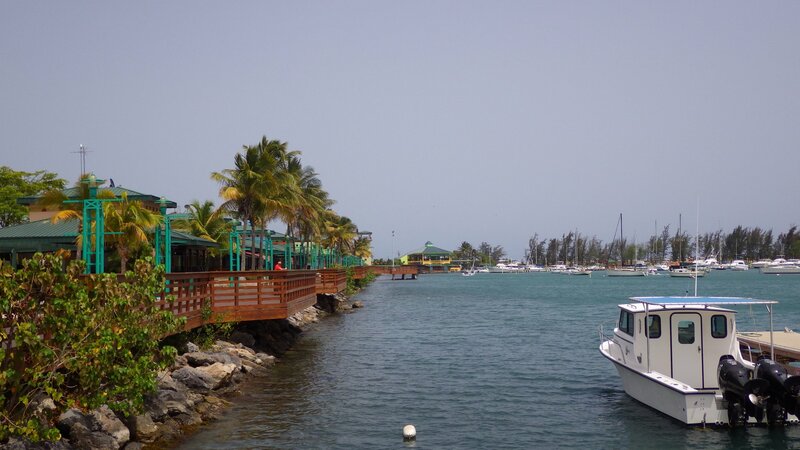 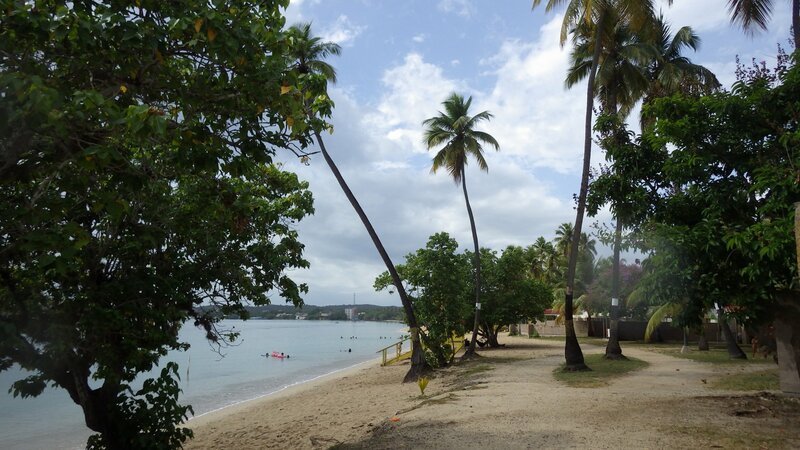 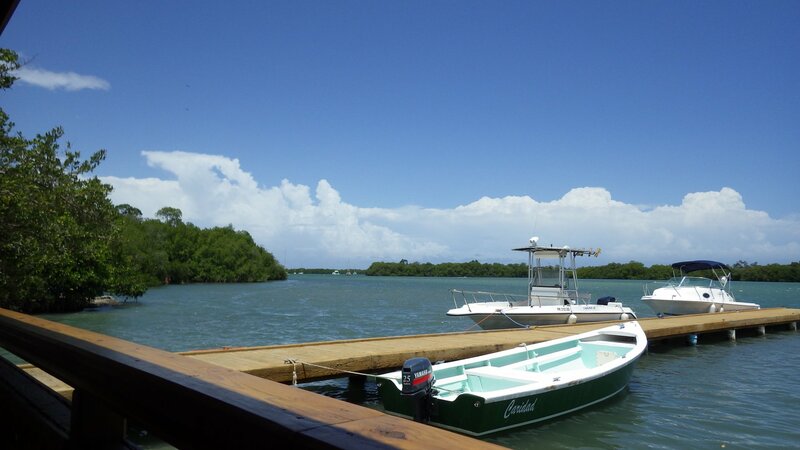 Similarly to Boqueron, it is a shore weekend getaway town for Puerto Ricans. 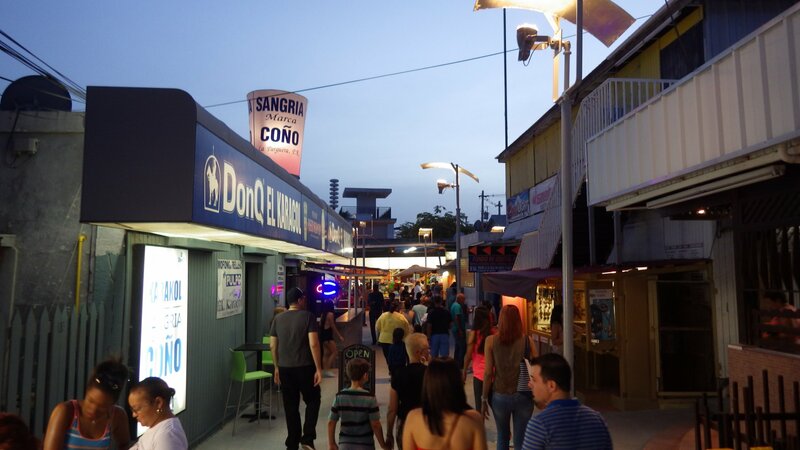 Many bars and restaurants, souvenir stands, etc. 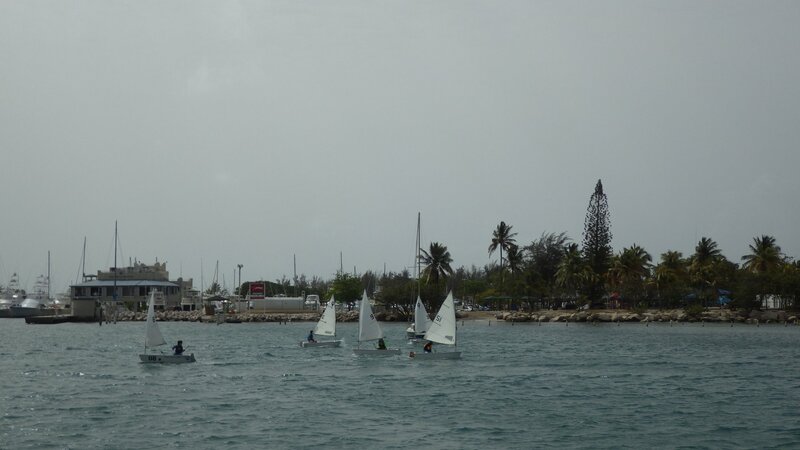 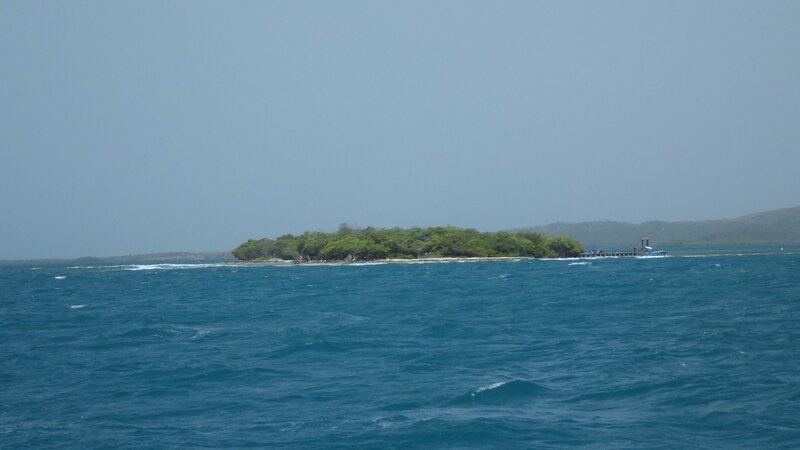 Several reef islands and lots of water activity around. 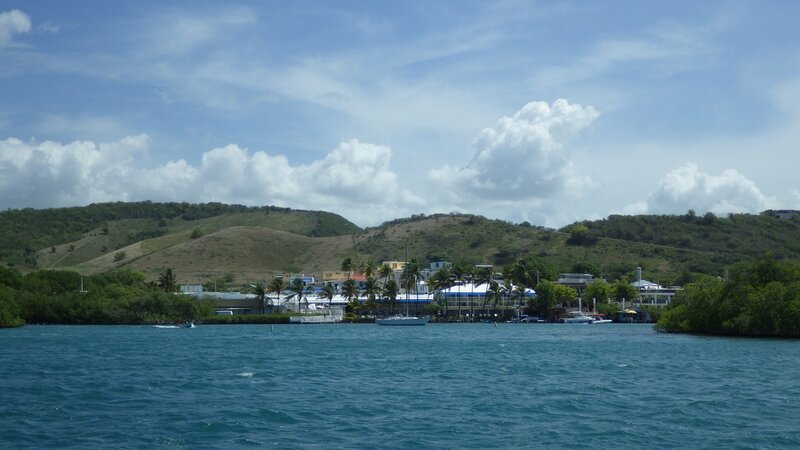 Also there are two marine supply stores and a decently stocked supermarket. 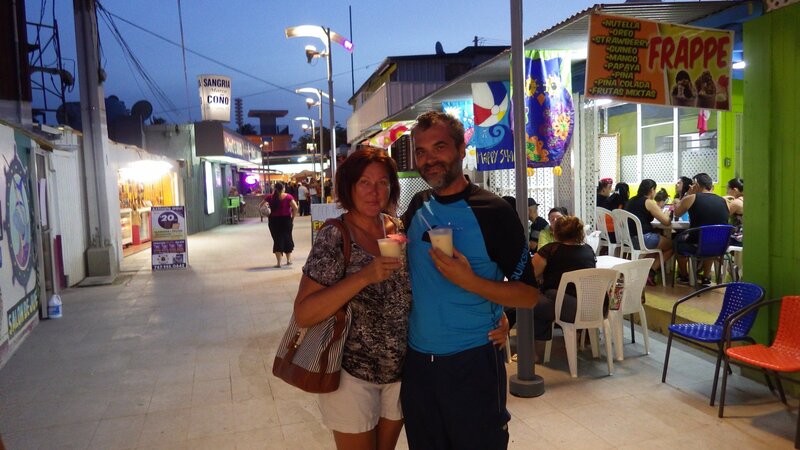 We had a nice night in the down, wondering streets among locals, having Pina Colada and listening to the music. 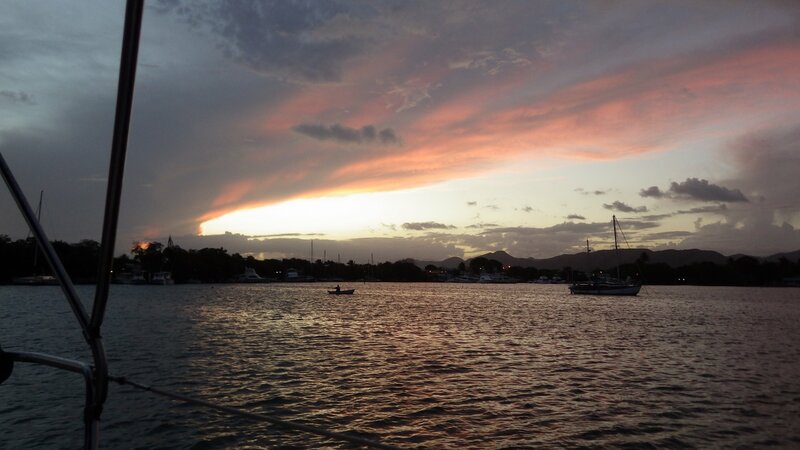 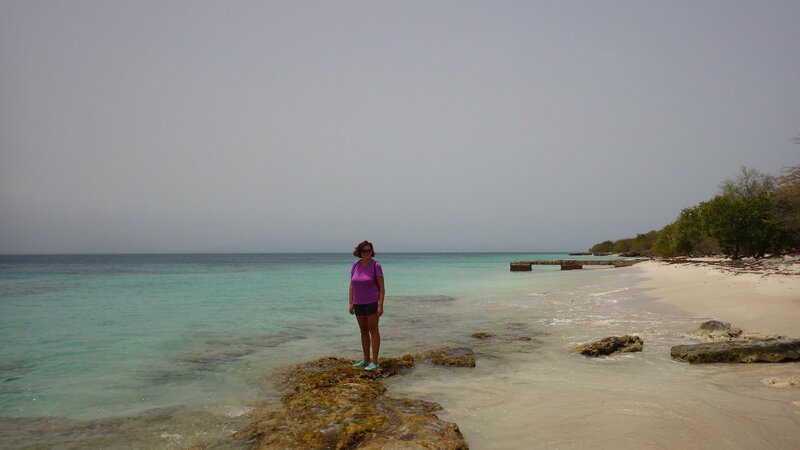 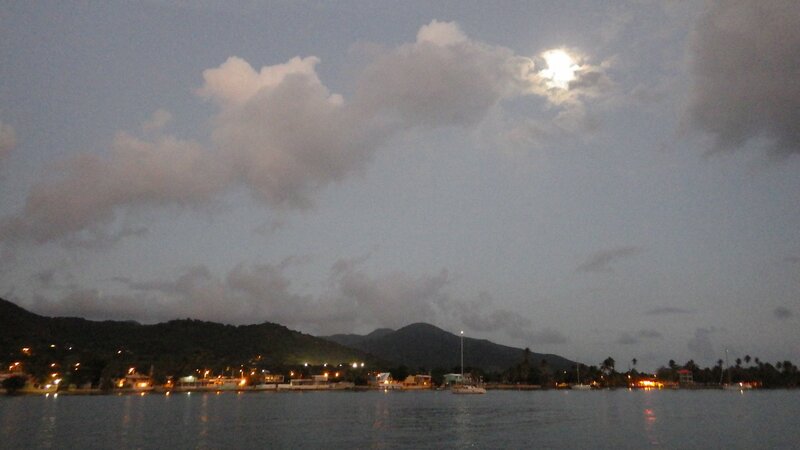 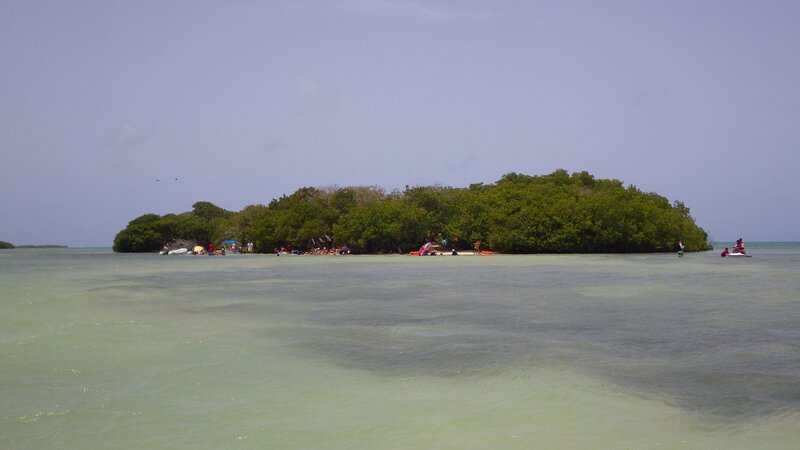 After La Parguera, our plan was to visit Bahia Fosforesente � a bioluminescent bay where bio organisms in the water make it light up at night when disturbed. 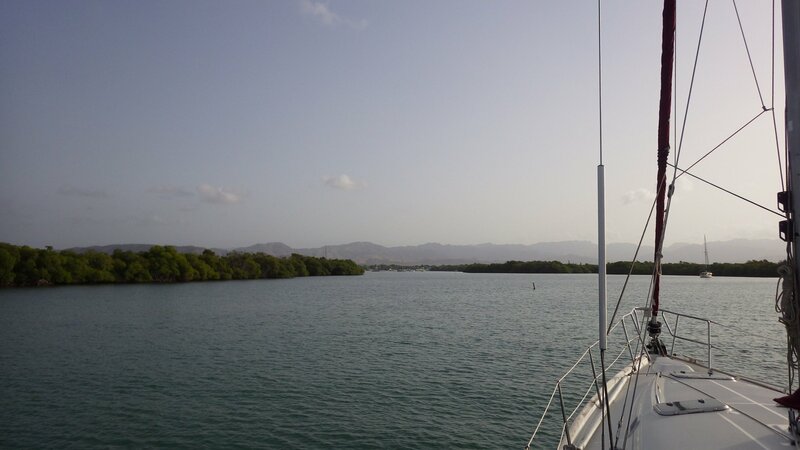 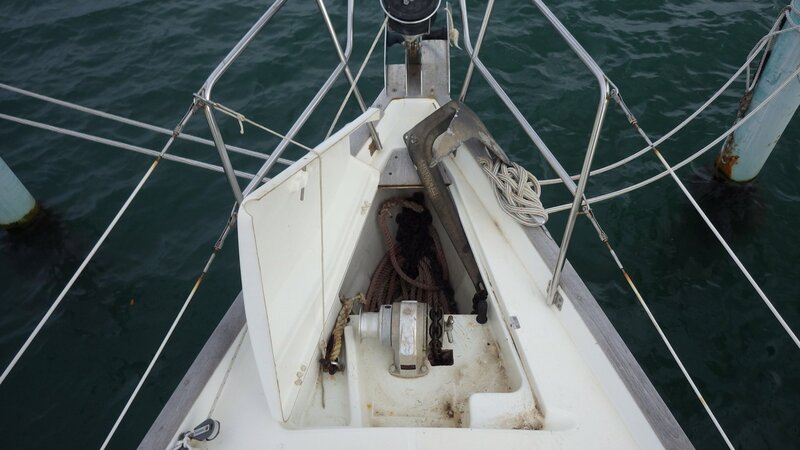 Unfortunately, the bay entrance seems to become silted and we could not take our yacht inside it - on approach, our depth sounder started to sound shallow water alarm and we had to turn around. 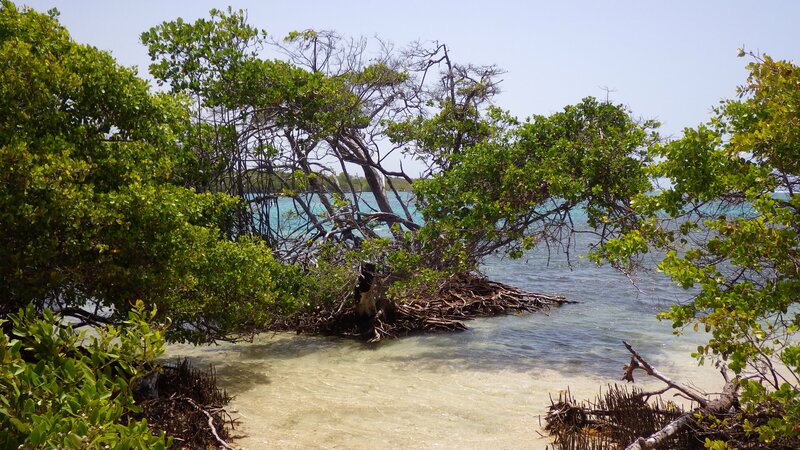 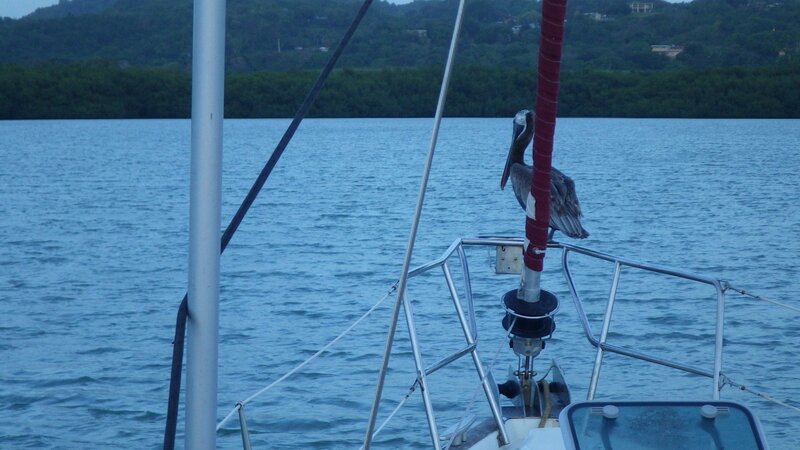 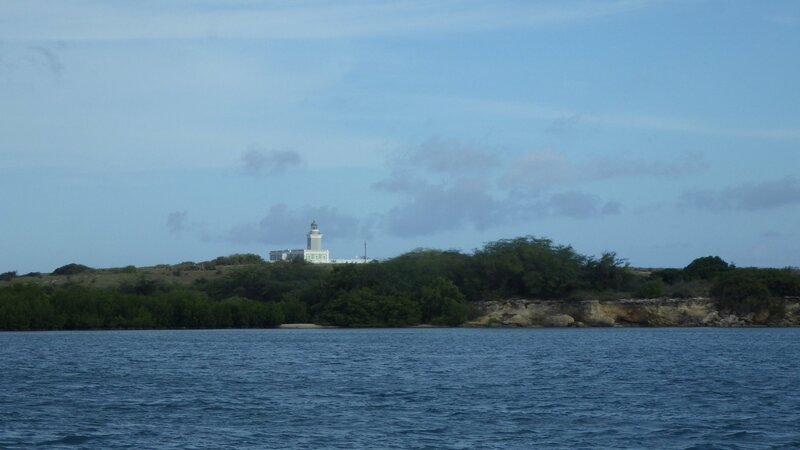 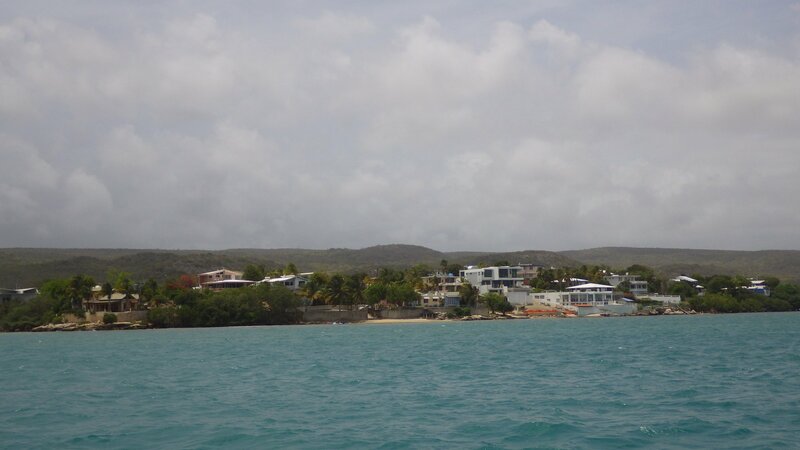 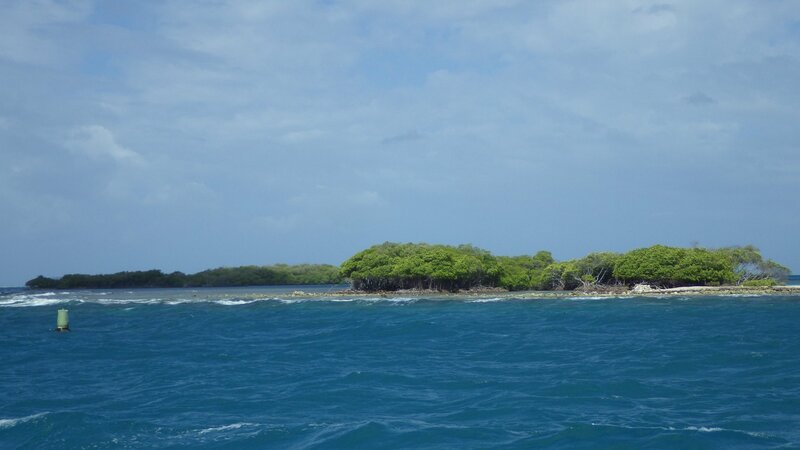 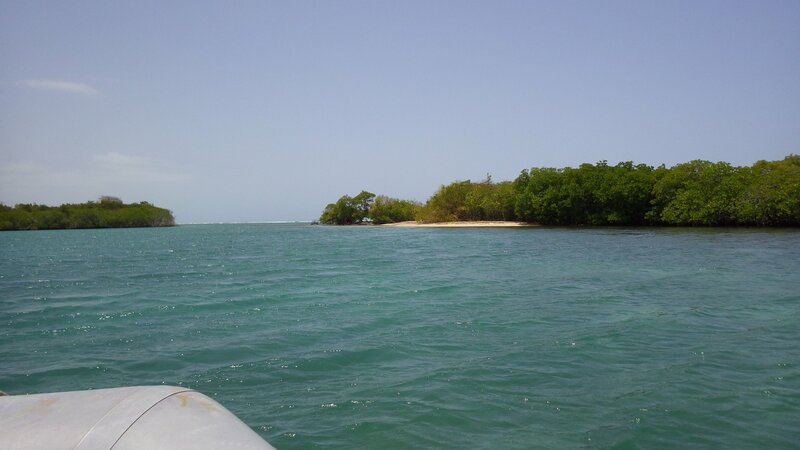 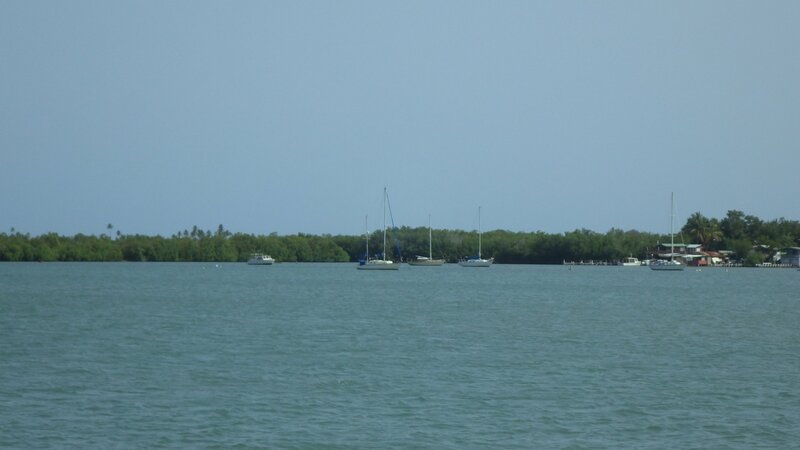 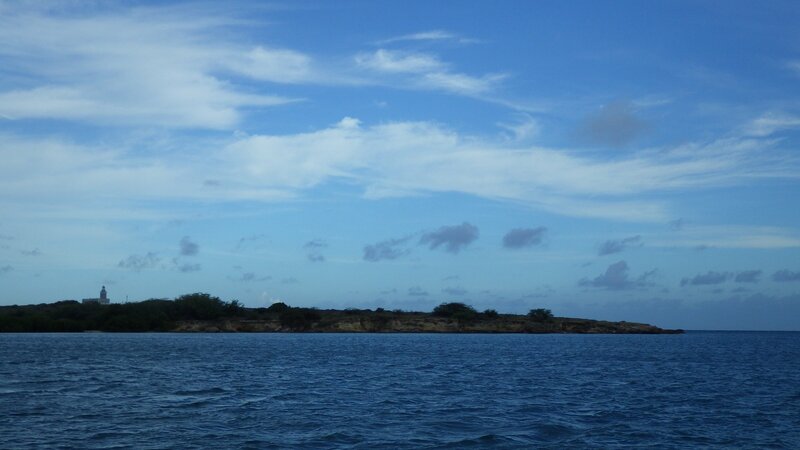 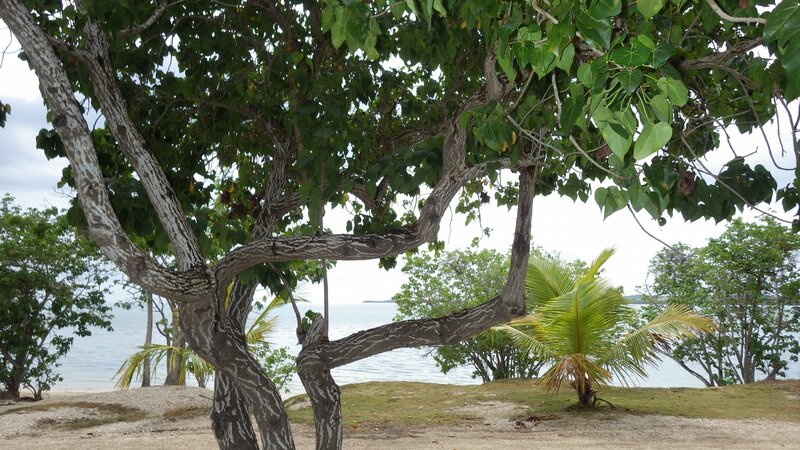 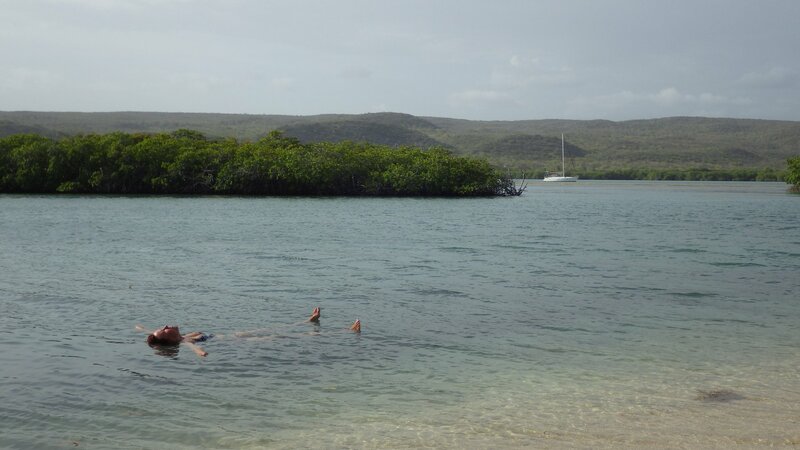 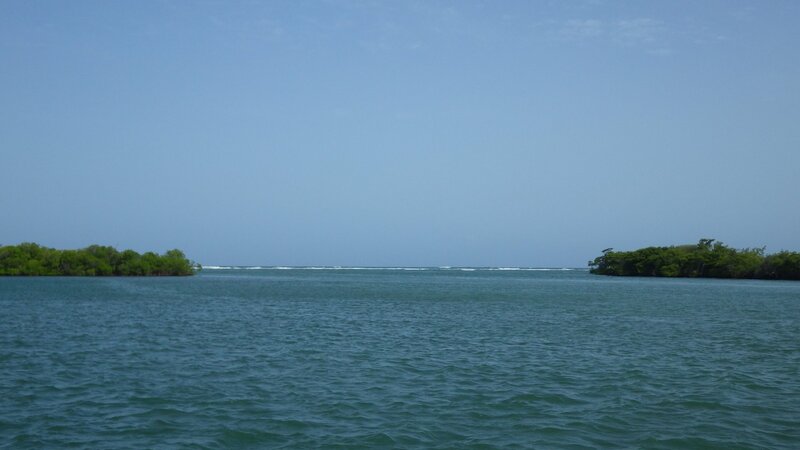 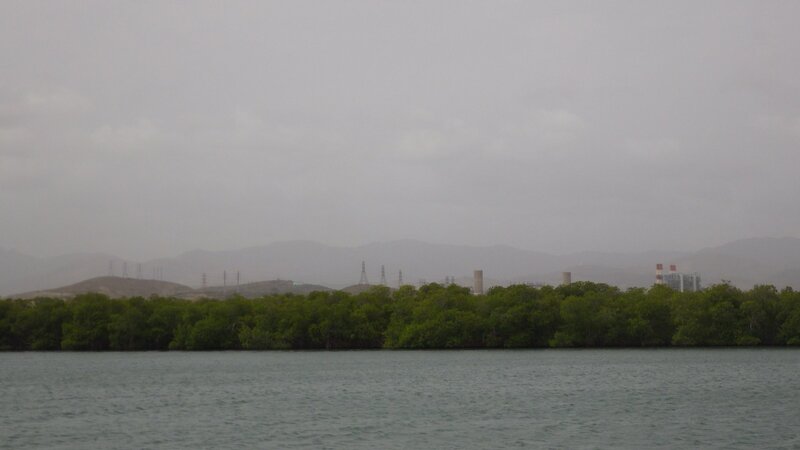 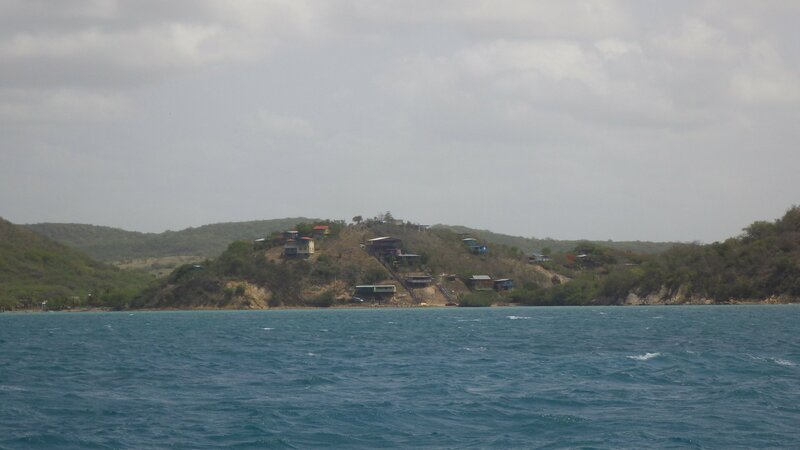 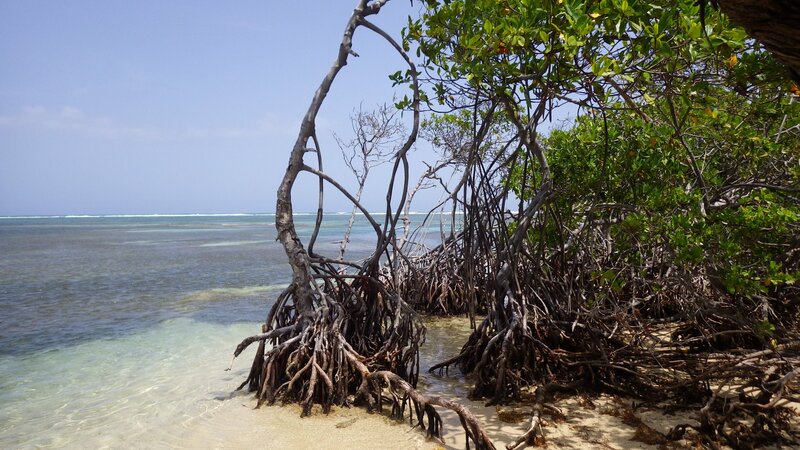 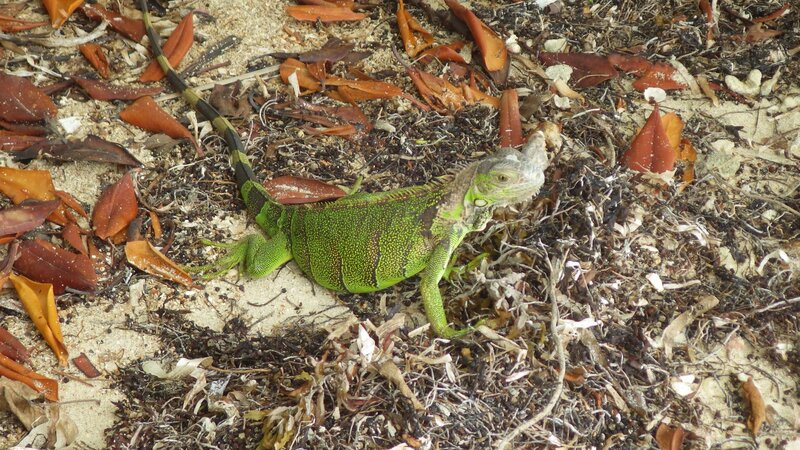 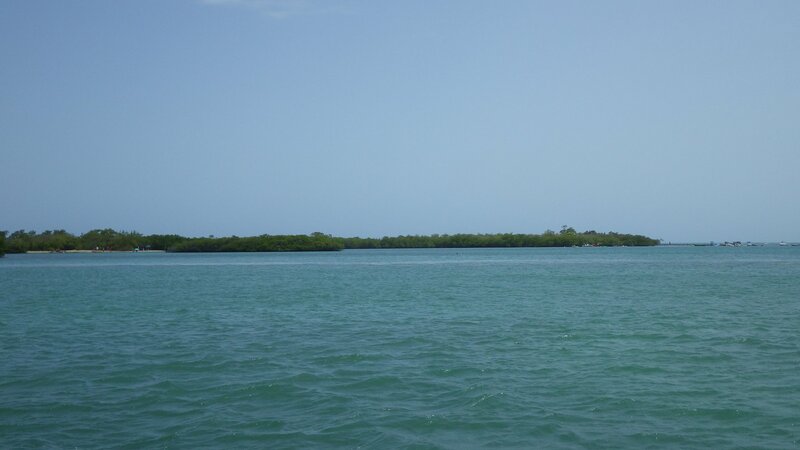 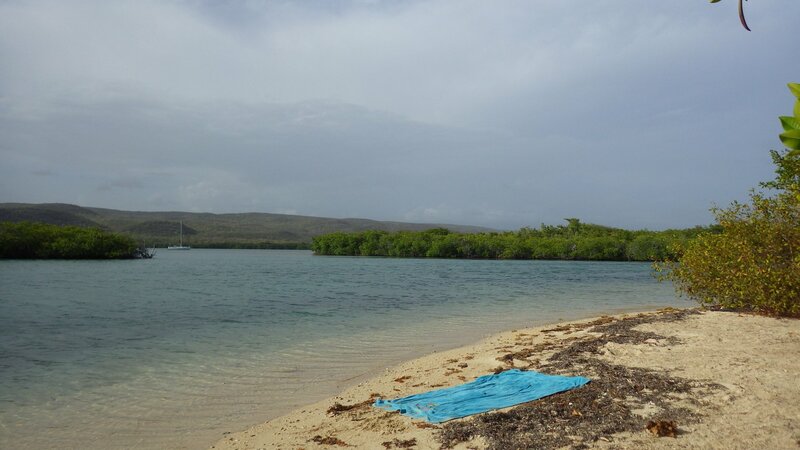 So we went further East to Guanica, Gilligan's Island. 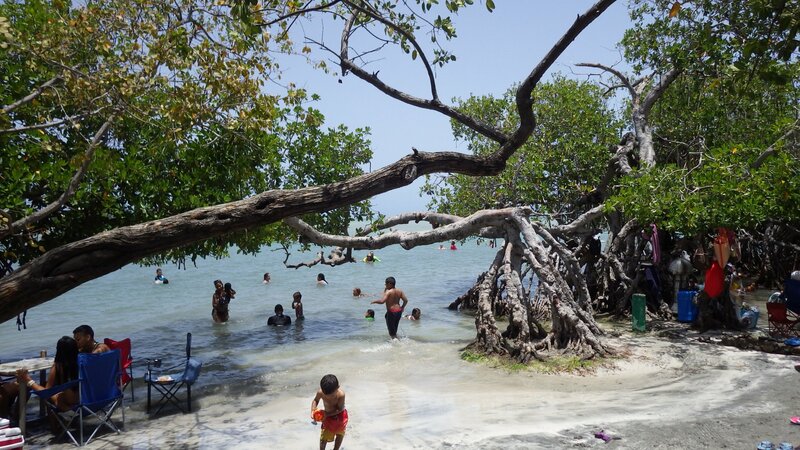 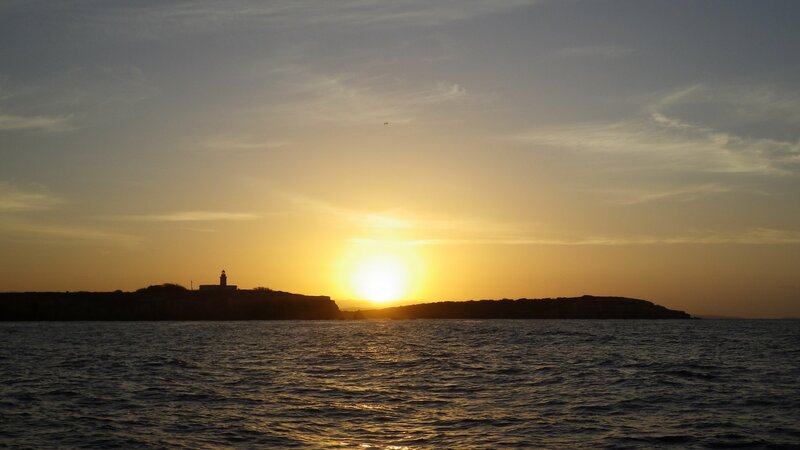 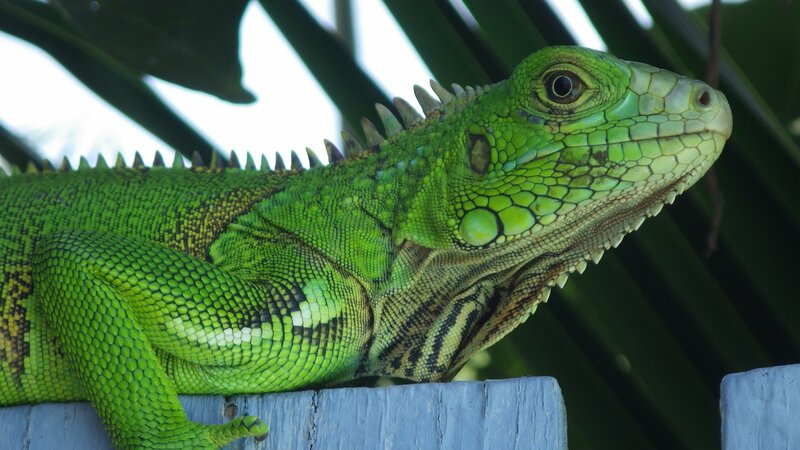 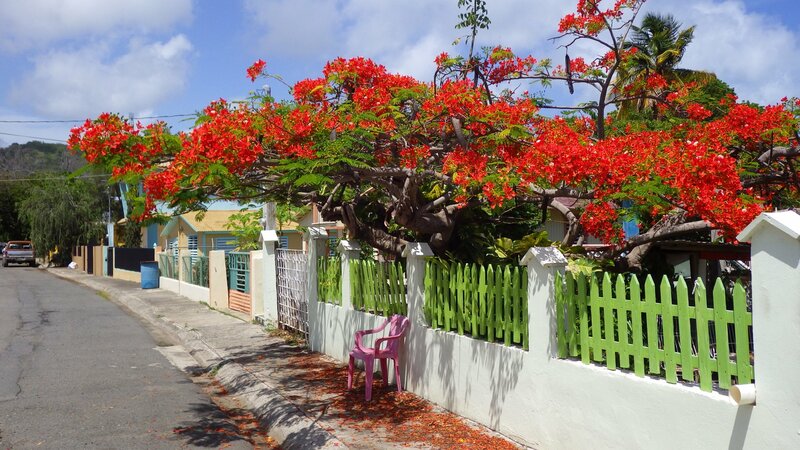 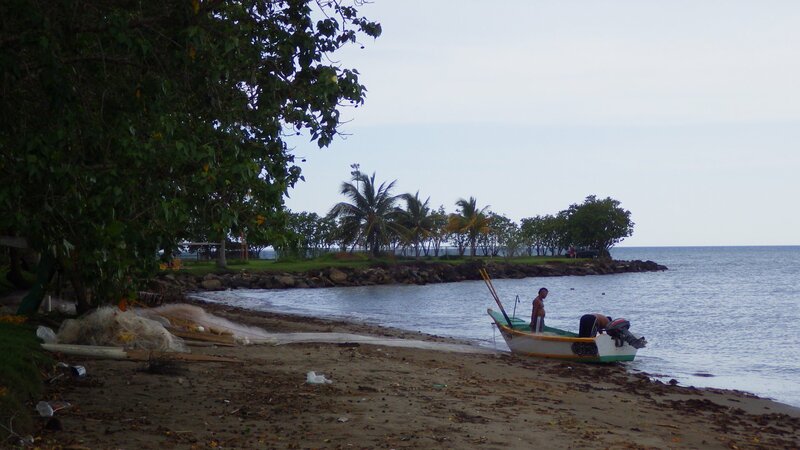 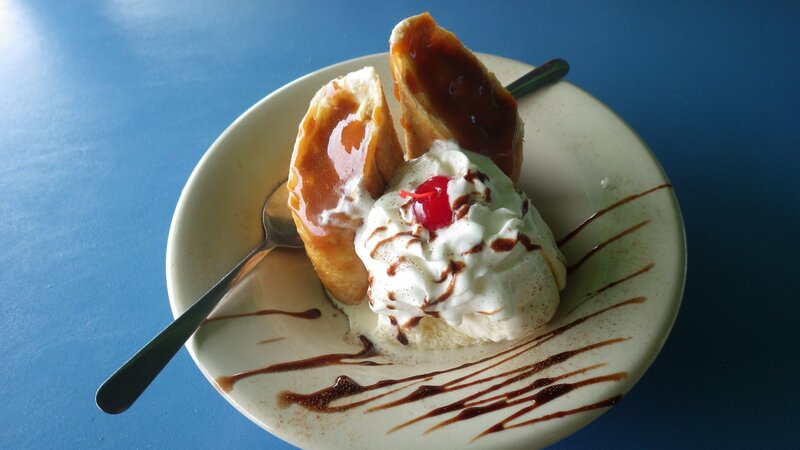 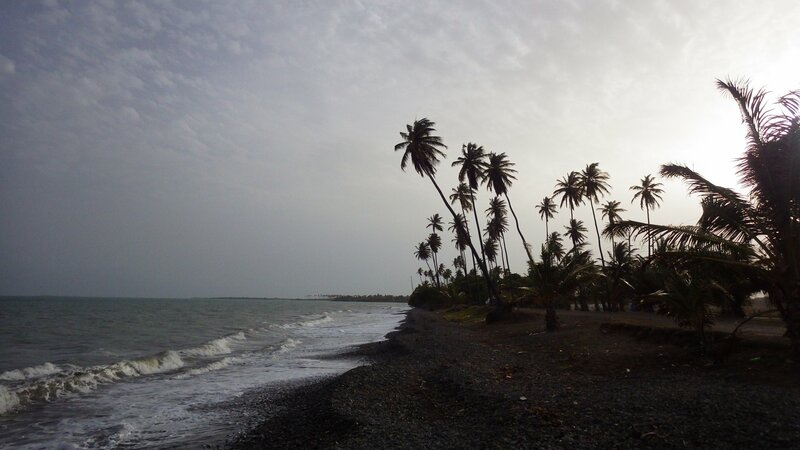 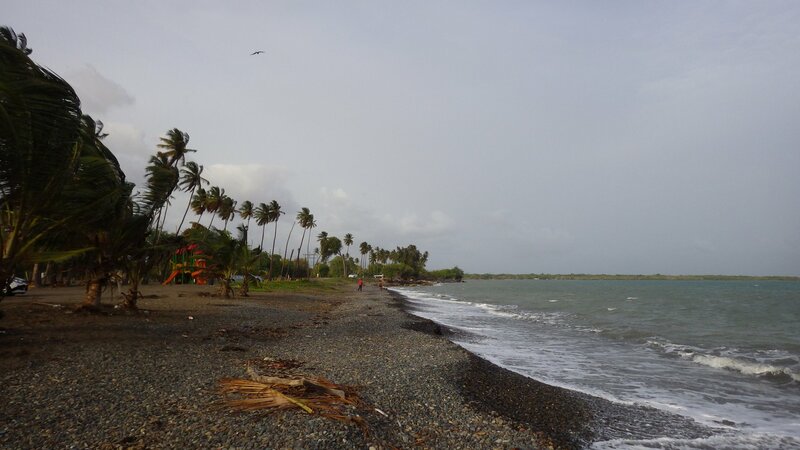 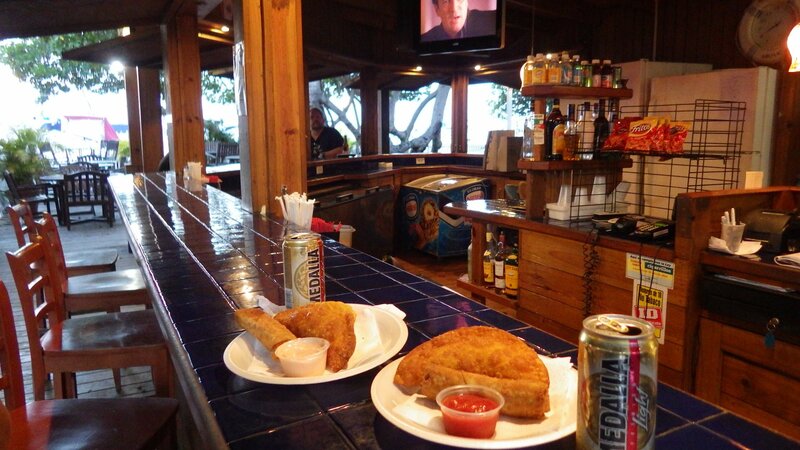 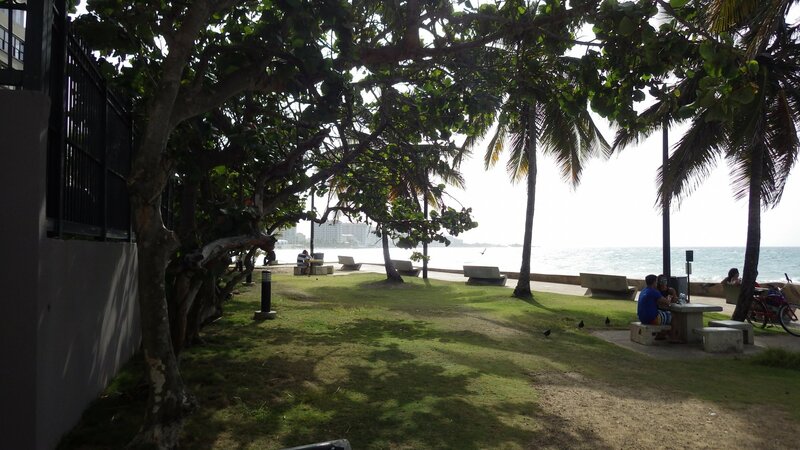 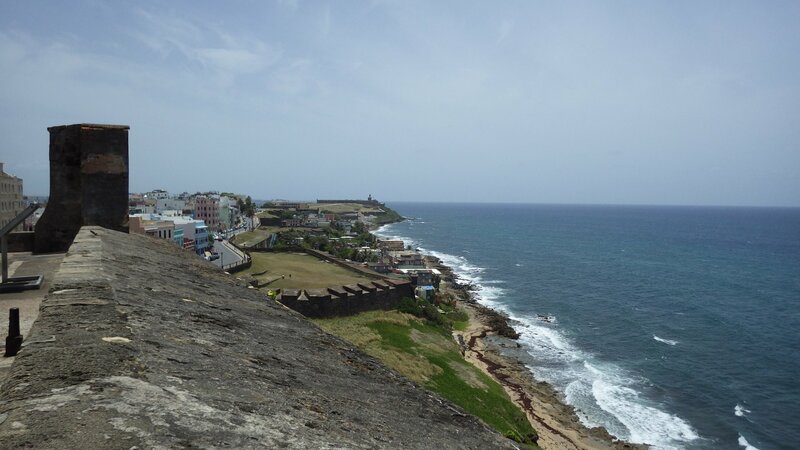 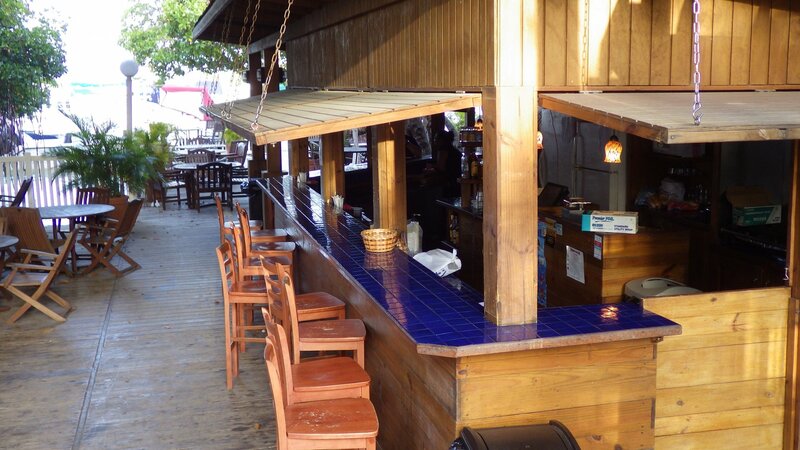 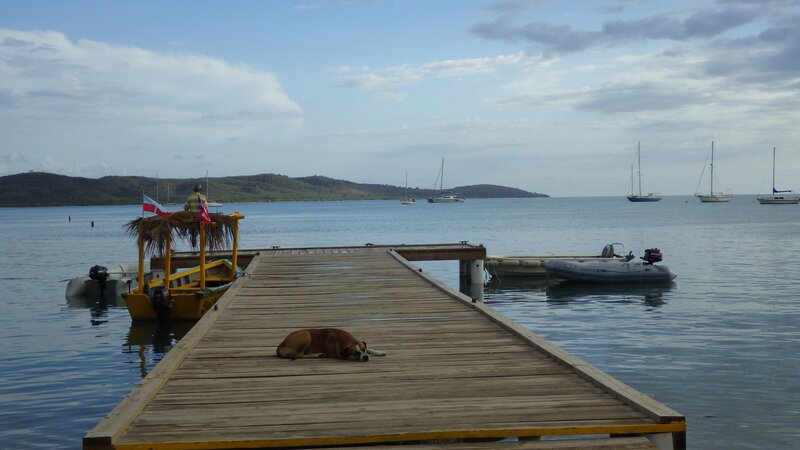 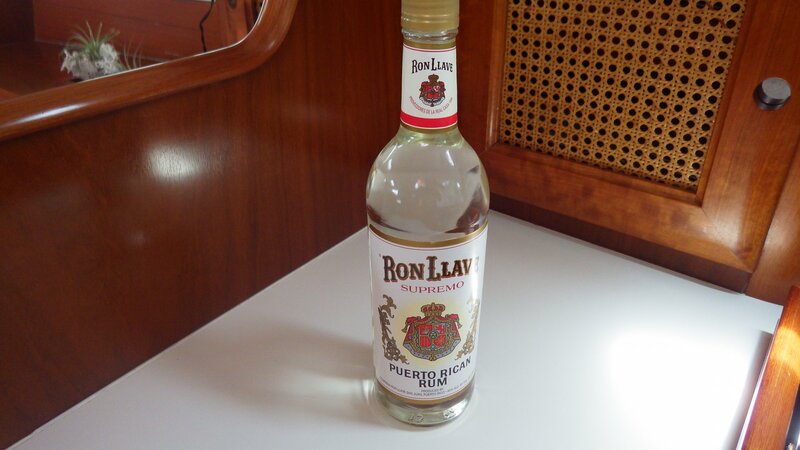 One of the favorite pastimes of Puerto Ricans is hanging out on many islands on the South Coast. 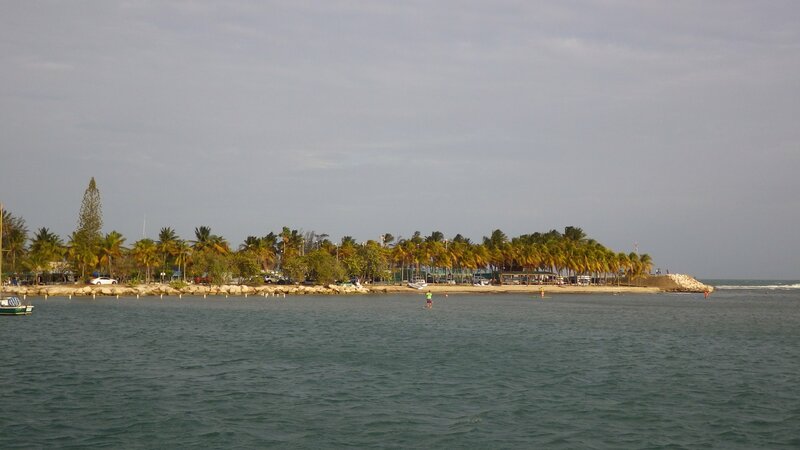 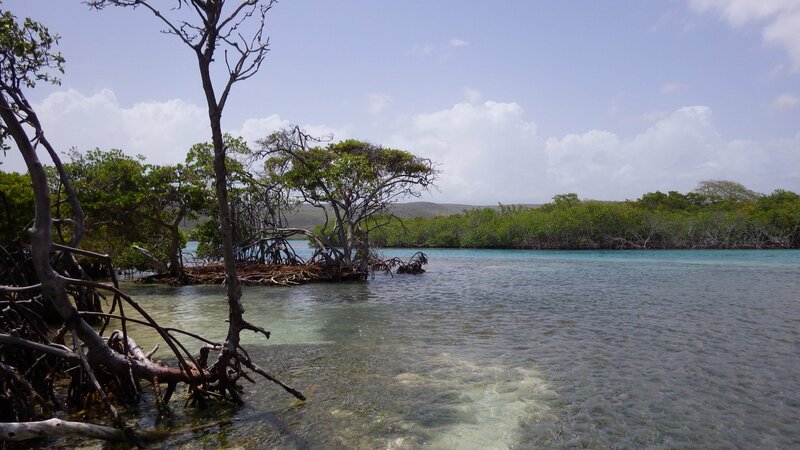 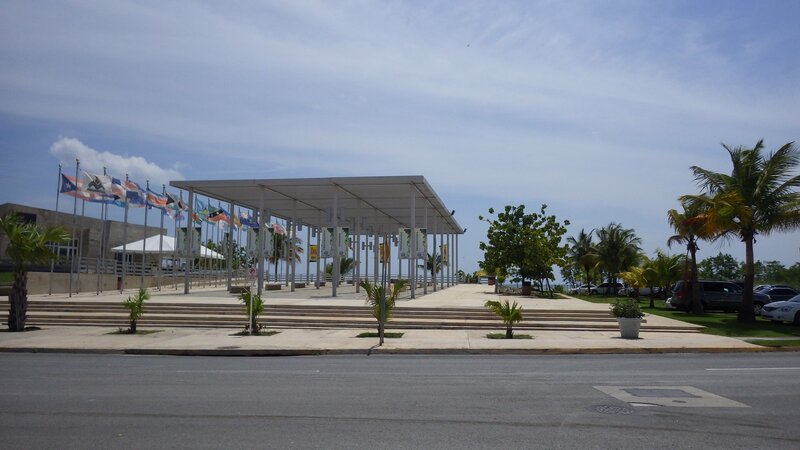 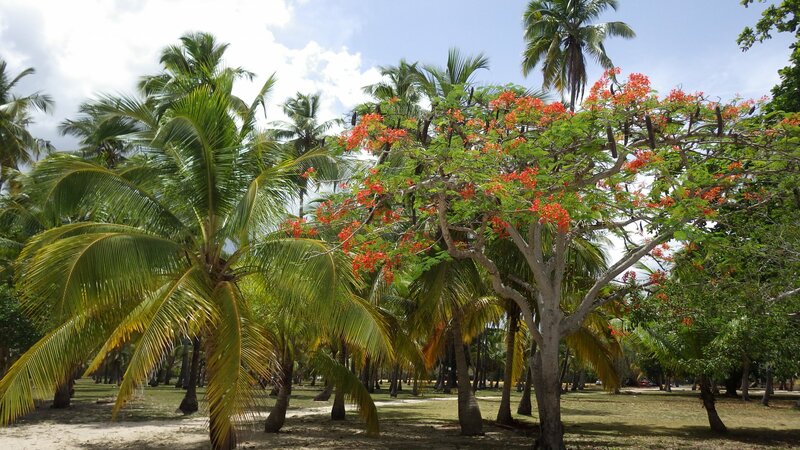 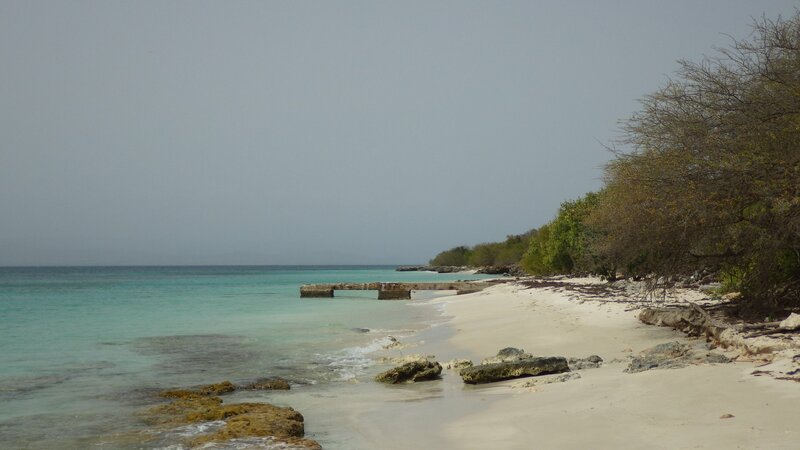 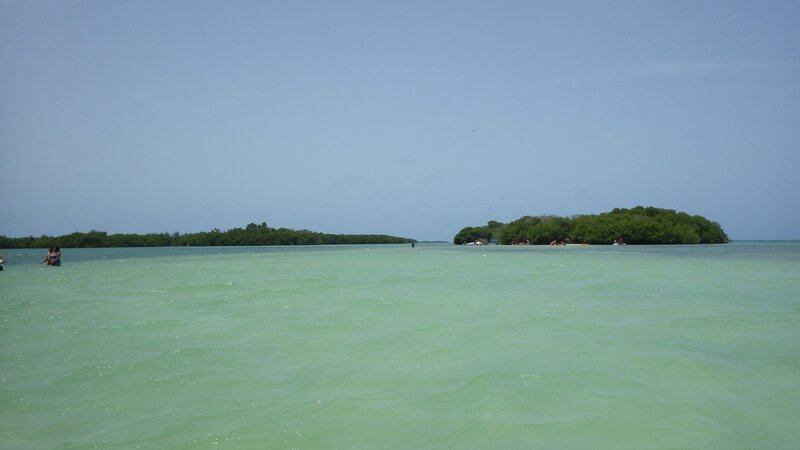 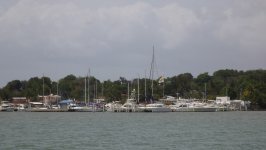 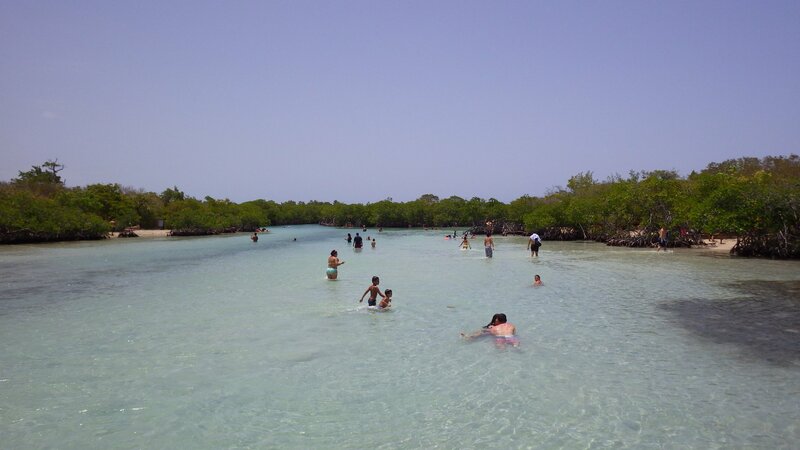 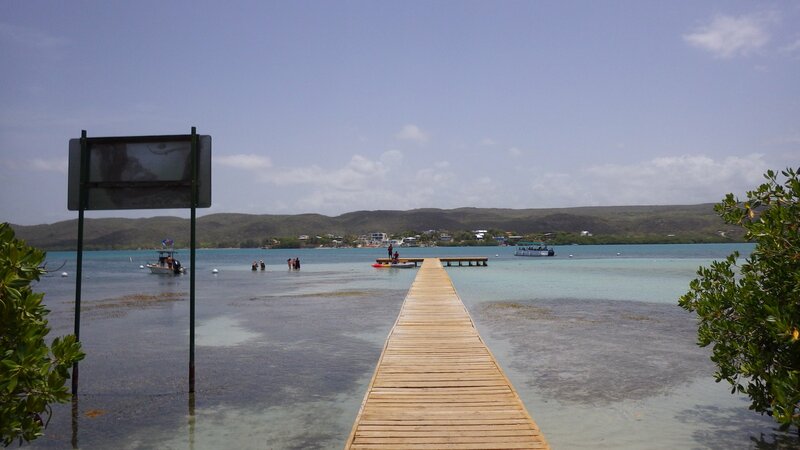 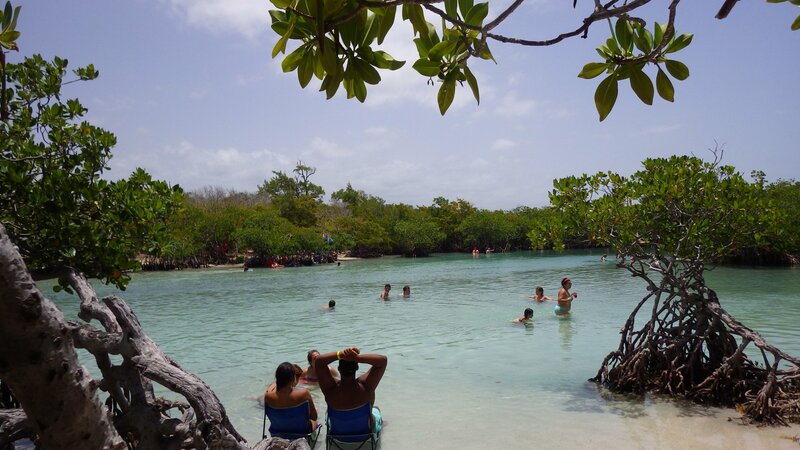 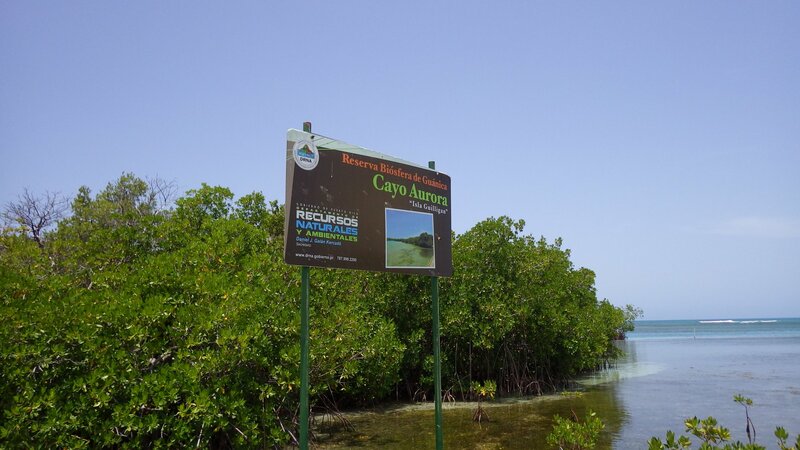 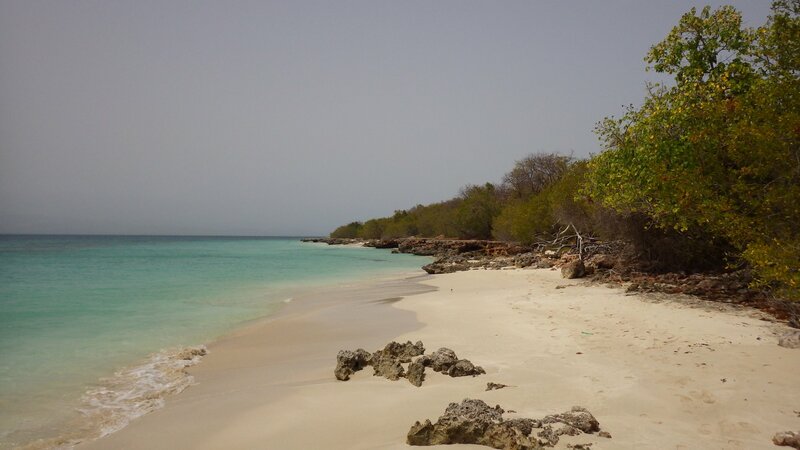 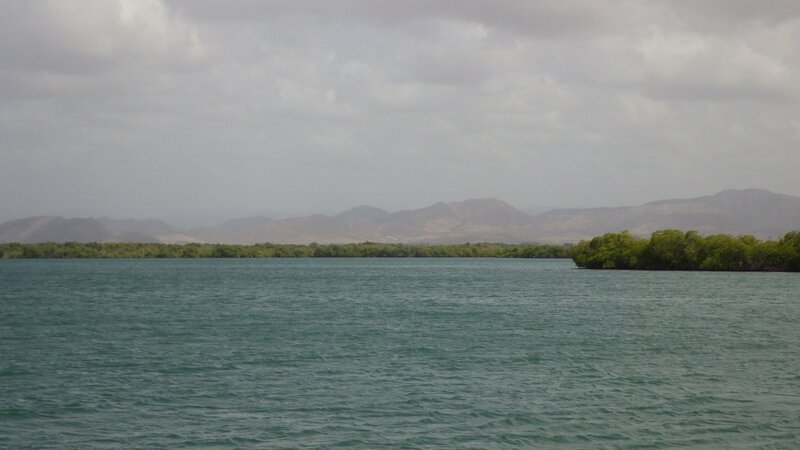 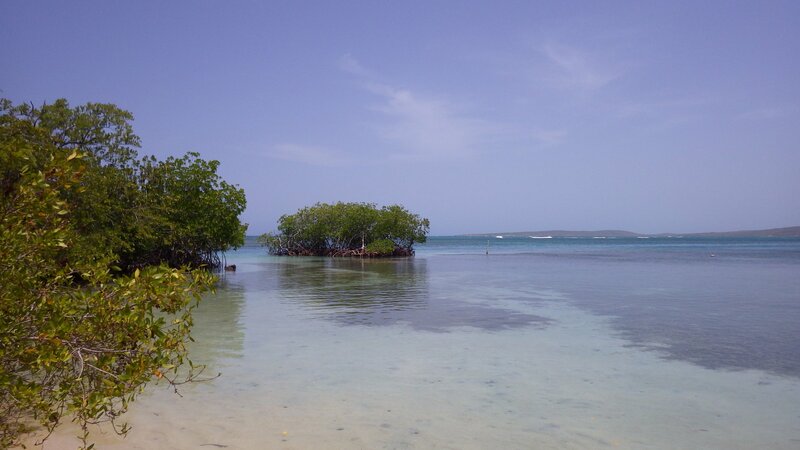 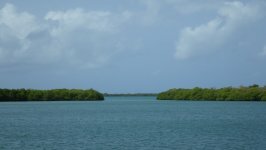 The Cayos de Cana Gorda (also known as Cayo Aurora and "Gilligan's Island") is a public park and one of such places. 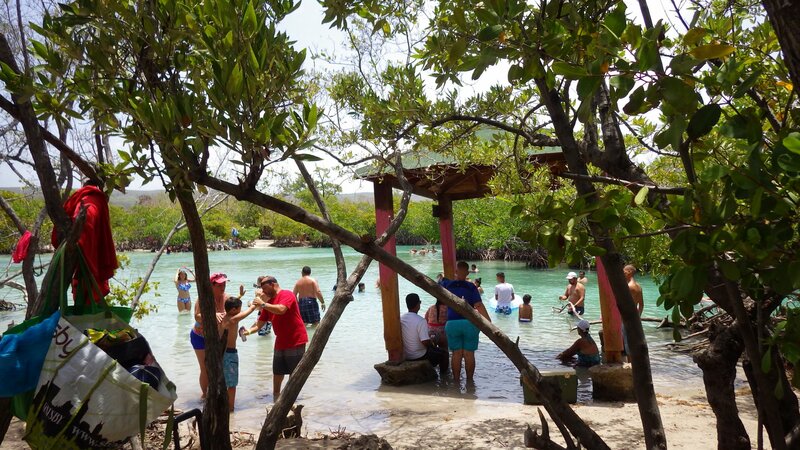 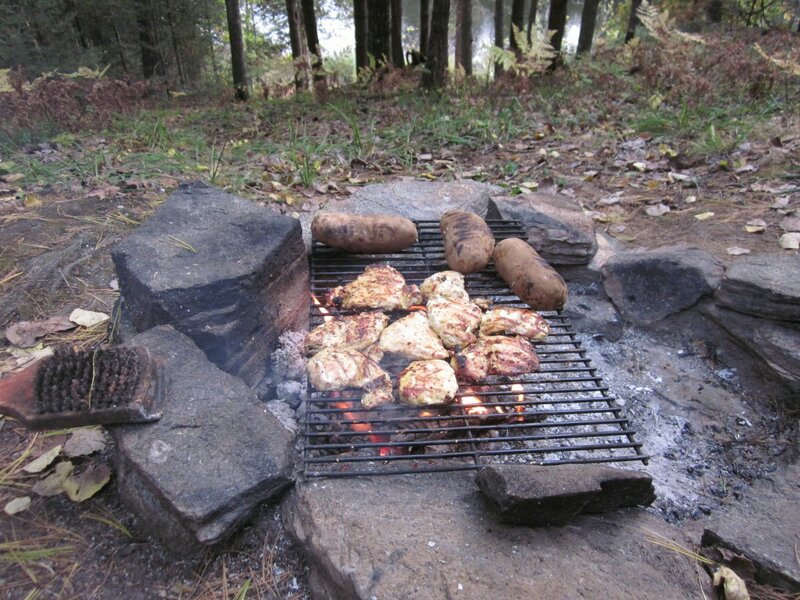 People come there to have BBQs and to soak in the water on the weekends. 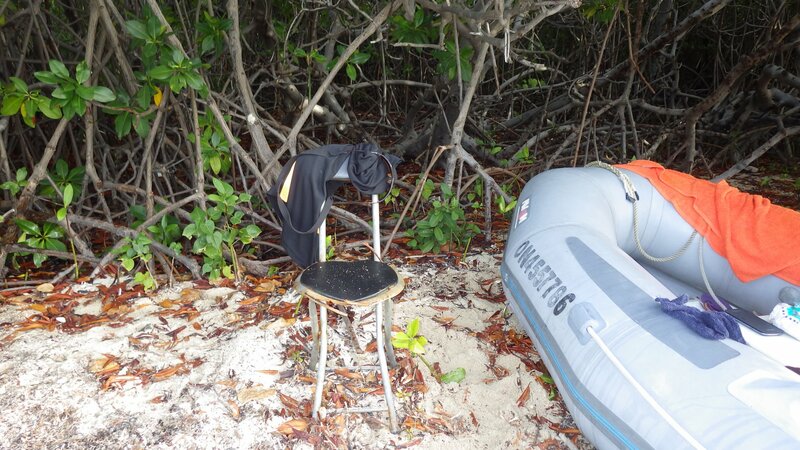 So one day we followed the pack and landed on a secluded beach for a picnic and to soak in the water. 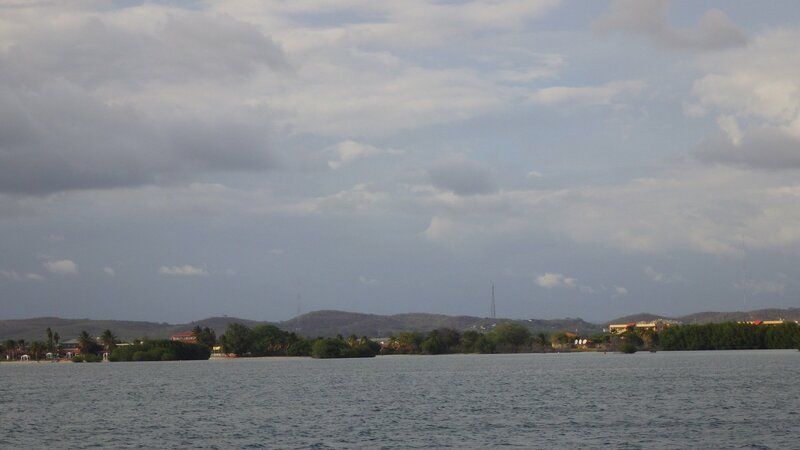 We had a memorable time there. 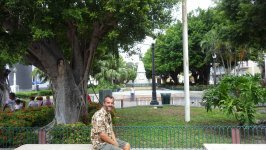 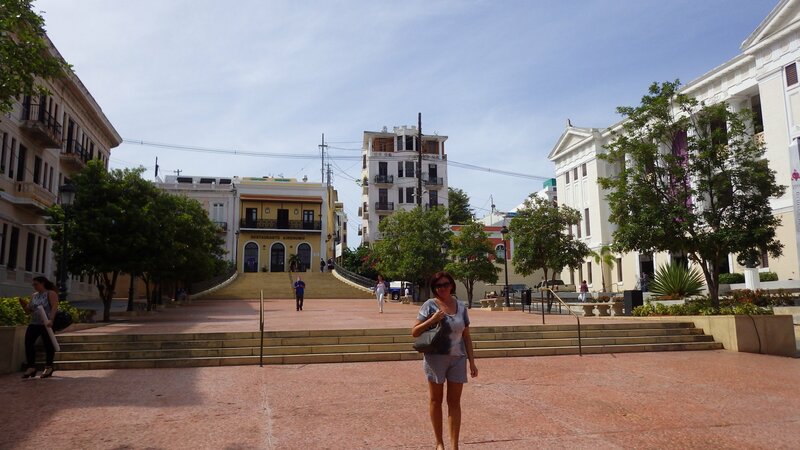 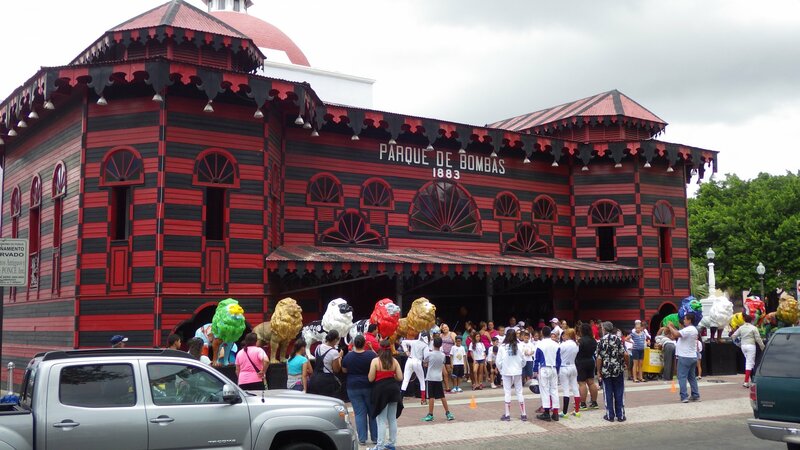 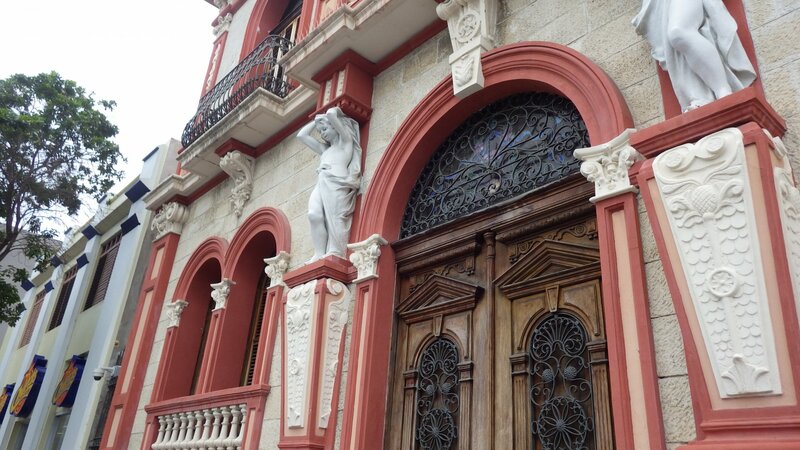 Visited Ponce, Puerto Rico's second largest city. 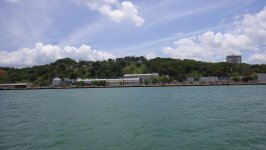 Unfortunately, there is not much anything near the shore and you need taxi (or rental car) to get anywhere and visit the city. 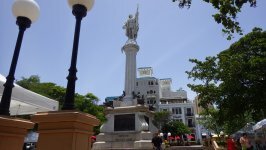 Nevertheless, we stayed for few days � visited historical downtown area, did some shopping at great prices, picked up provisions, etc. 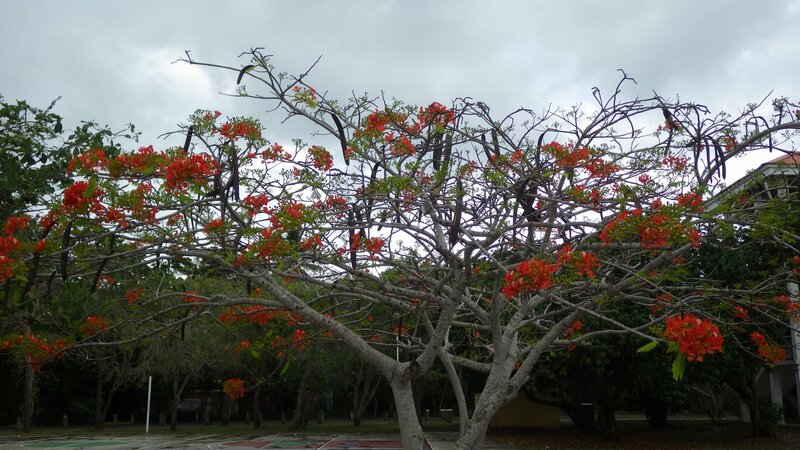 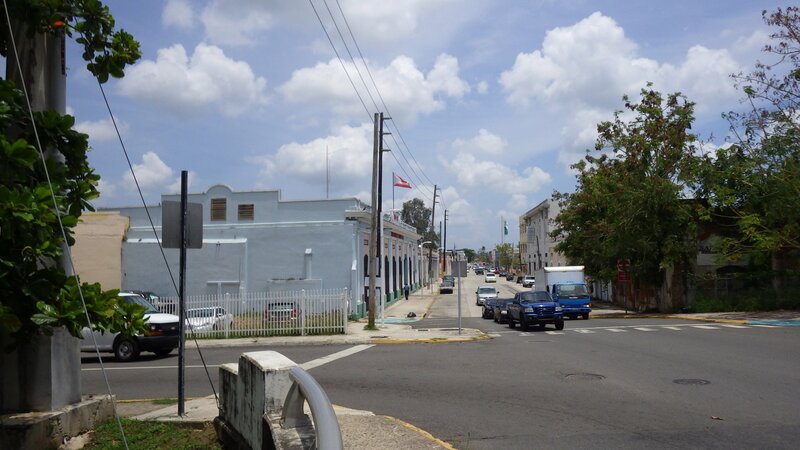 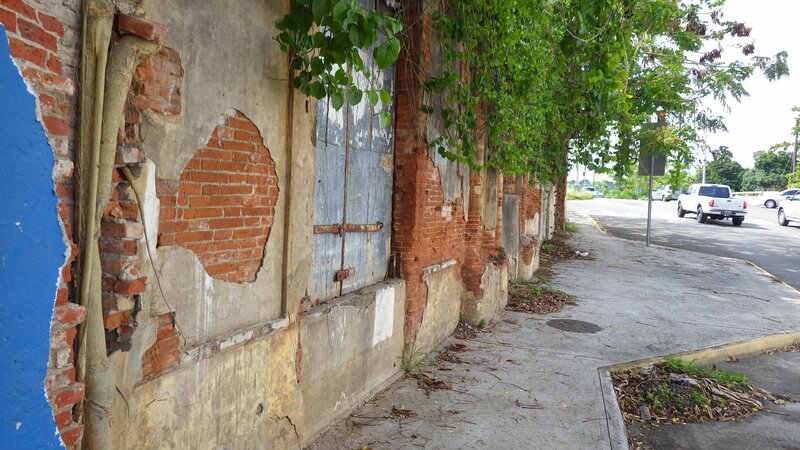 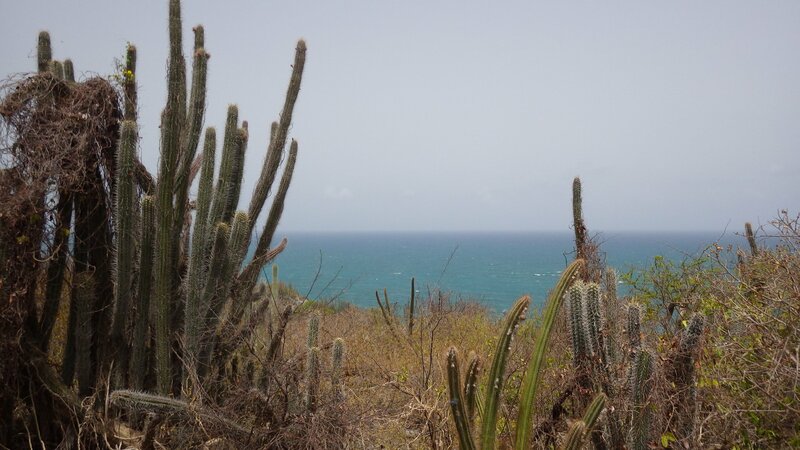 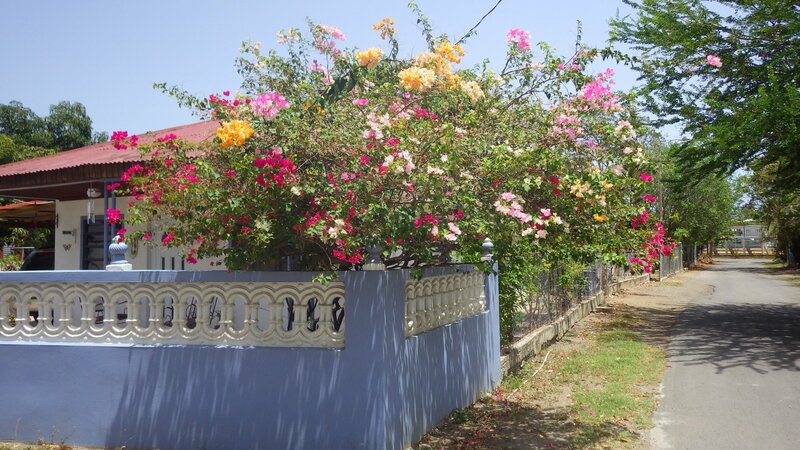 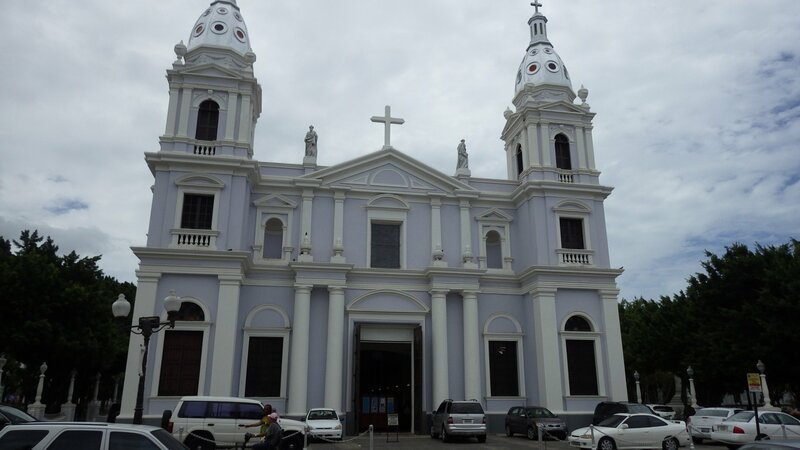 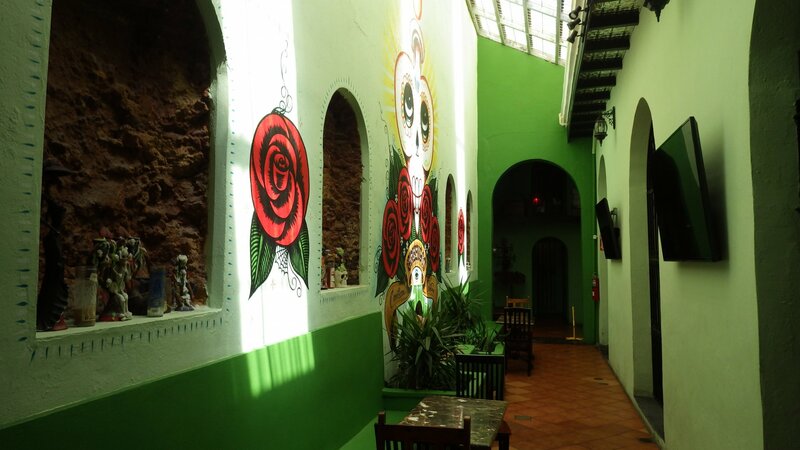 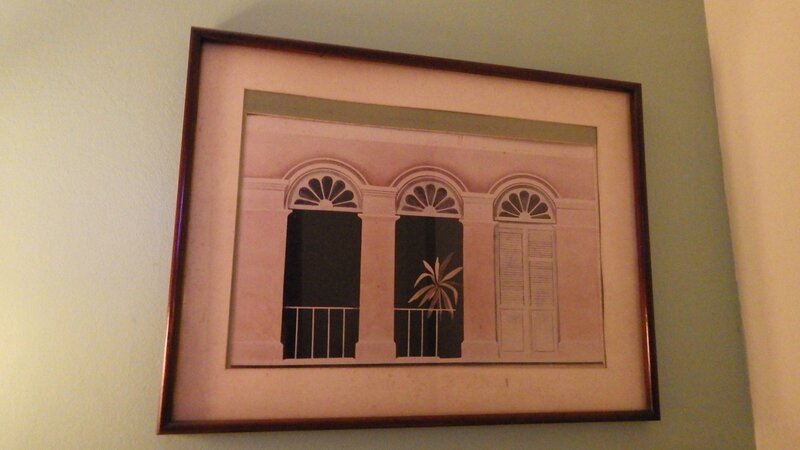 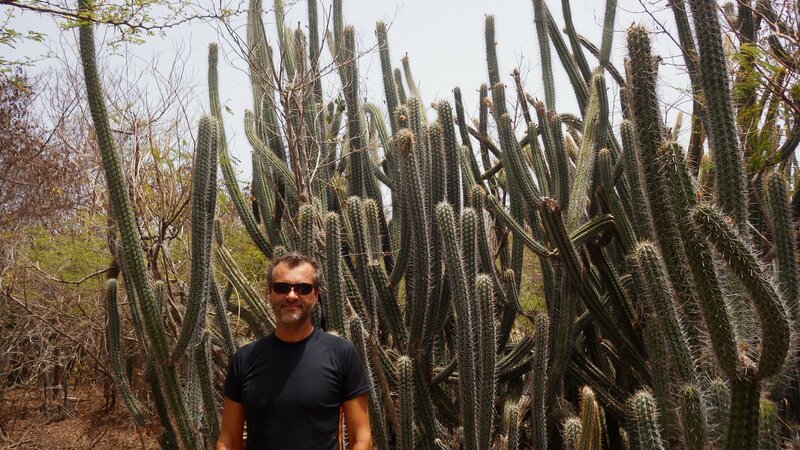 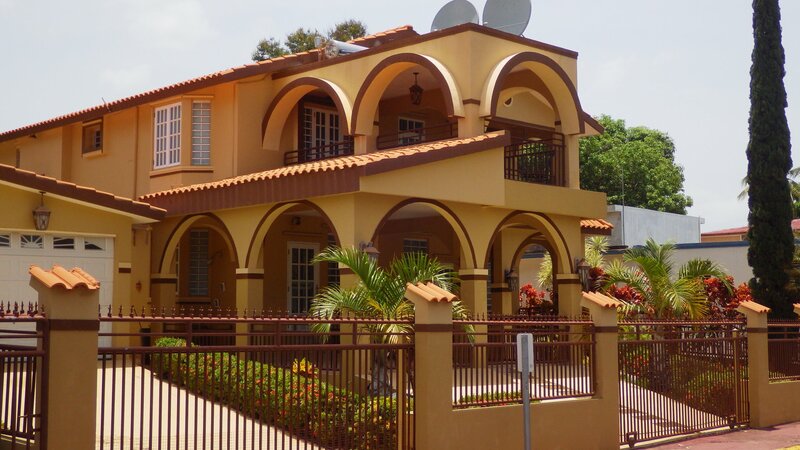 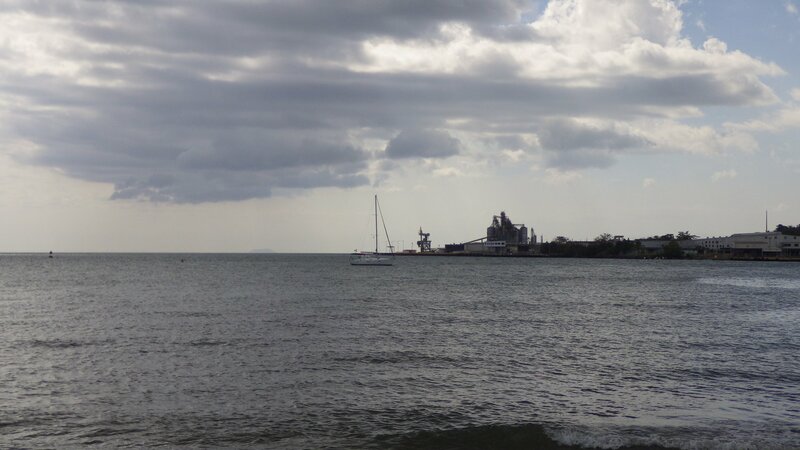 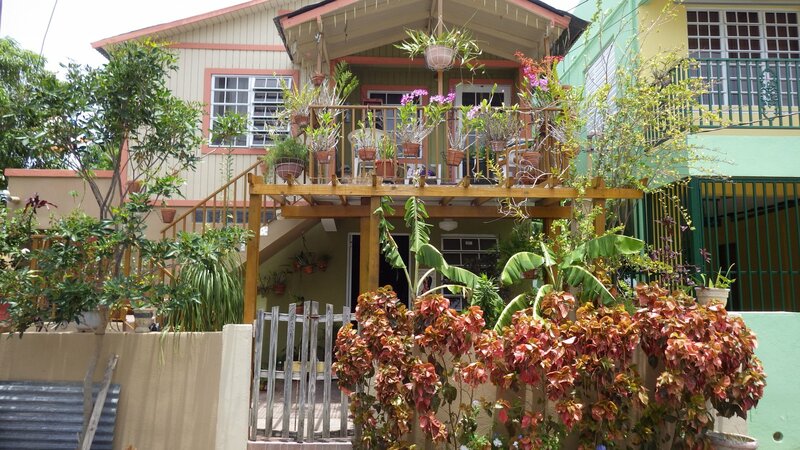 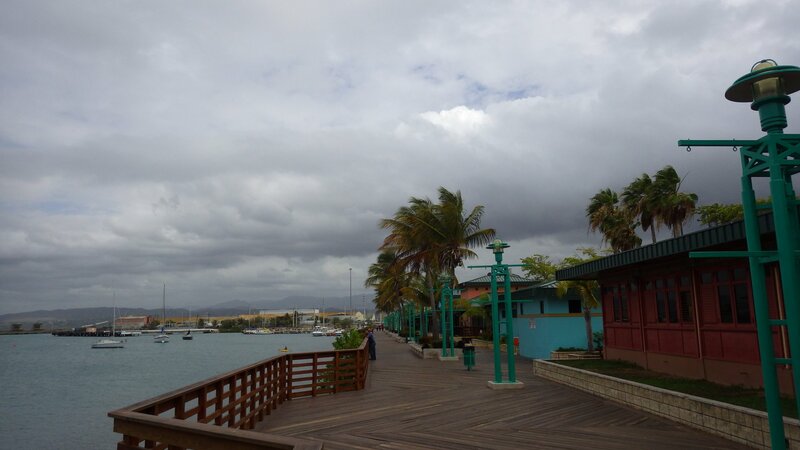 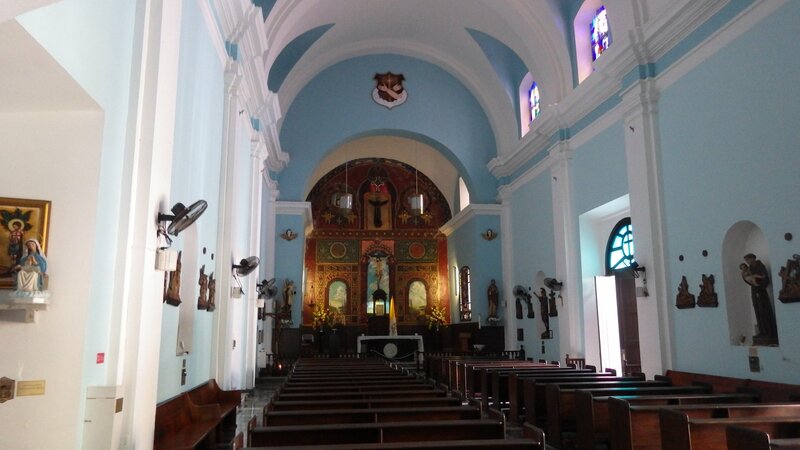 We wanted to stay more in Ponce, but the weather window was closing and we had to move on. 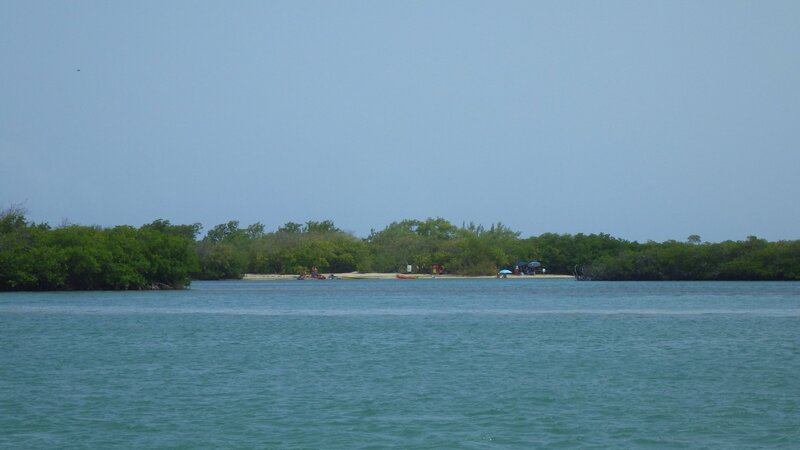 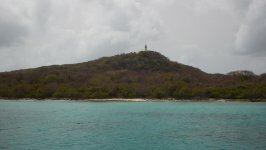 Visited Isla Caja de Muertos, a.k.a. 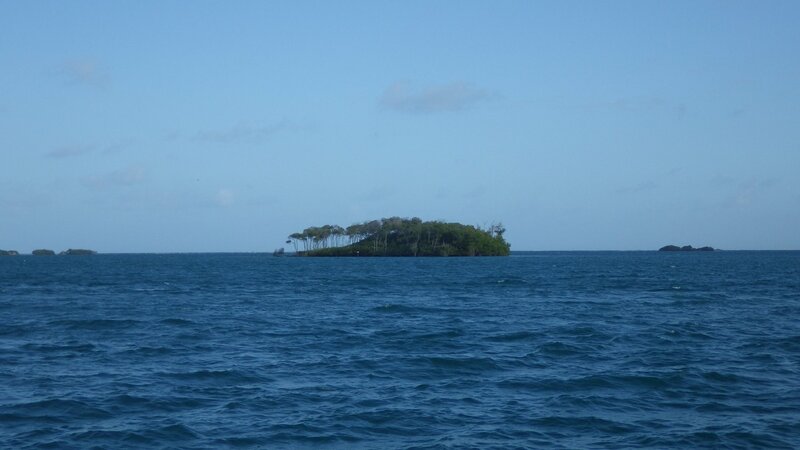 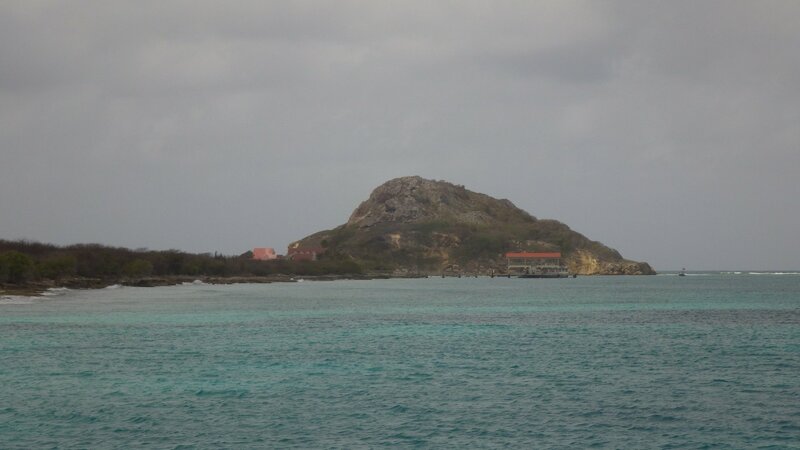 Coffin Island. 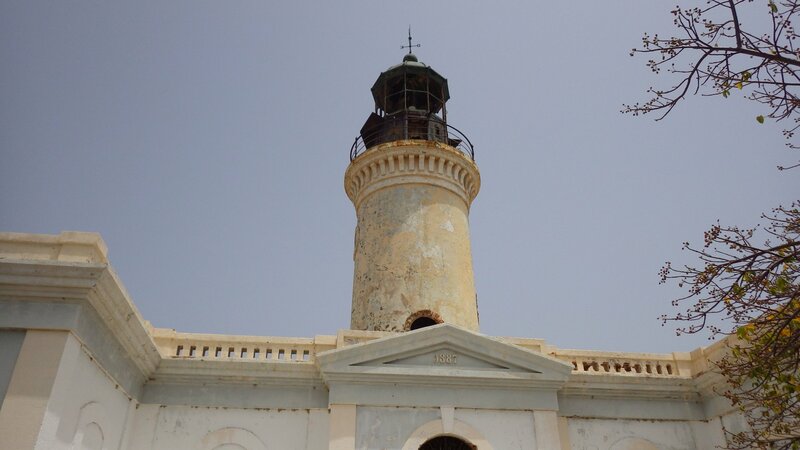 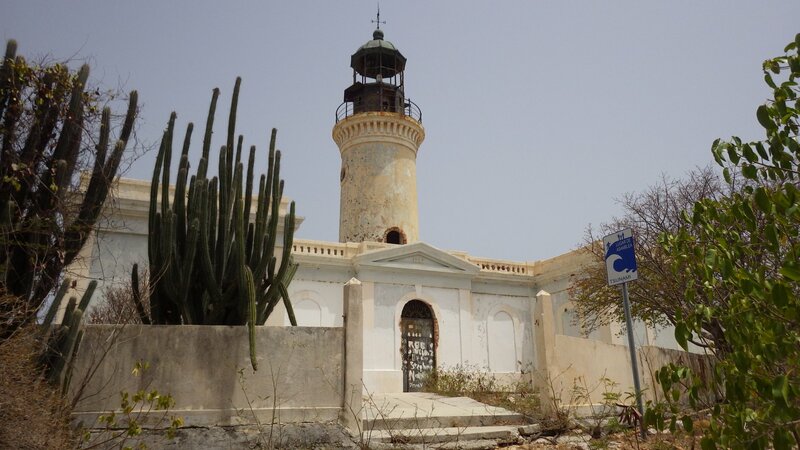 Had a pleasant walk uphill to the old lighthouse, built by Spanish in 1887. 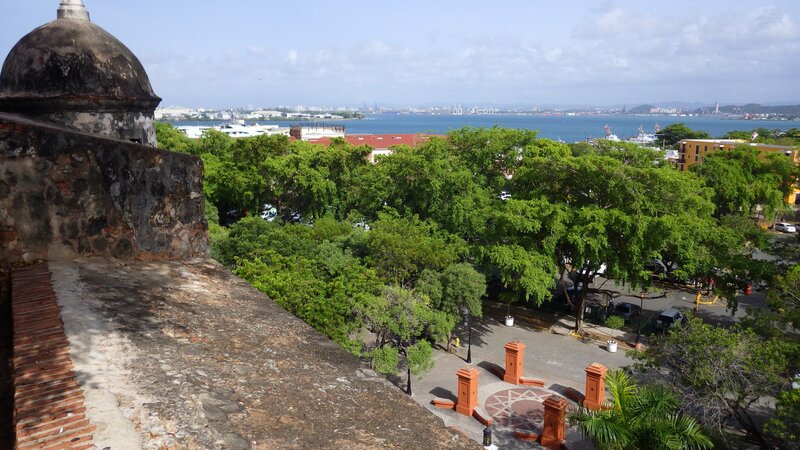 The views are amazing from the top! 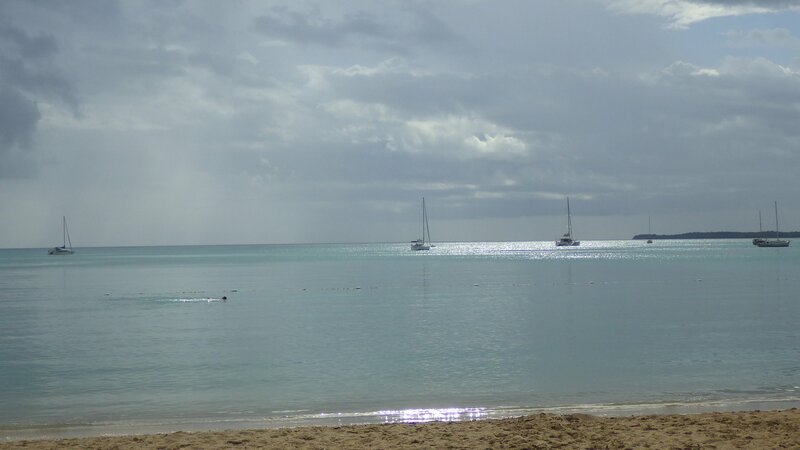 Spent some time swimming at the beach. 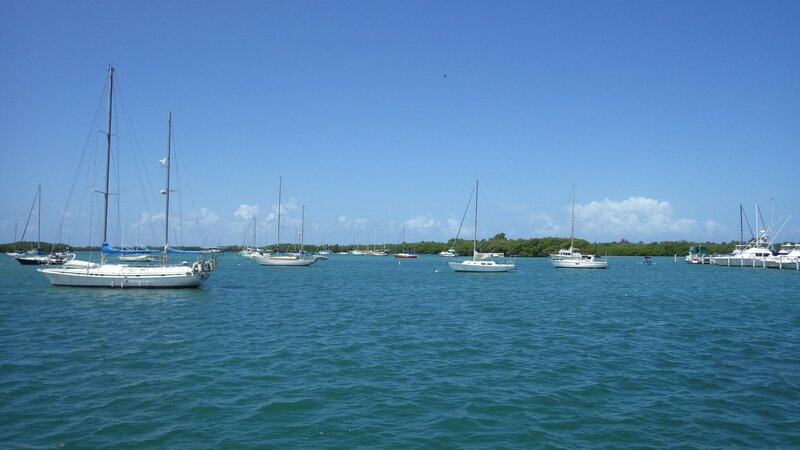 Arrived at Salinas, anchored in a protected bay for few days. 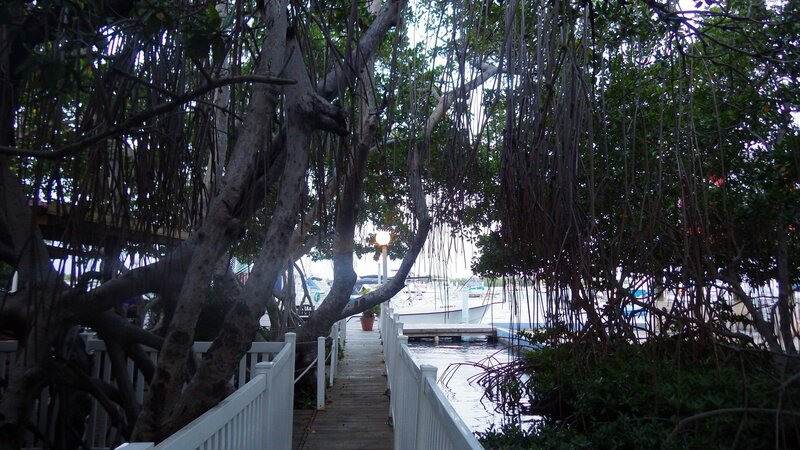 Walked around the shore village, checked out some local establishments... 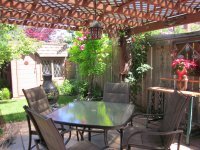 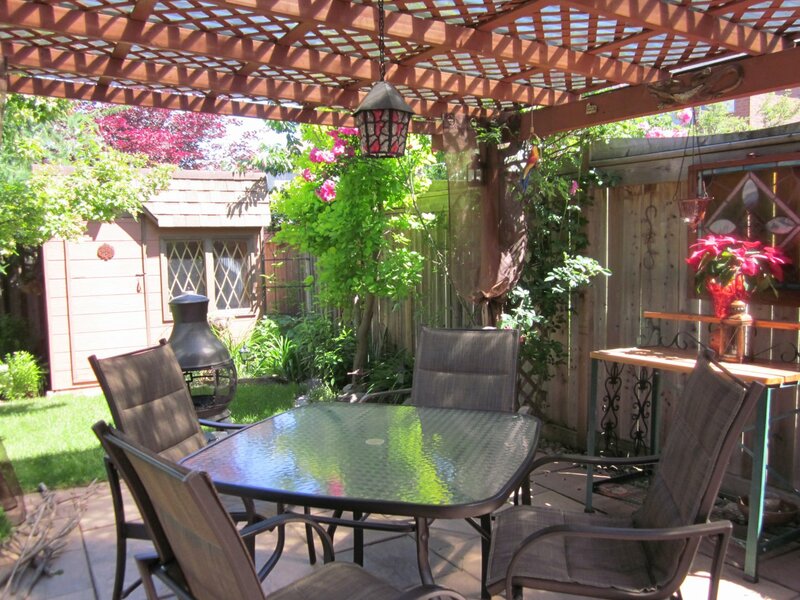 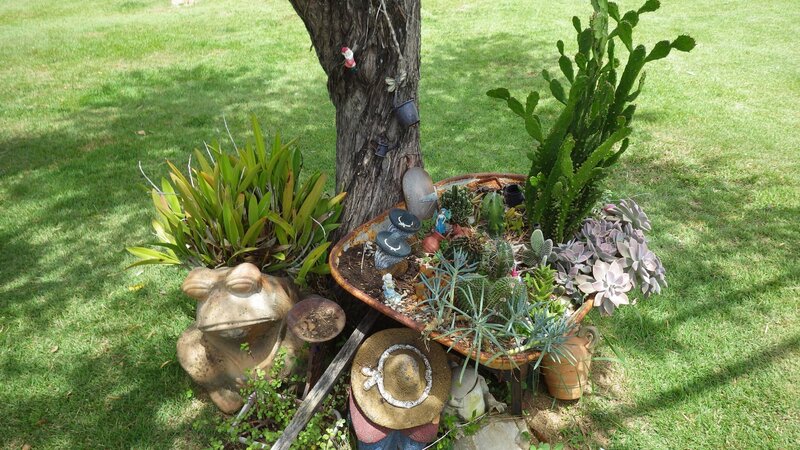 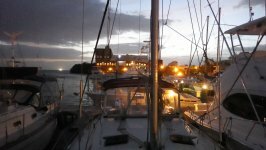 It's a pretty, inviting area, although does not offer much for the cruising sailor � you need a car to get groceries and other things. 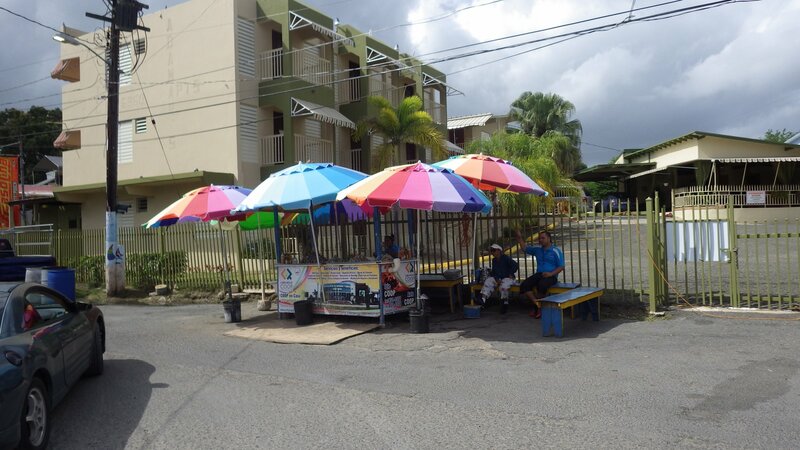 The local people are quite friendly � we were offered a ride to the store and helped in other ways. 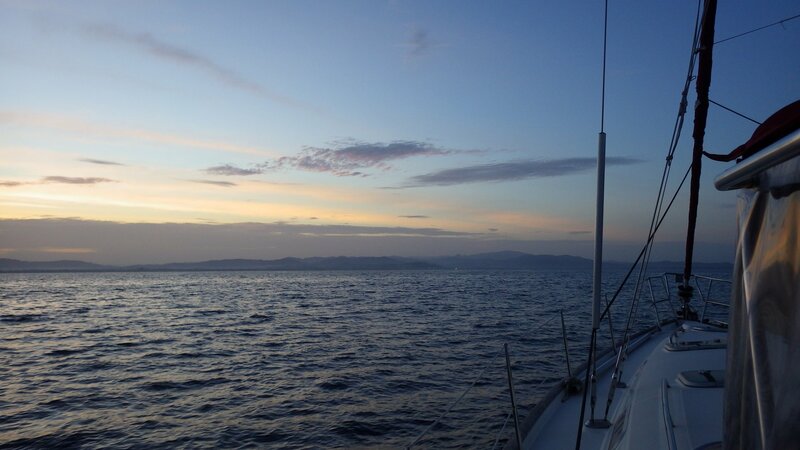 Here, we found a decent internet connection, so I used it to do some research on where to leave the yacht for few months while we fly back home to Canada. 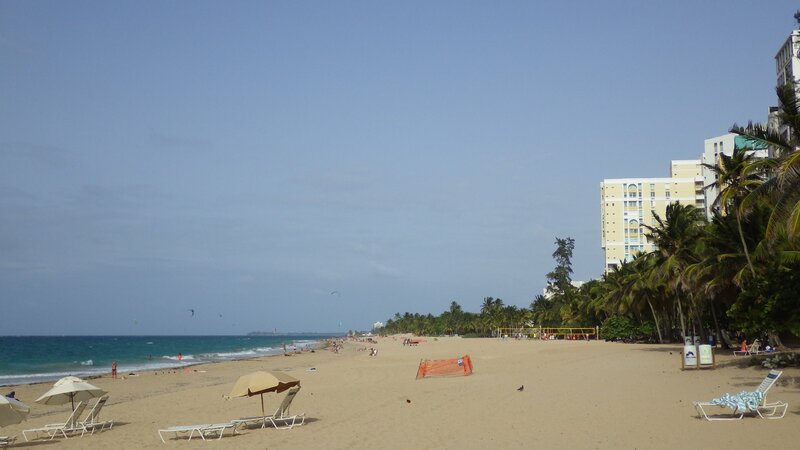 Apparently, the onshore storage places in PR are limited and are booked months ahead of time. 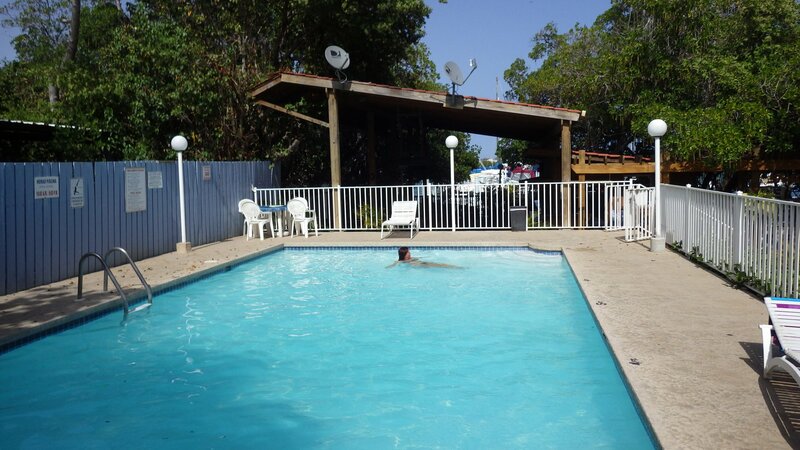 And not cheap either. 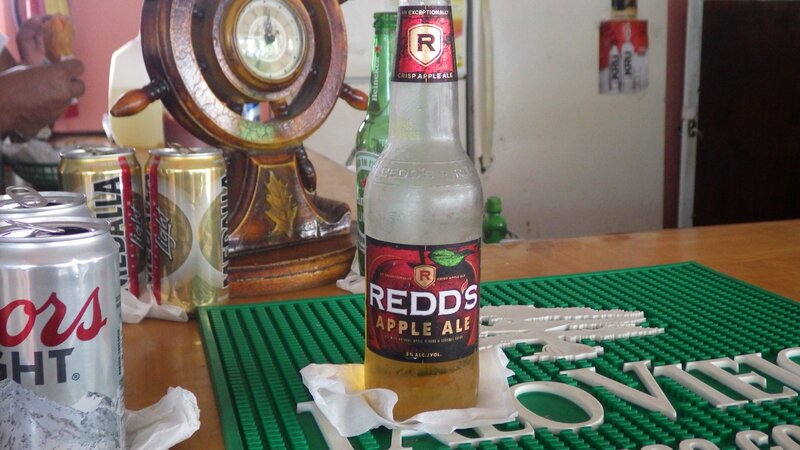 Spent some time looking for alternatives - not many. 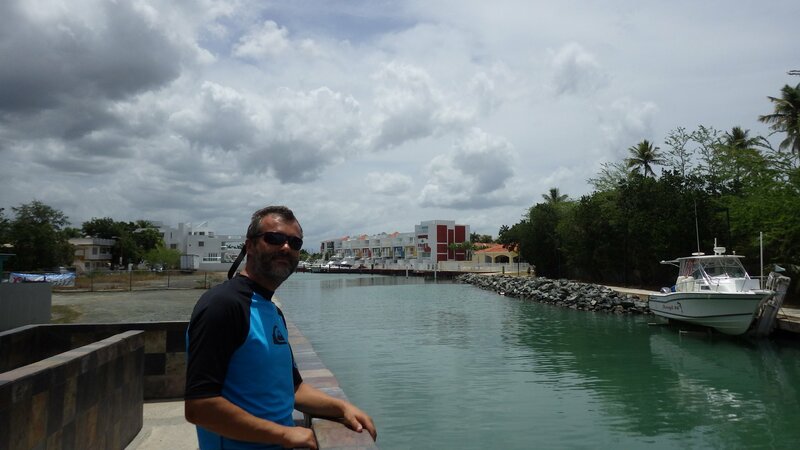 Decided to leave the yacht in the local Marina de Salinas (se the other post below). 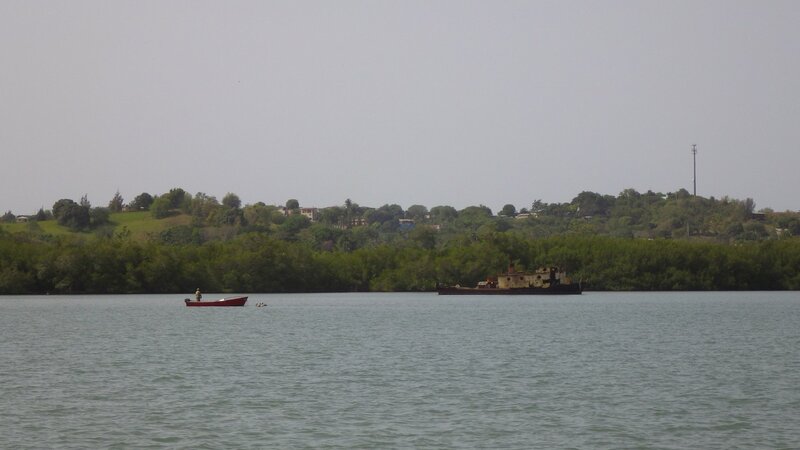 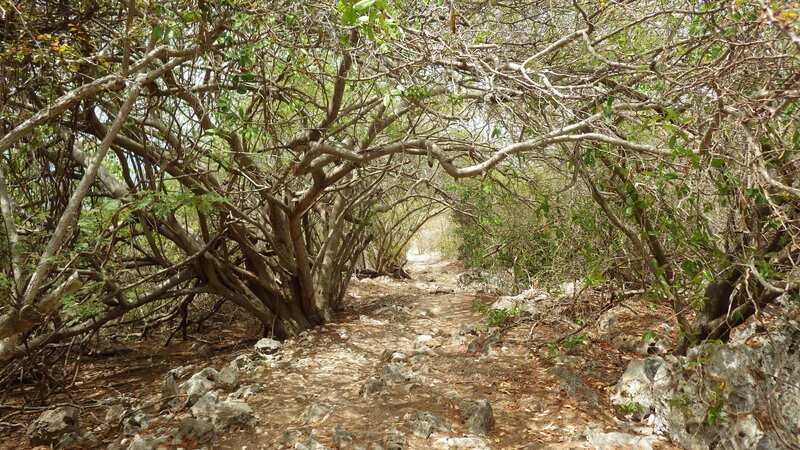 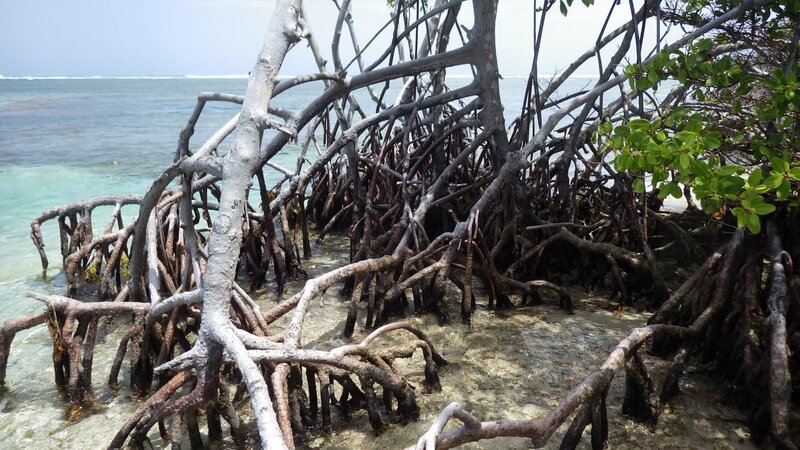 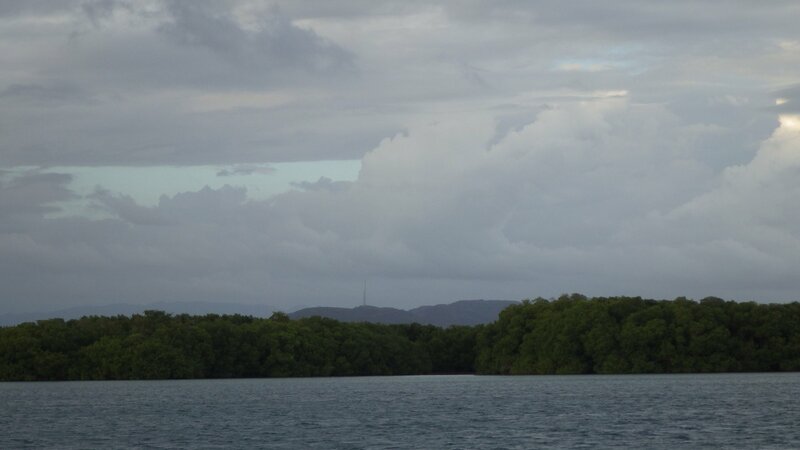 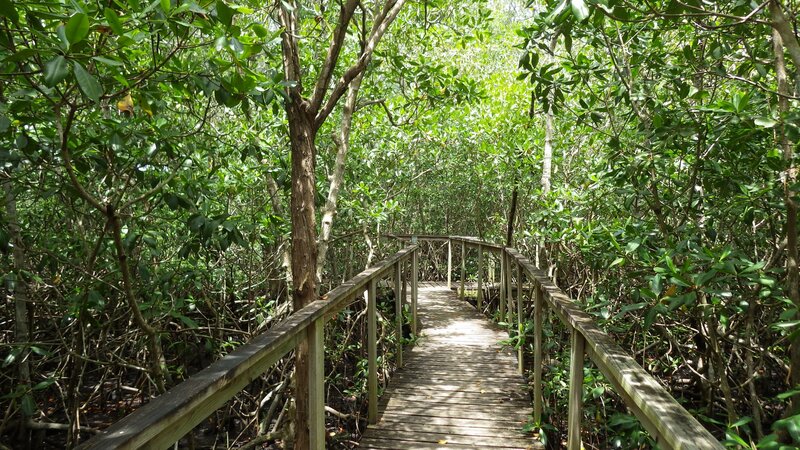 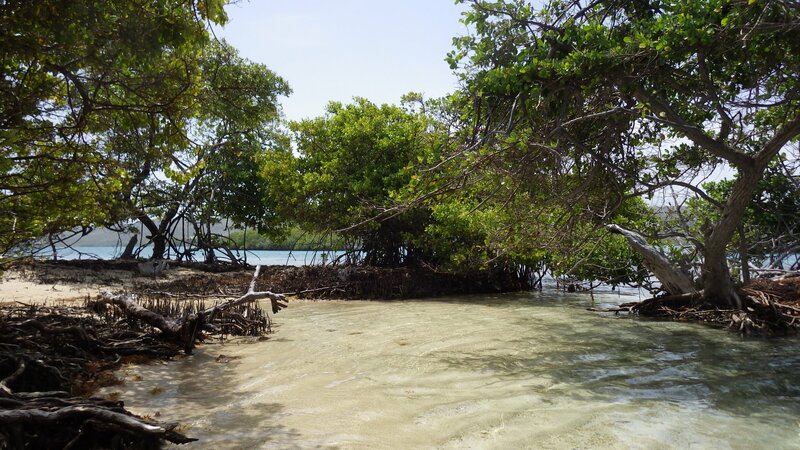 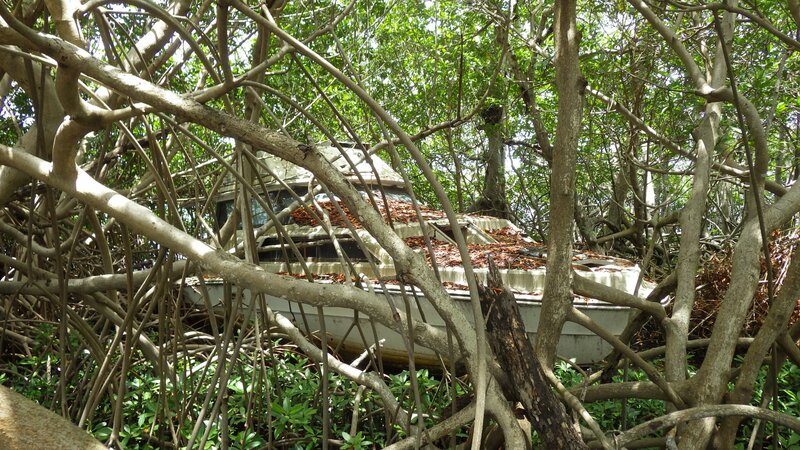 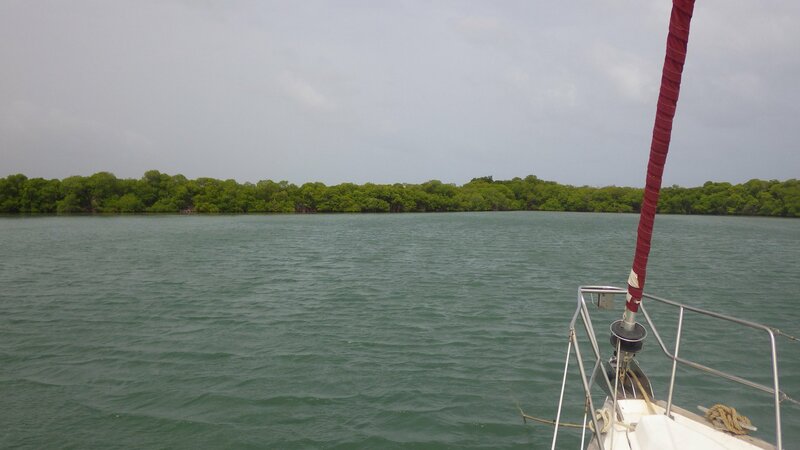 A small trip for a quiet day in the mangrove maze of Jobos. 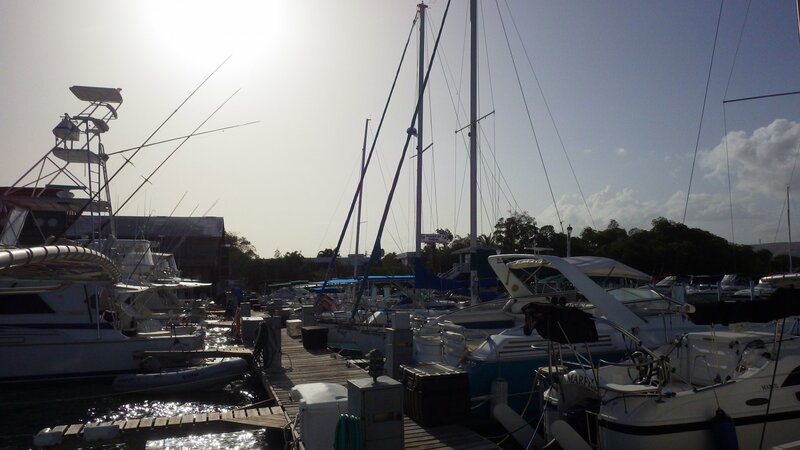 Did a little of yacht's bottom cleaning, afternoon nap, tanning, reading, listening music, etc. 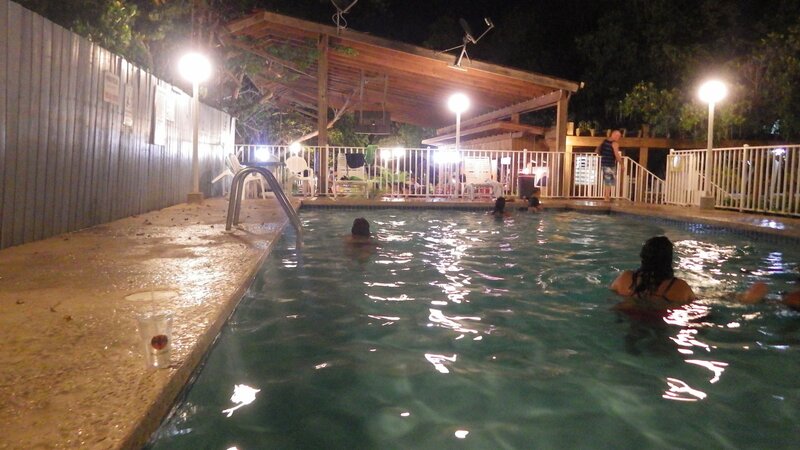 Just relaxed. 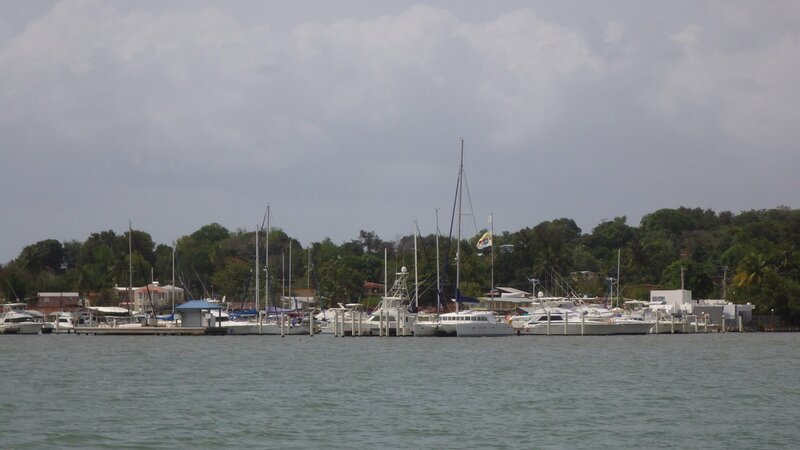 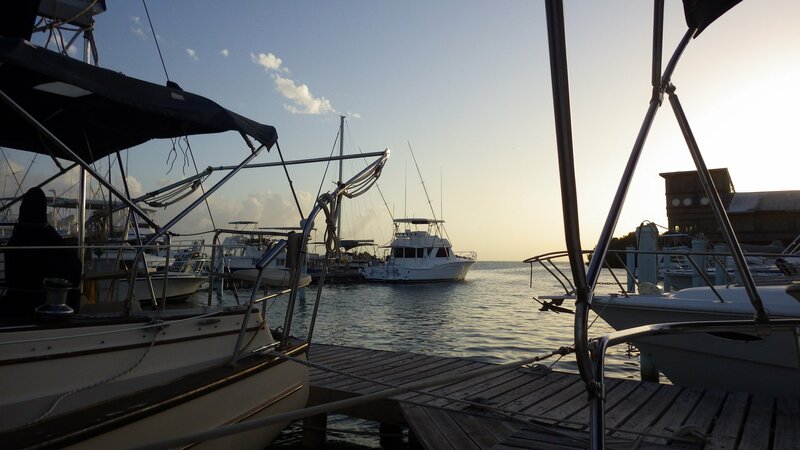 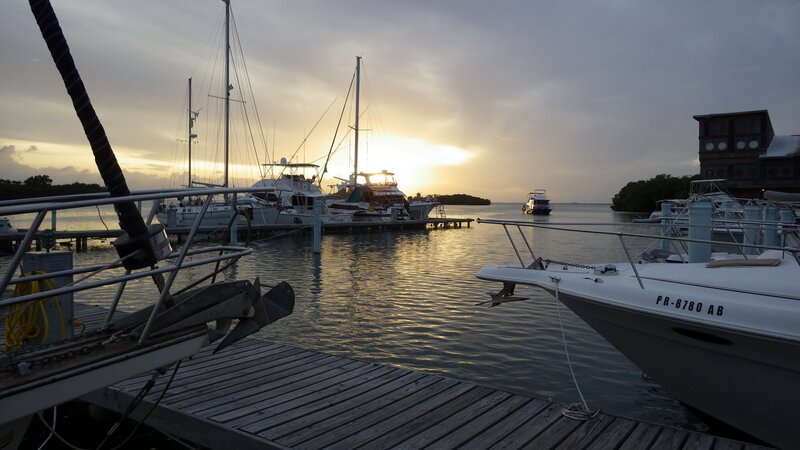 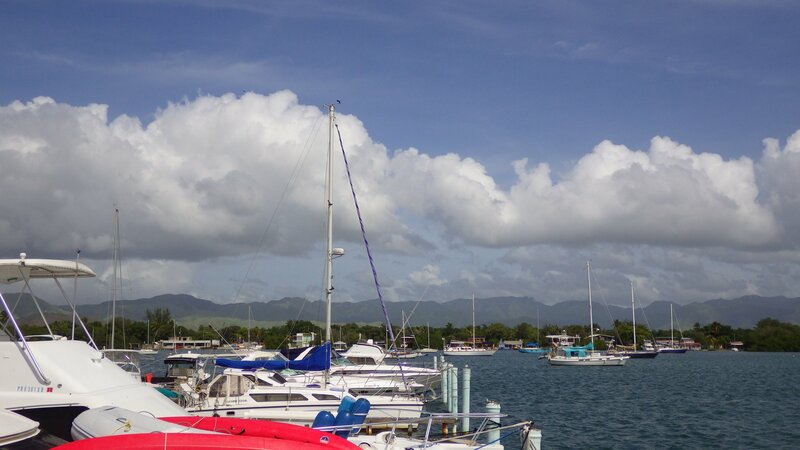 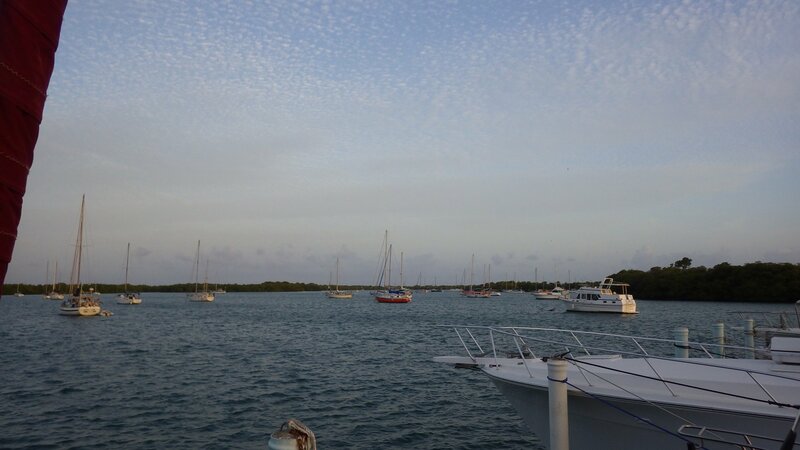 So we are staying at the Marina de Salinas, and will be leaving our yacht here for few months during the hurricane season, while fly home to Canada. 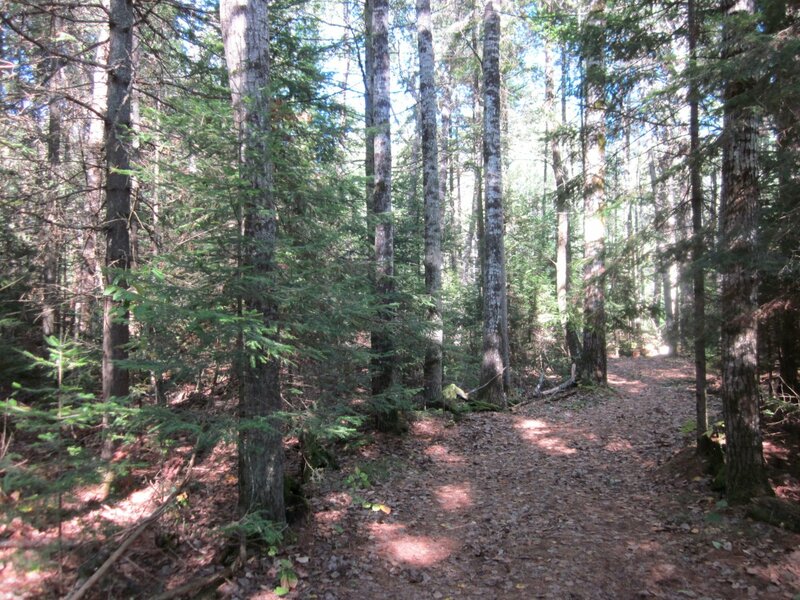 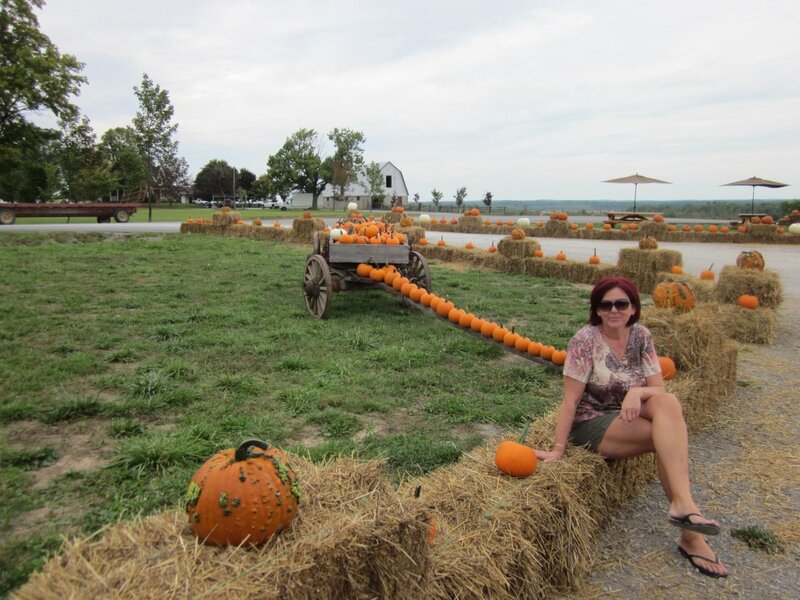 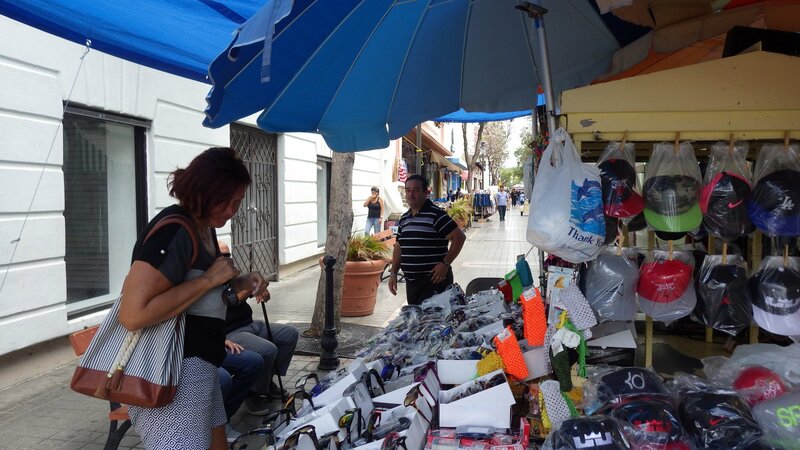 Rented a car � drove around to see the area, did some provisioning and shopping. 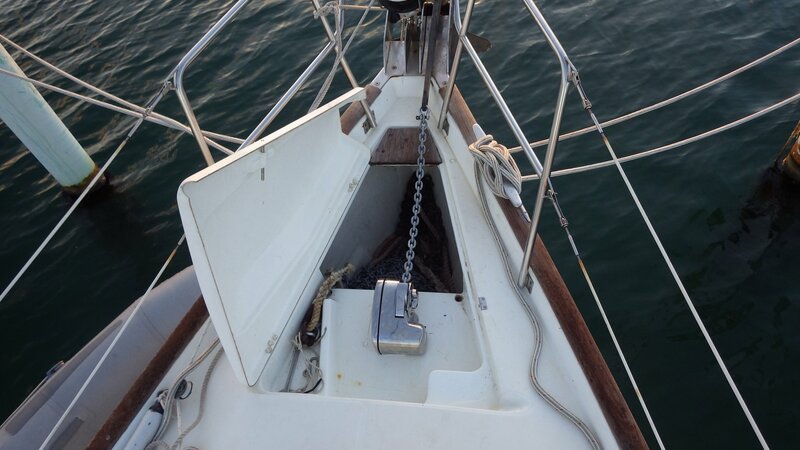 Also did quite few boat projects, mainly maintenance and upkeep. 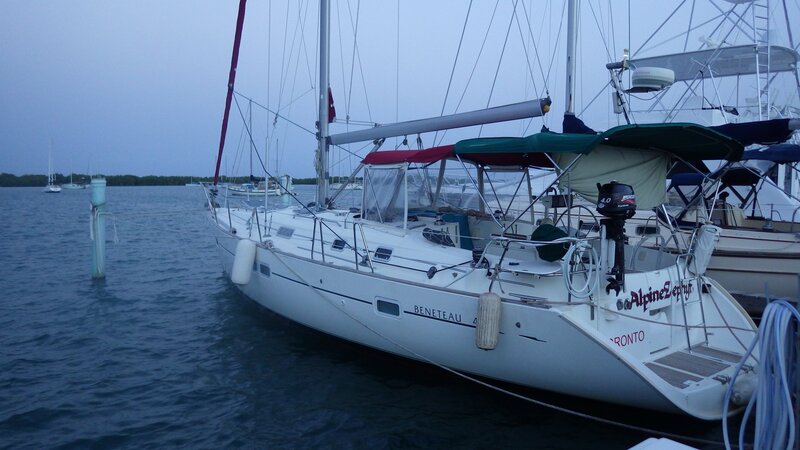 Preparing yacht for the long-term stay. 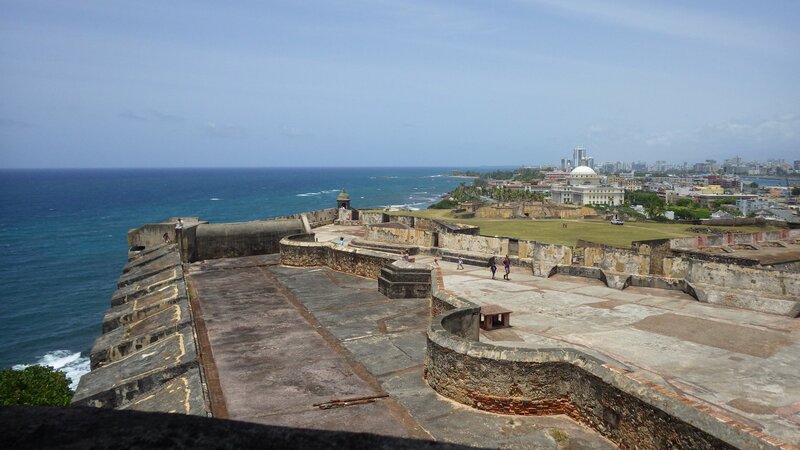 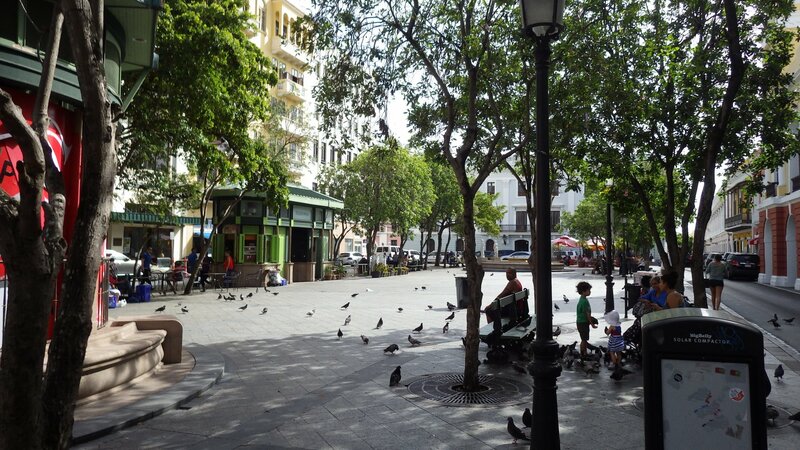 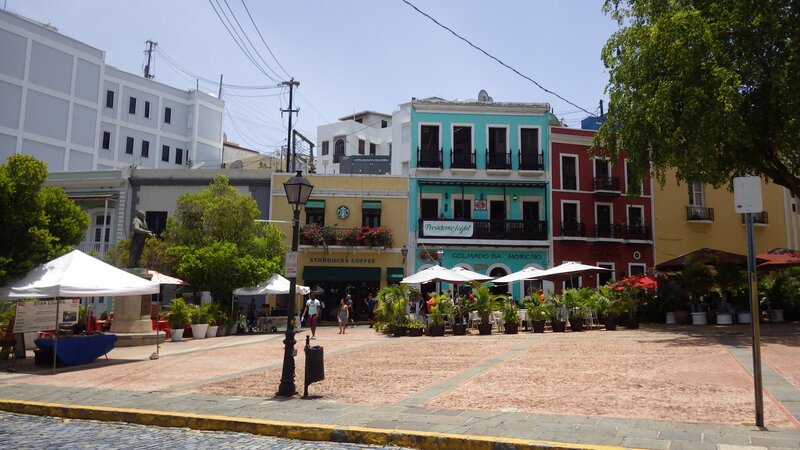 Our flight from Puerto Rico was from the San Juan airport, so we decided to take the opportunity and spend few days at this old city. 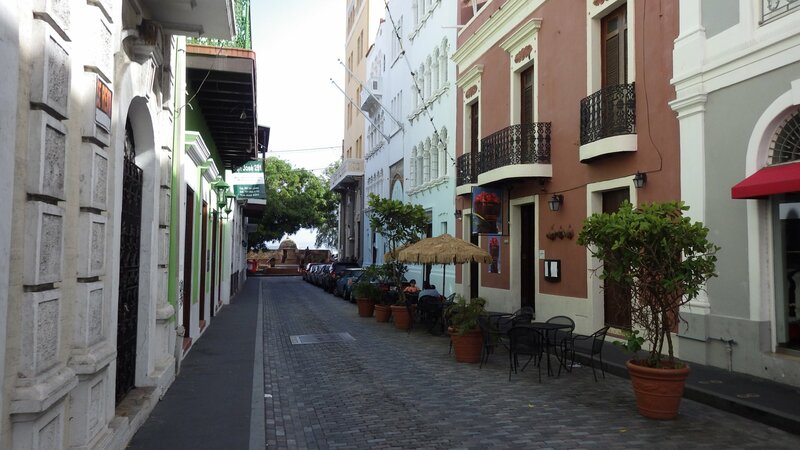 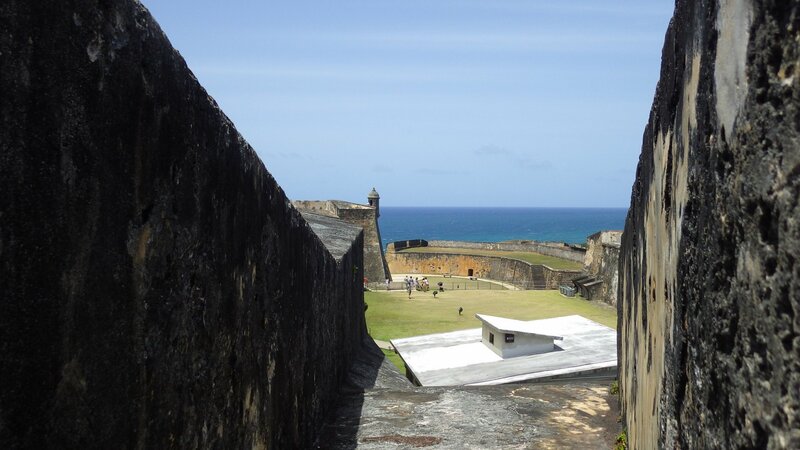 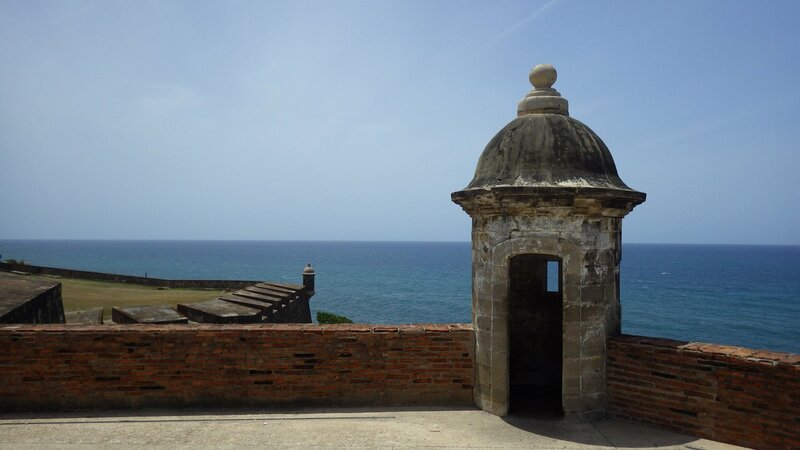 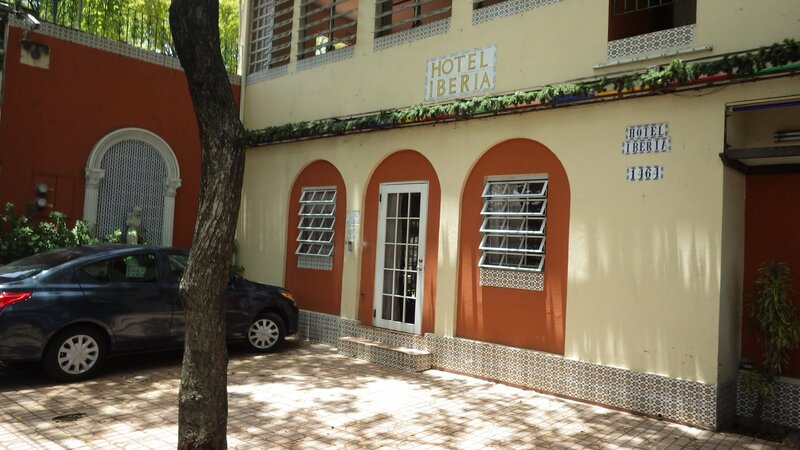 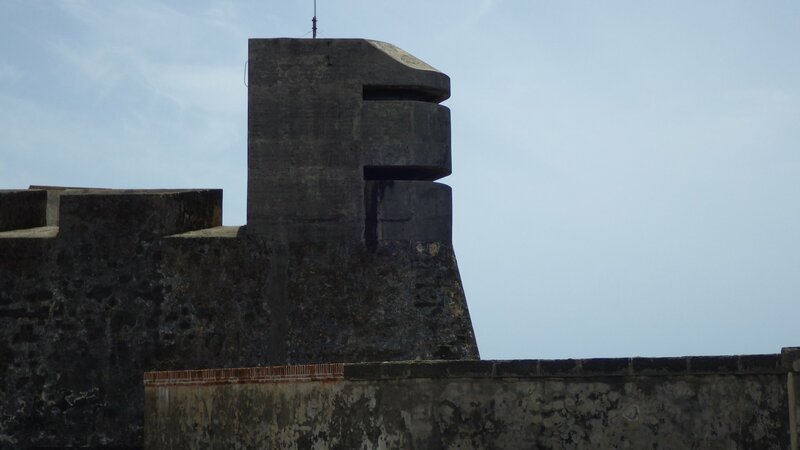 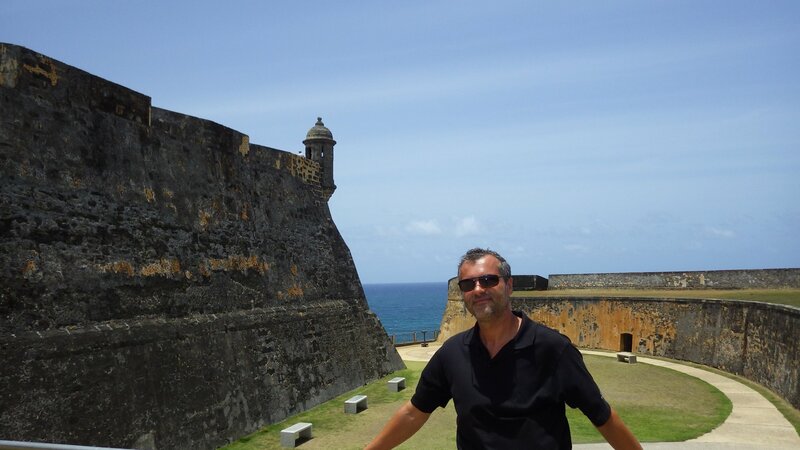 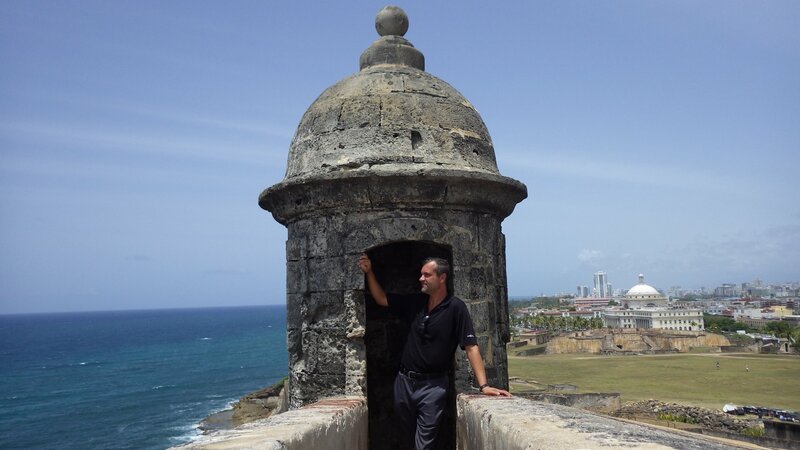 Rented a car and a hotel room and explored the Old San Juan. 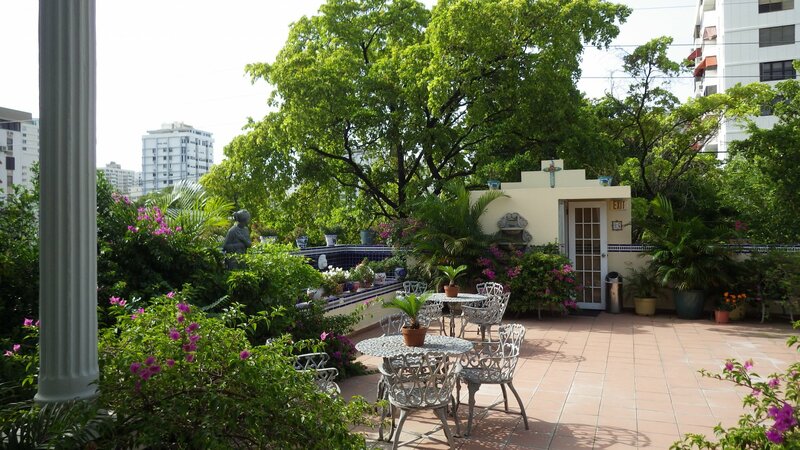 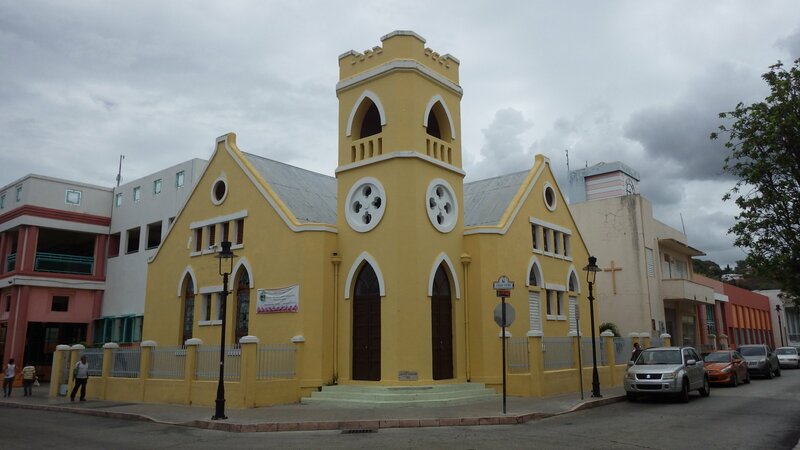 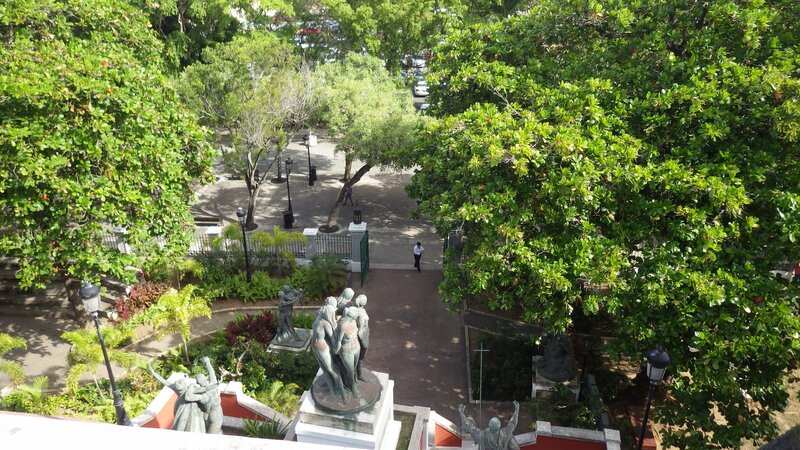 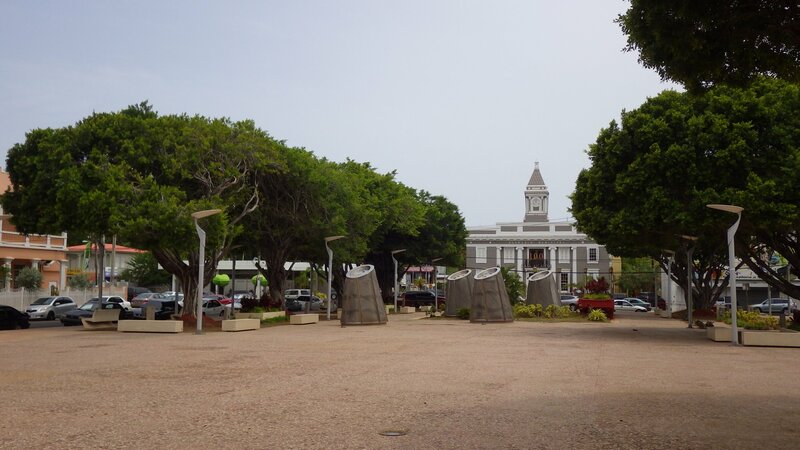 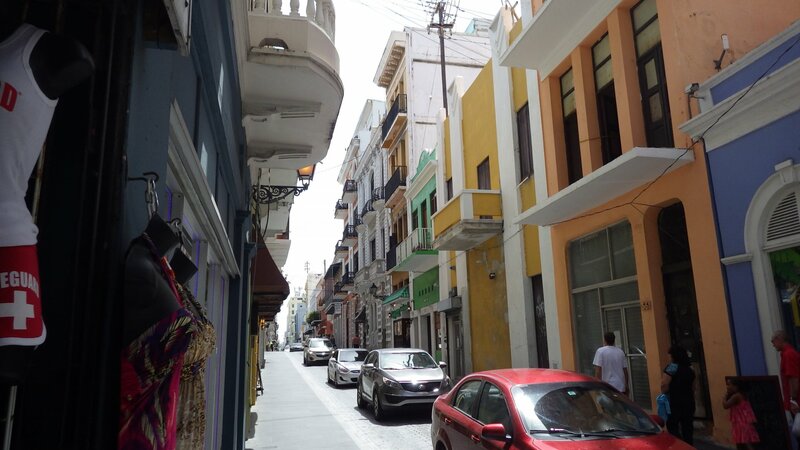 The old part definitely has the charm of the old European city � colonial architecture, narrow streets, pleasant parks and plazas, shops and restaurants, etc. 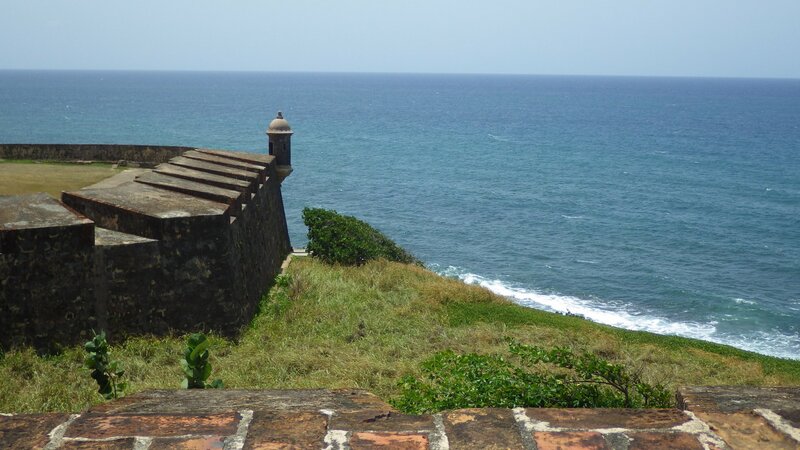 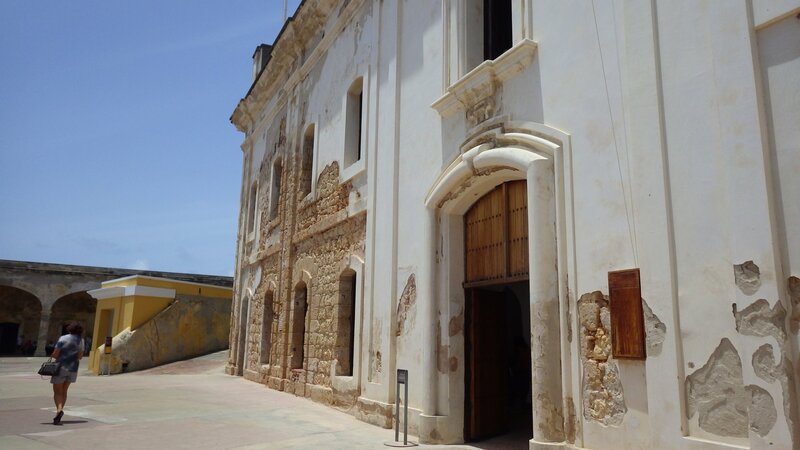 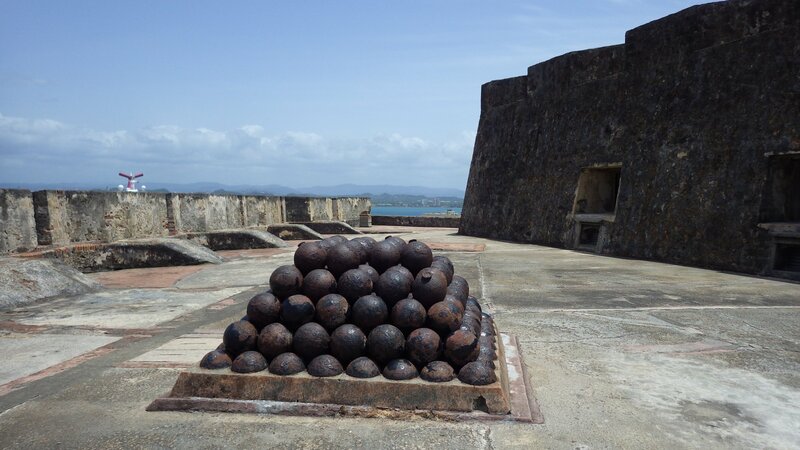 The San Cristobal Castle historical site was also well worth the visit. 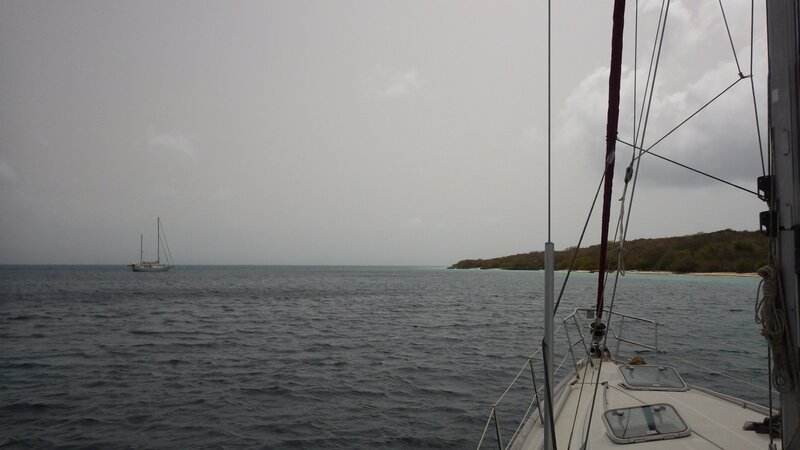 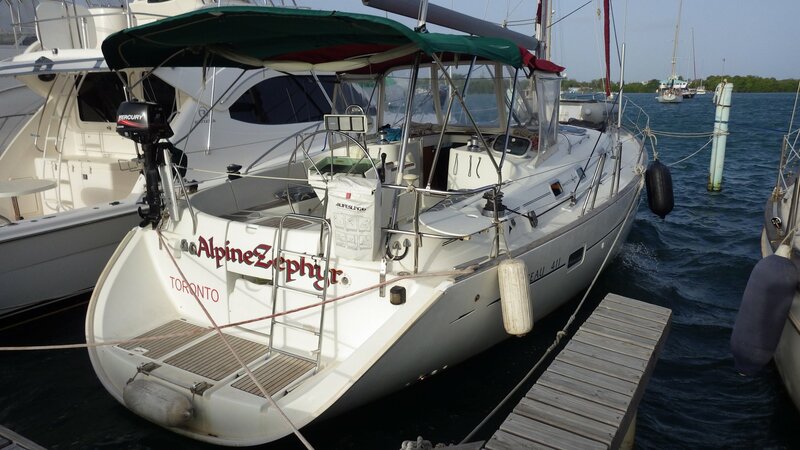 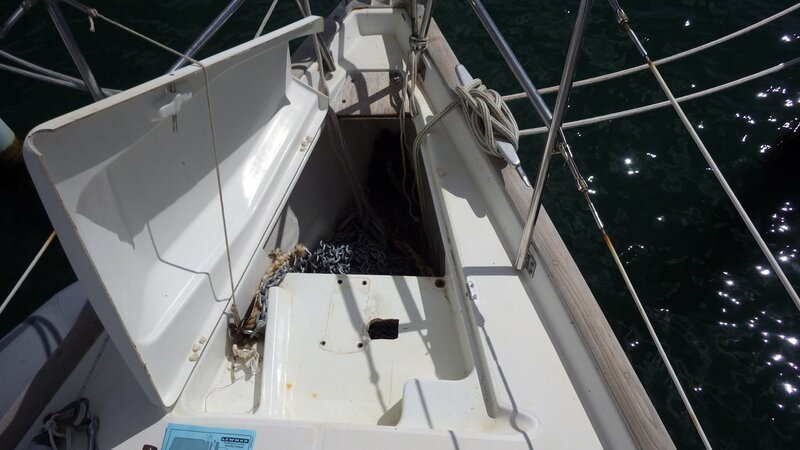 It's the hurricane season in the tropics, and we are back at home in Canada for few months, while our yacht is at the "hurricane hole" slip in Puerto Rico. 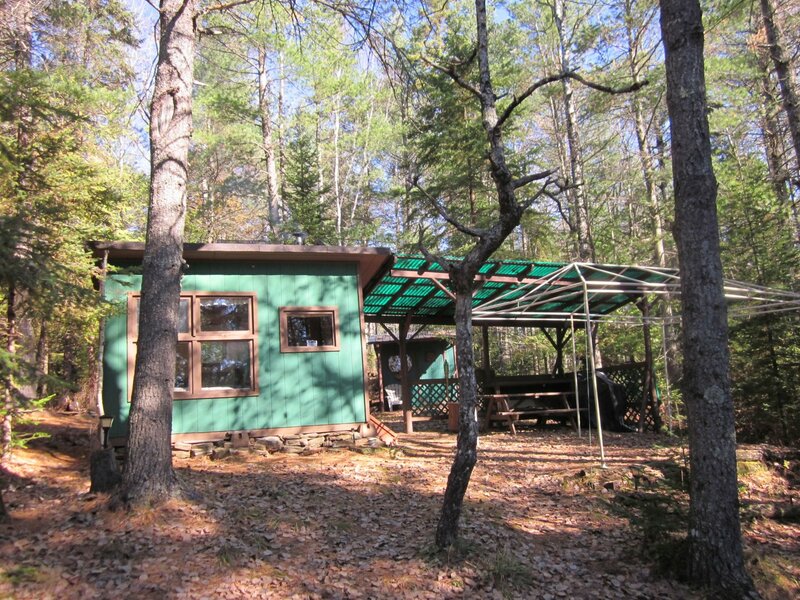 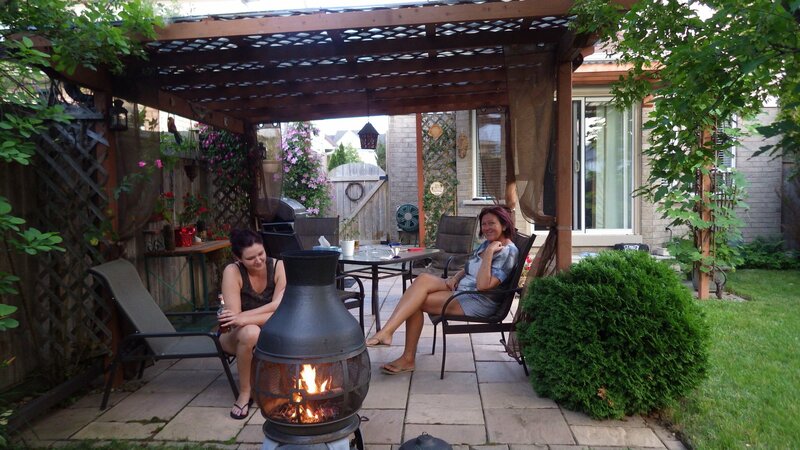 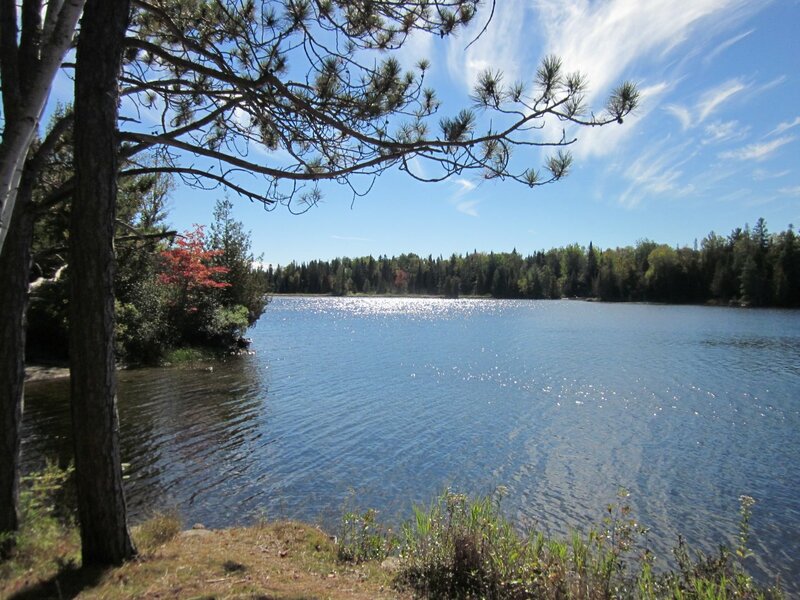 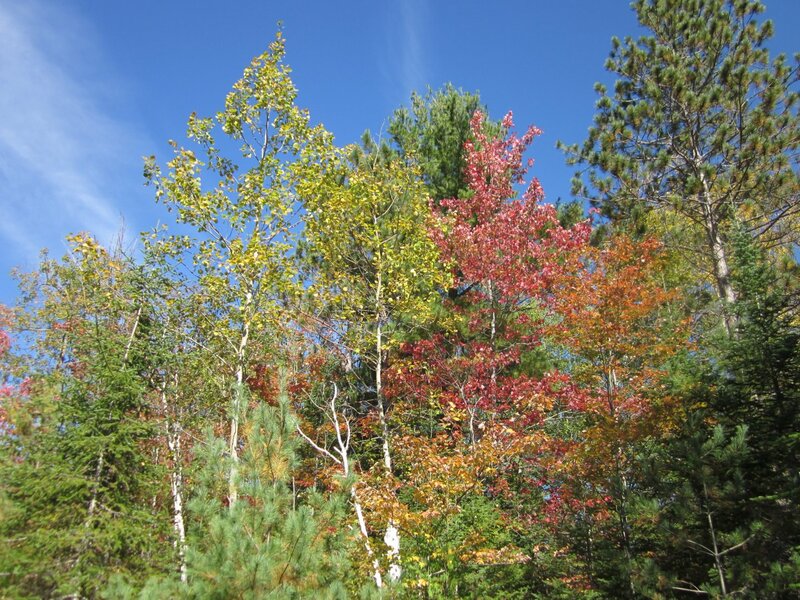 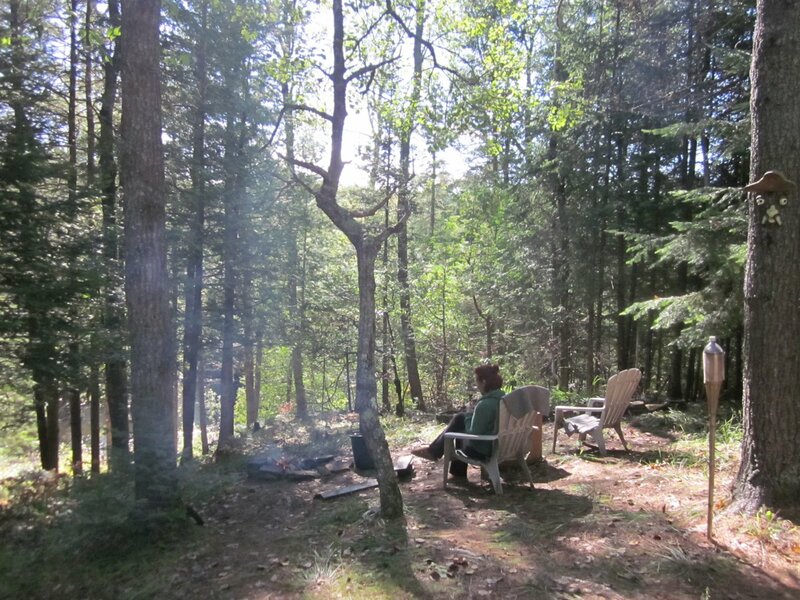 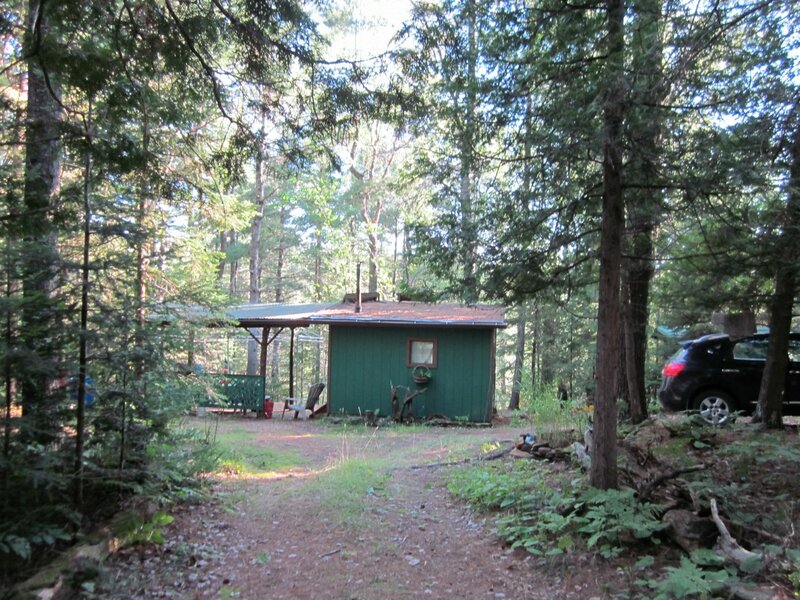 Reunited with our daughter, met with friends, visited our cabin in the woods, worked on some projects, and just enjoyed those few months of nice weather in Canada. 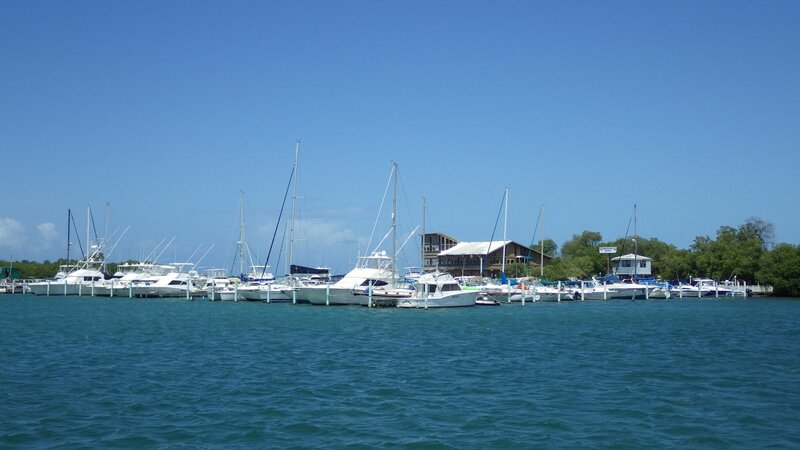 Staying at the marina slip for couple weeks, while preparing our yacht for the next season of cruising. 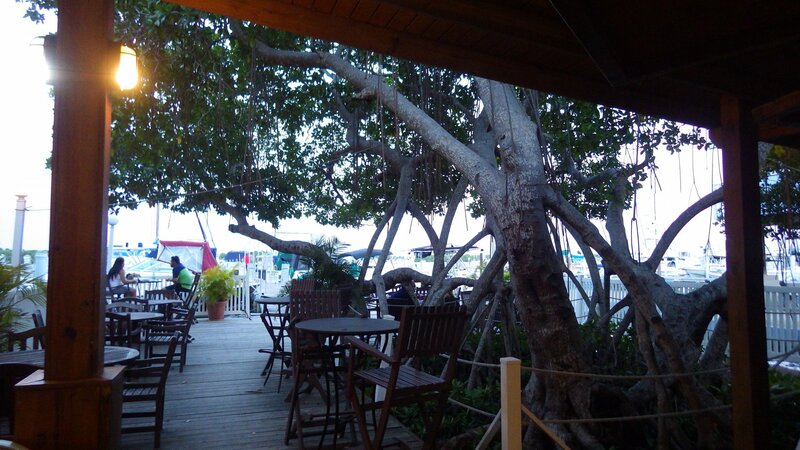 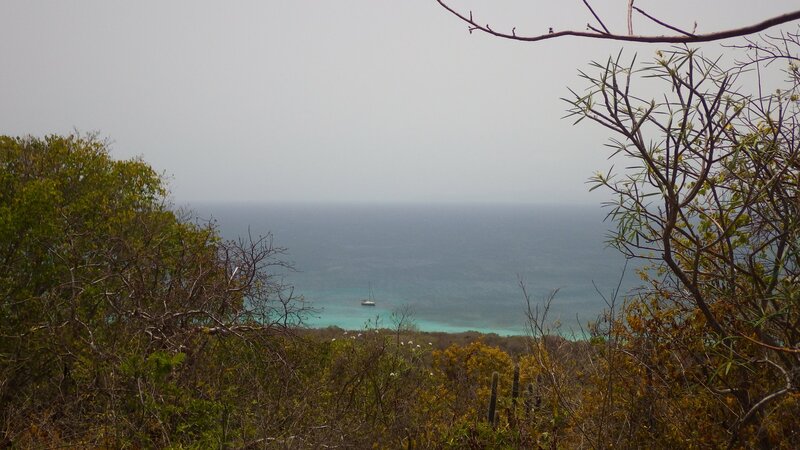 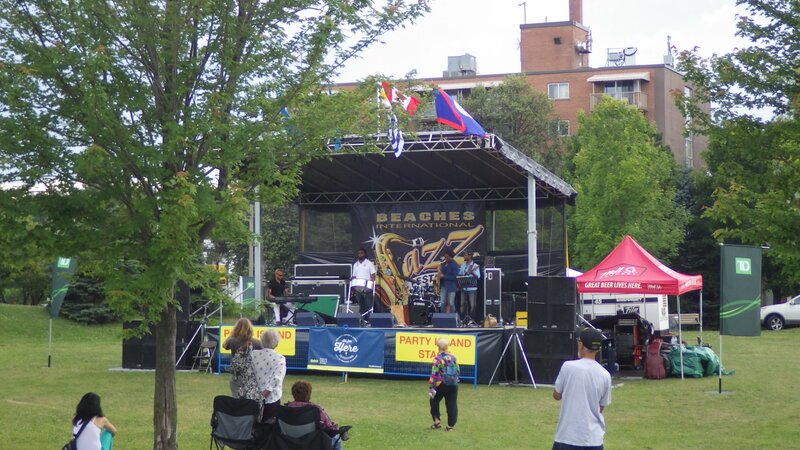 Temperature is 30 �C with light breeze. 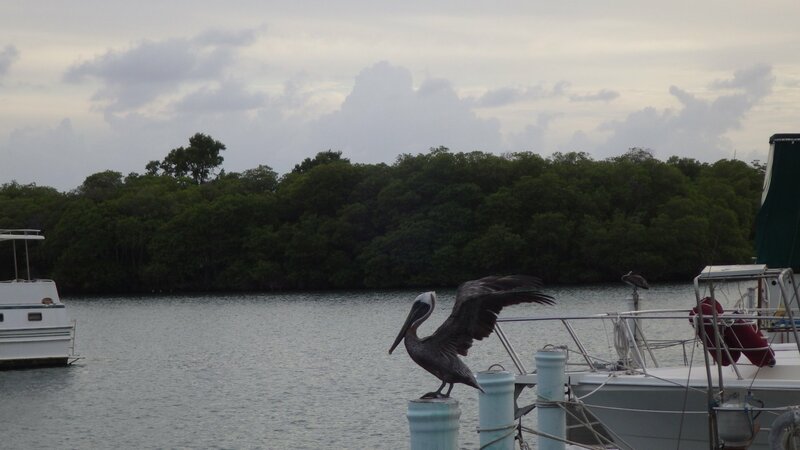 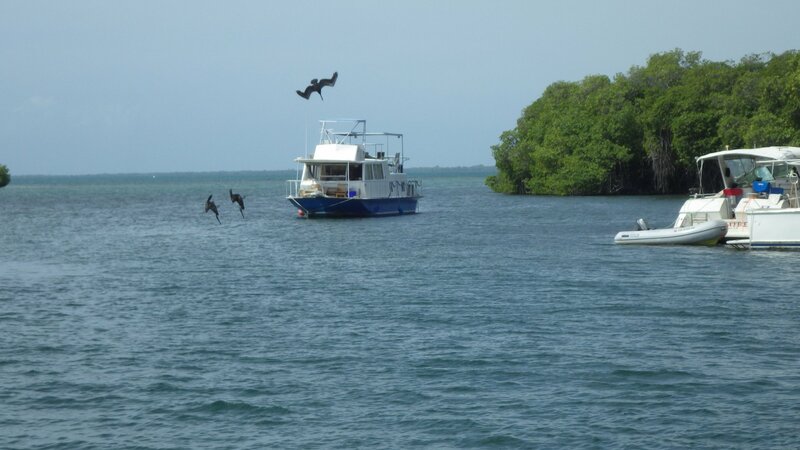 Watching pelicans diving for fish. 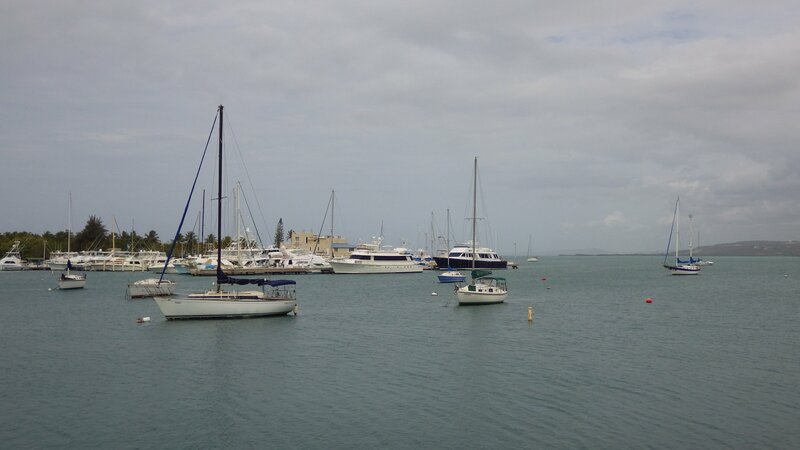 Again rented a car for the day to get some marine supplies from San Juan. 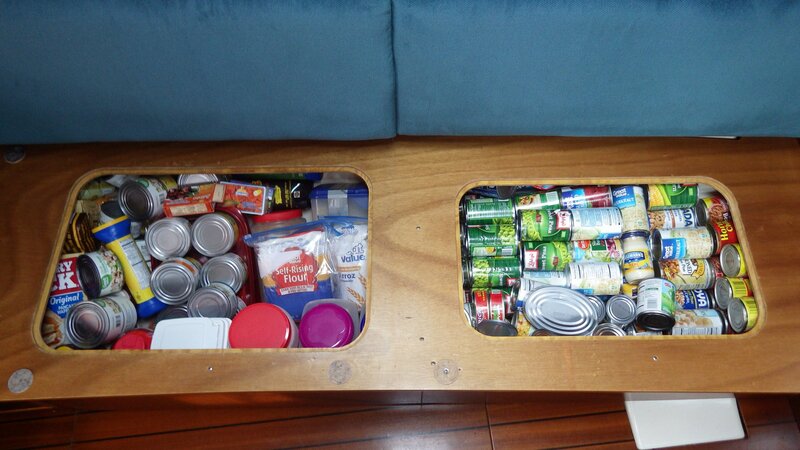 Cleaned the bottom, did extensive provisioning. 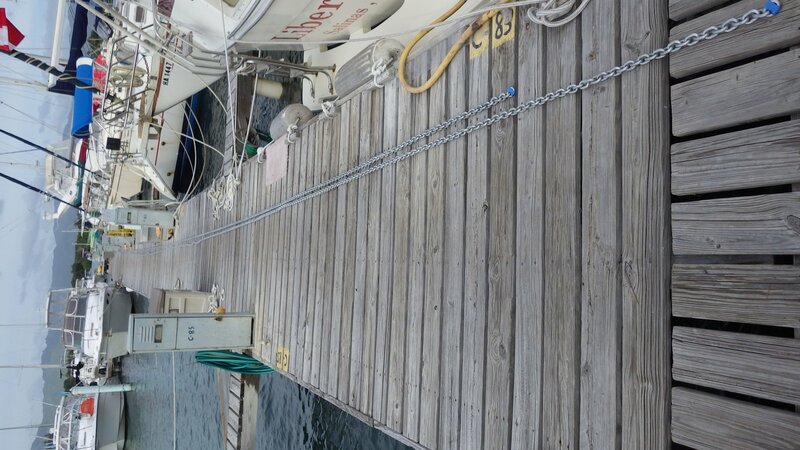 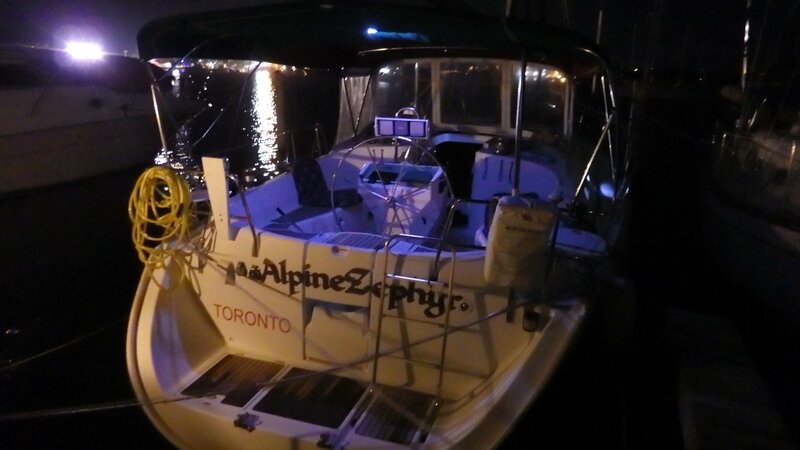 Wished to stay more, but our prepaid time at the marina is ending and we should catch the next suitable weather window for going further East and South. 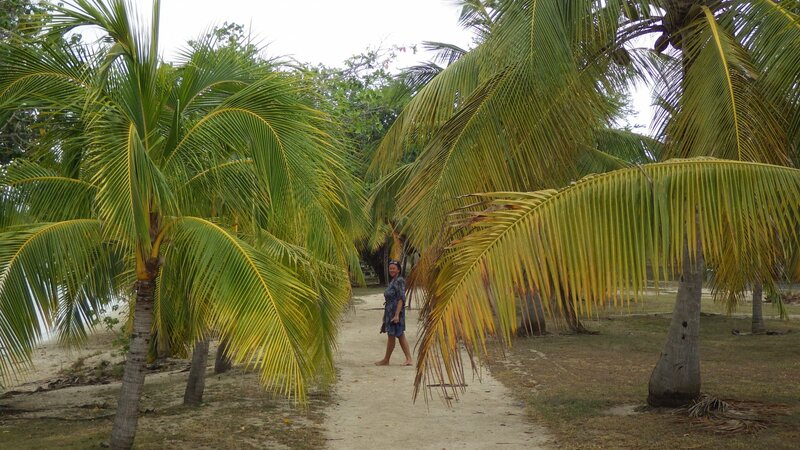 Time to explore new places! 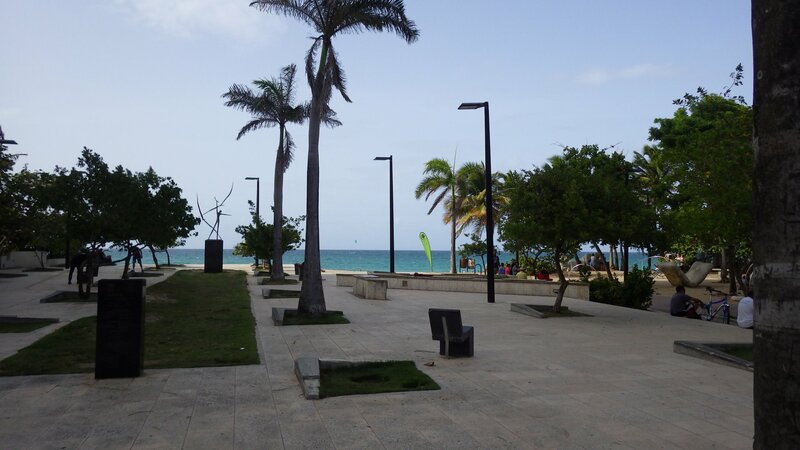 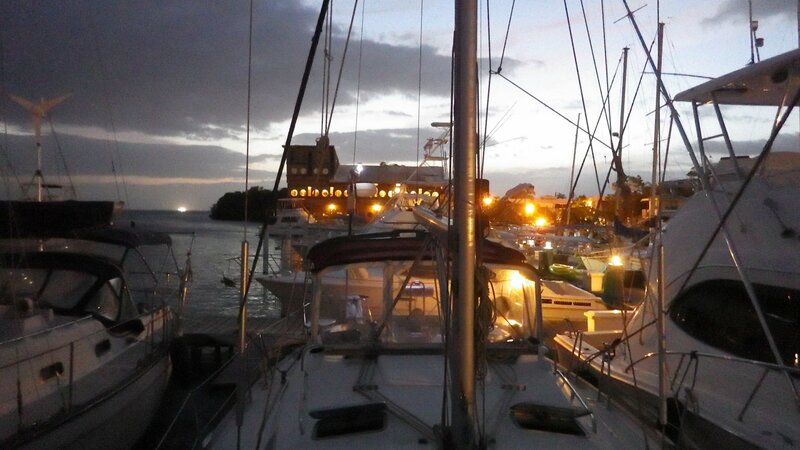 This was our last overnight stop at Puerto Rico main Island. 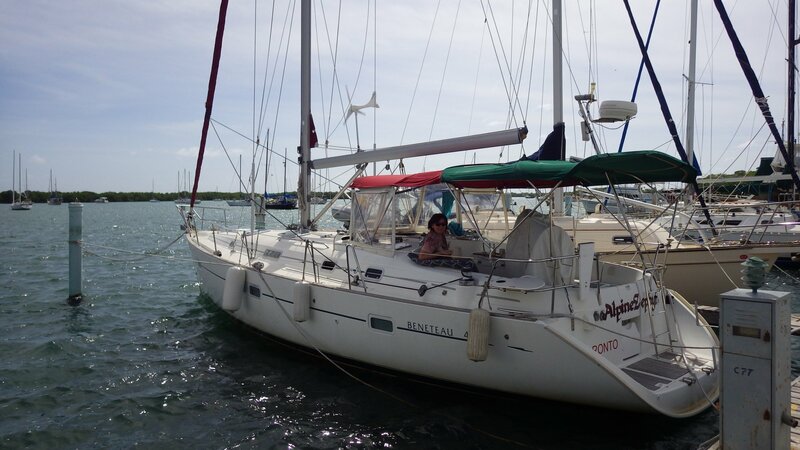 The anchorage is pretty but rolly, we did not go ashore. 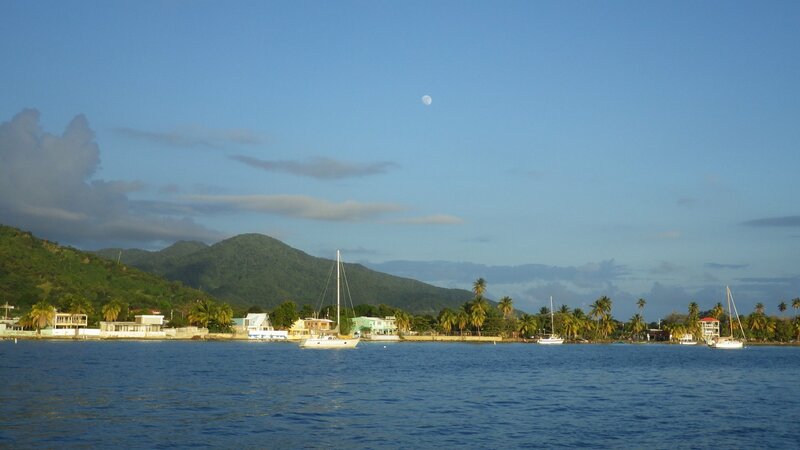 Next stop - Spanish Virgin Islands.